The dozens of photos on this page were all sent in by Dale Thomas. Some of them are simple paint conversions, but others have head swaps and some have partial body swaps. Dale carried out the conversions between 1997 and 2001, so some would not be necessary now, because the troop types are now produced by actual manufacturers. 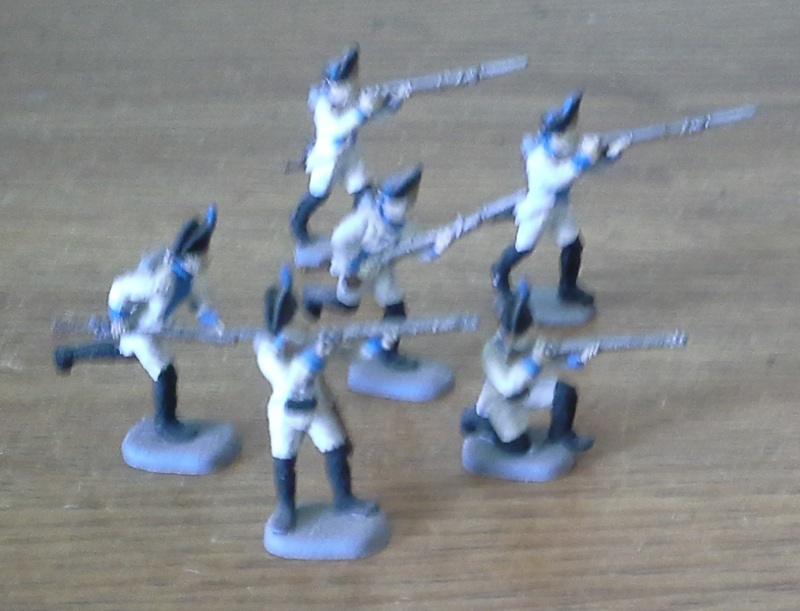 As reference, amongst others, Dale used the Osprey Men at Arms series, Knötel's work and the Histofig site. 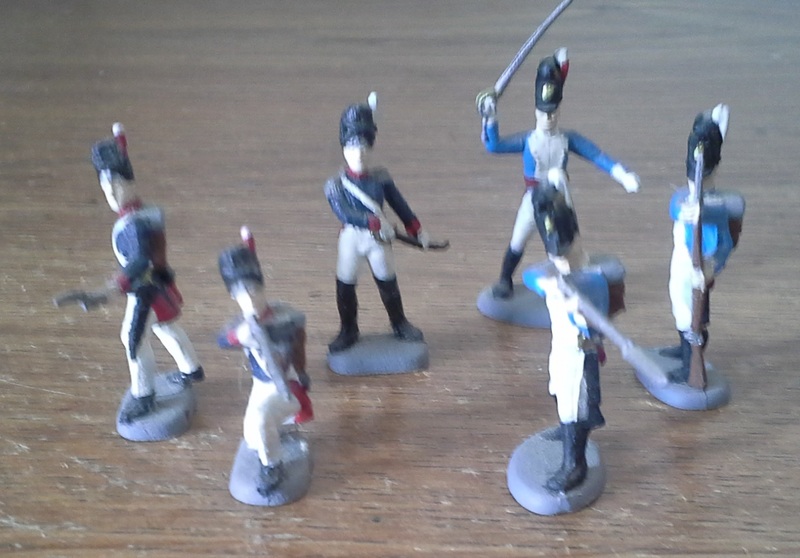 Duchy of Berg Line Infantry and Grenadiers, converted from Airfix 1744 "Waterloo French Infantry" and 1749 "Waterloo French Imperial Guard". 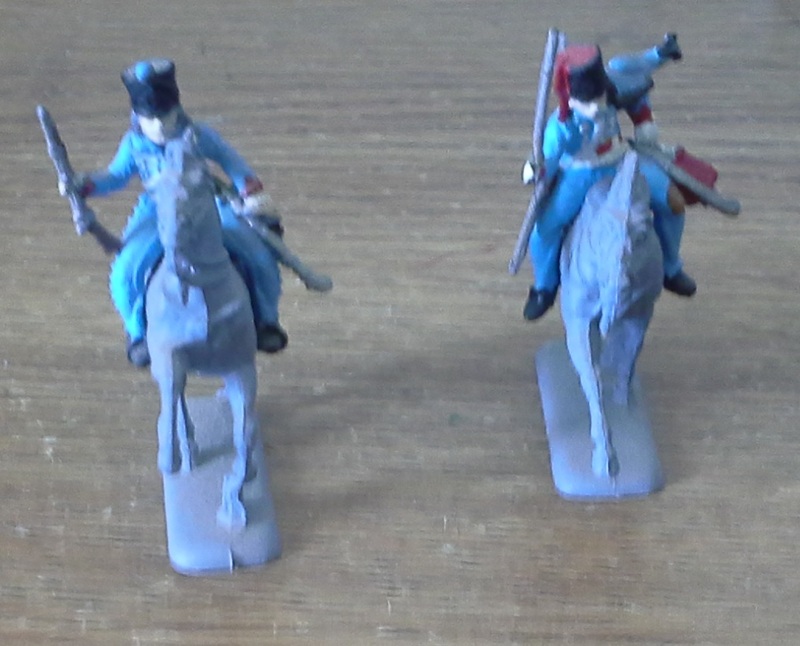 Chevau-legers du Grand-Duché de Berg, conversion is possible from Strelets 015 "Russian Uhlans", heads with black shakos from Italeri 6002 "French Infantry", and on horses from Esci 218 "Polish Lancer French Cavalry". 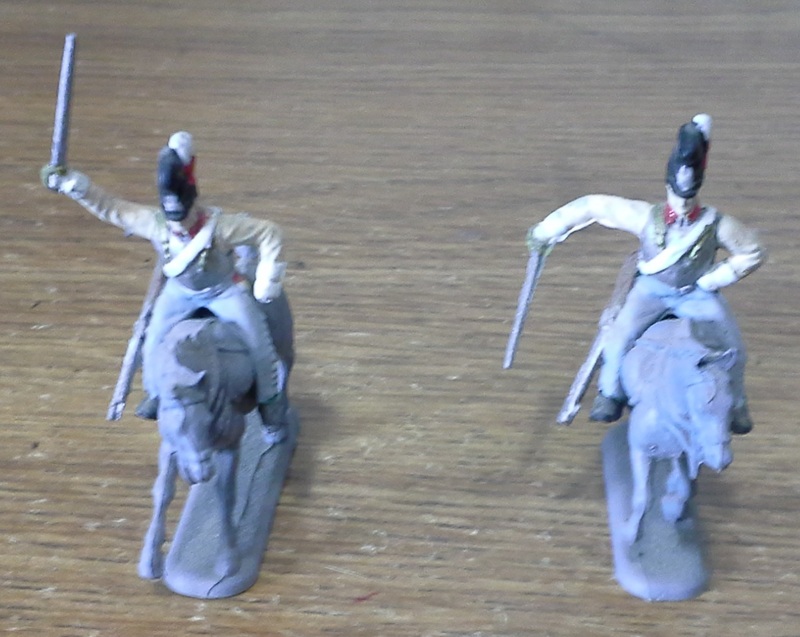 The elite unit would have heads from Esci 230 "British Light Dragoons", for 1808-09. 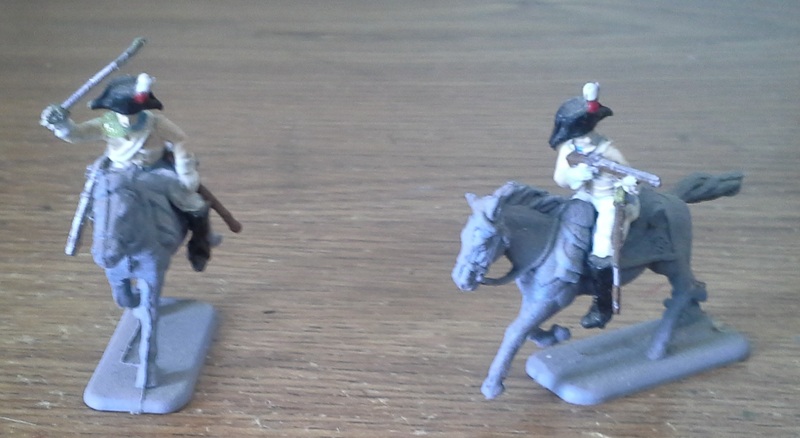 Lanciers du Grand-Duché de Berg 1809-12, converted from Esci 218 "Polish Lancers French Cavalry" with heads from Italeri 6002 "French Infantry". 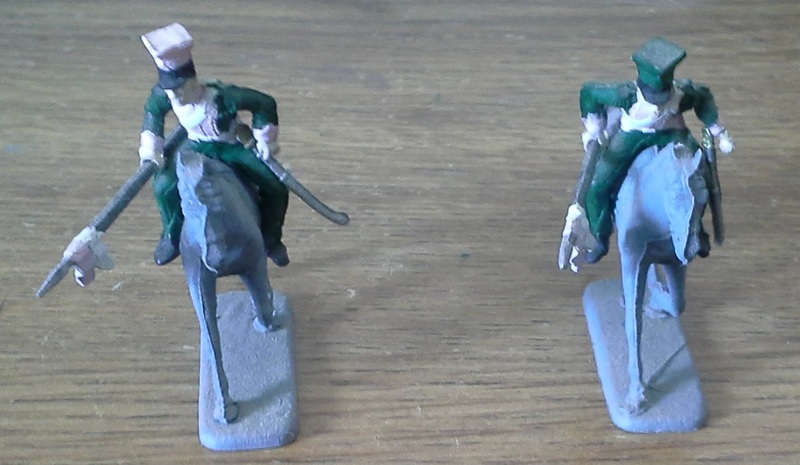 The elite unit would have heads from Esci 230 "British Light Dragoons"
Duchy of Berg Chevau-legers Lanciers 1812, converted from Esci 218 "Polish Lancers French Cavalry". 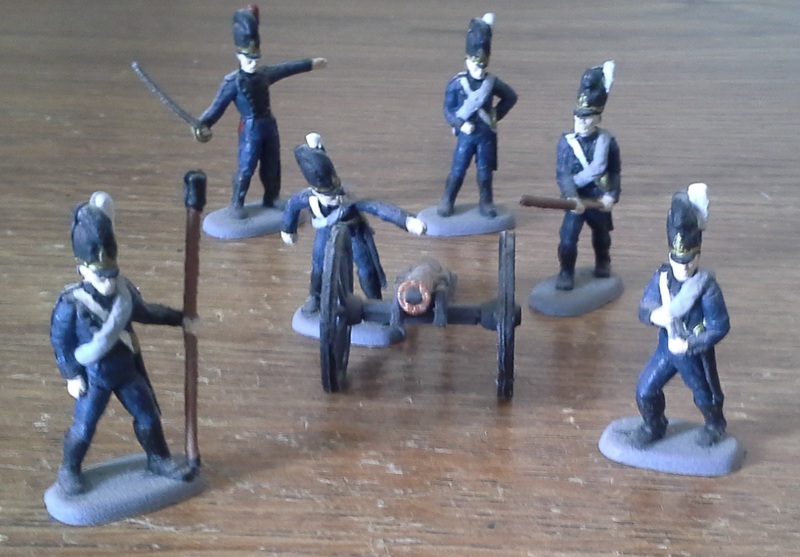 The elite unit would have heads from Esci 230 "British Light Dragoons"
Duchy of Berg Artillery 1812, converted from Airfix 1737 "Waterloo French Artillery". 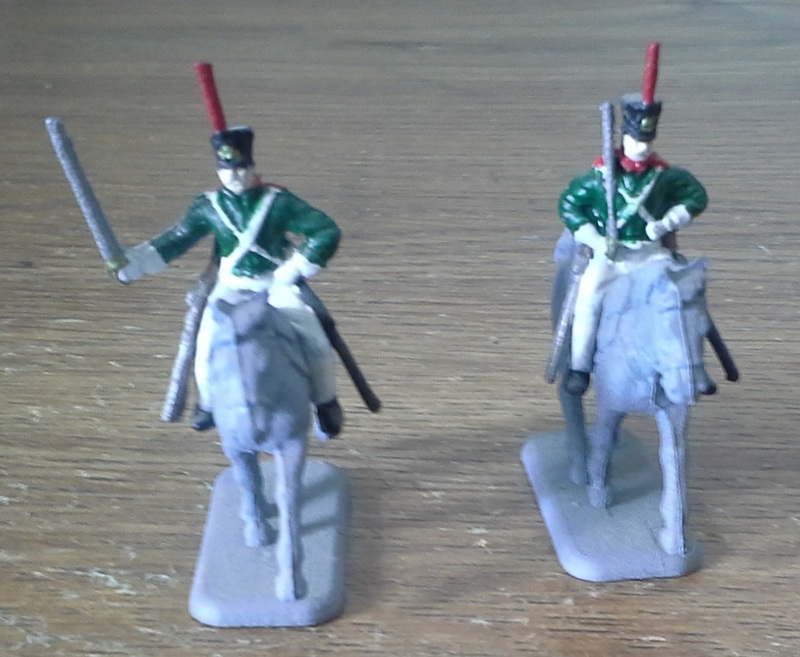 French Dragoons à pied, converted from Italeri 6002 "French Infantry" with heads from HaT 8033 "British Heavy Dragoons". 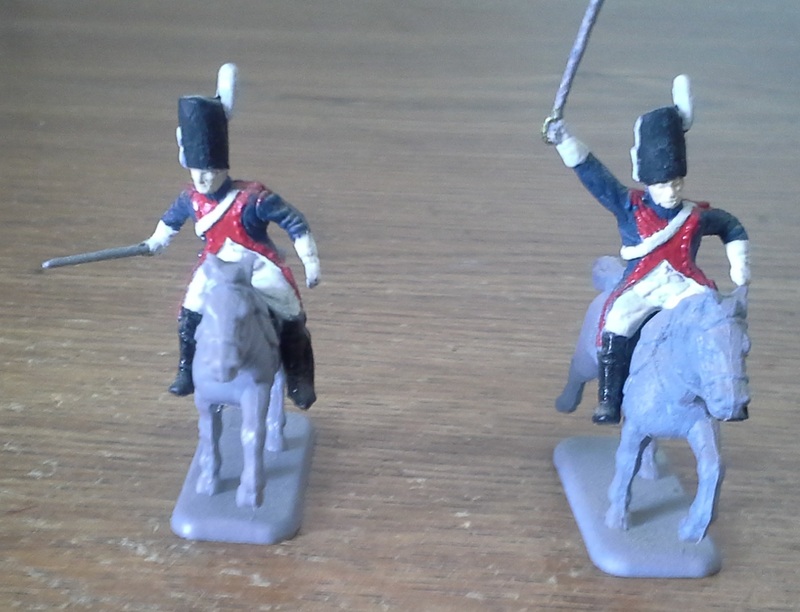 The elite unit for 1803-1806 could also be made by using HaT 8013 "French Horse Grenadiers". 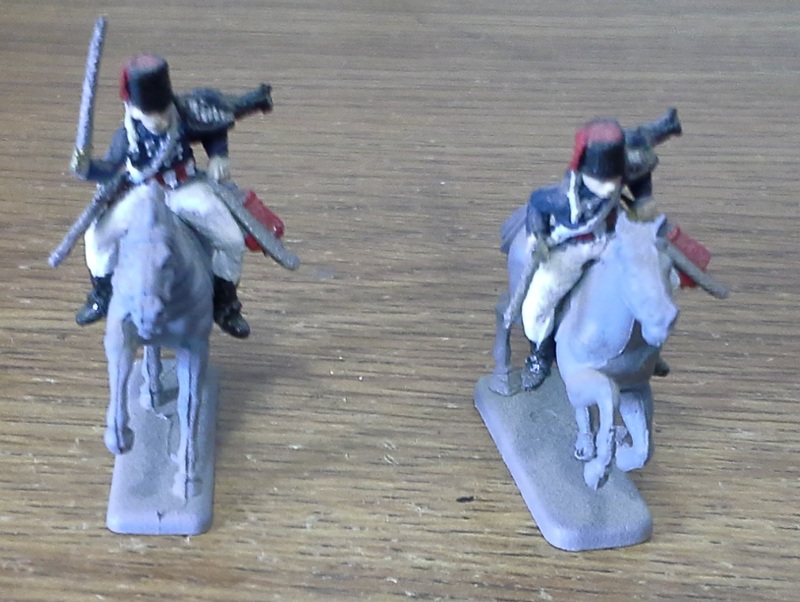 French Line Dragoons is just a paint conversion to show different units, converted from HaT 8009 "French Dragoons". 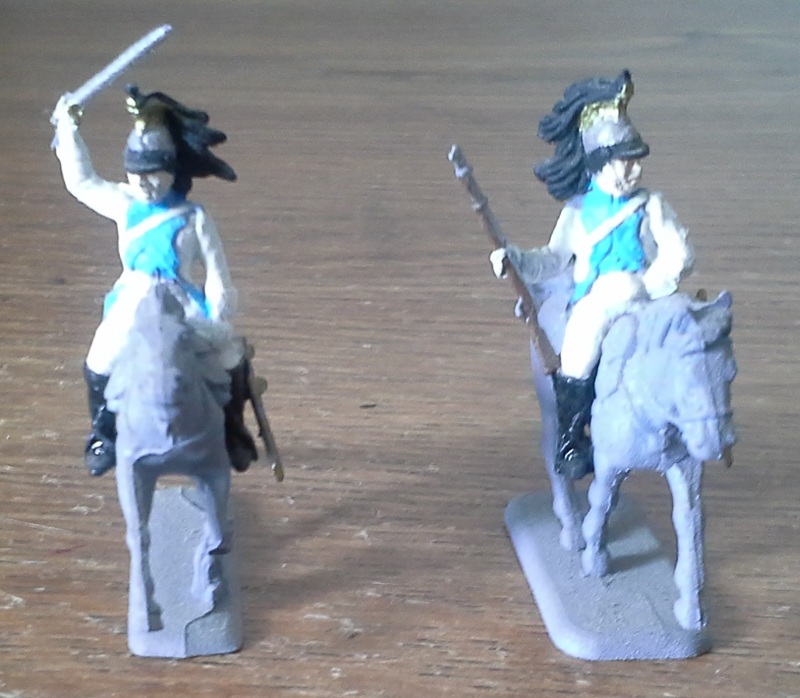 French Elite Dragoons, converted from HaT 8013 "French Horse Grenadiers". 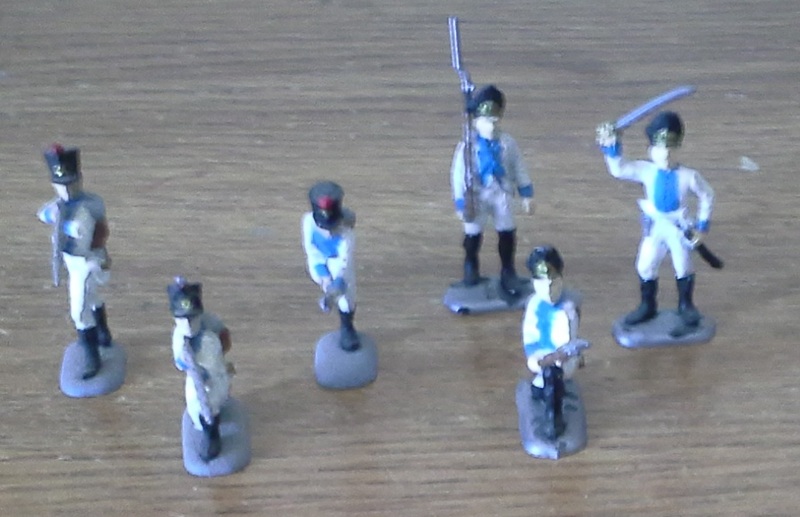 French Line and Elite Hussars, 1805-07. 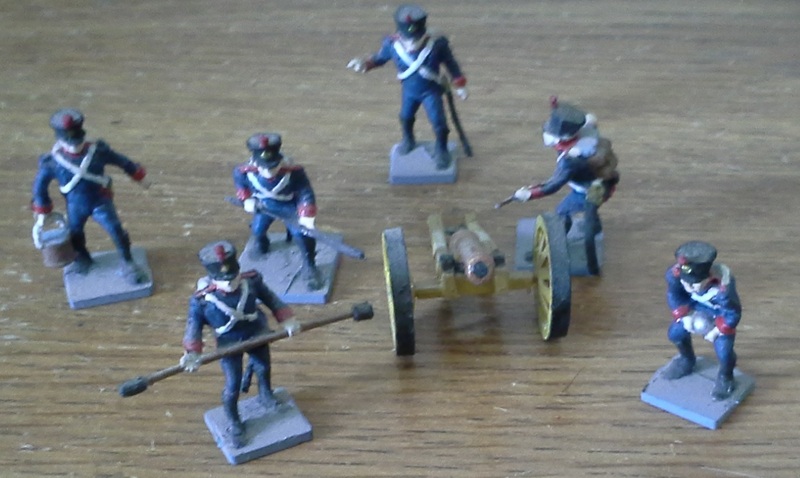 Line are Italeri 6008 "French Hussars". 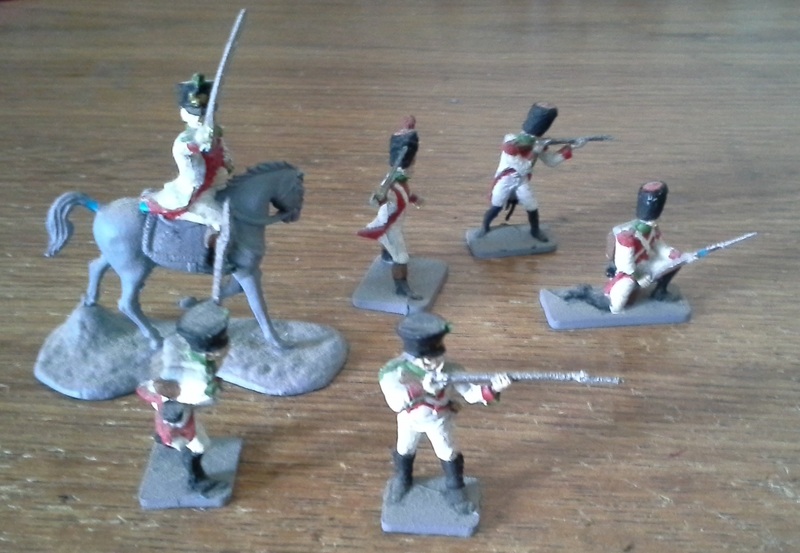 Elite unit are converted from Esci 230 "British Light Dragoons". 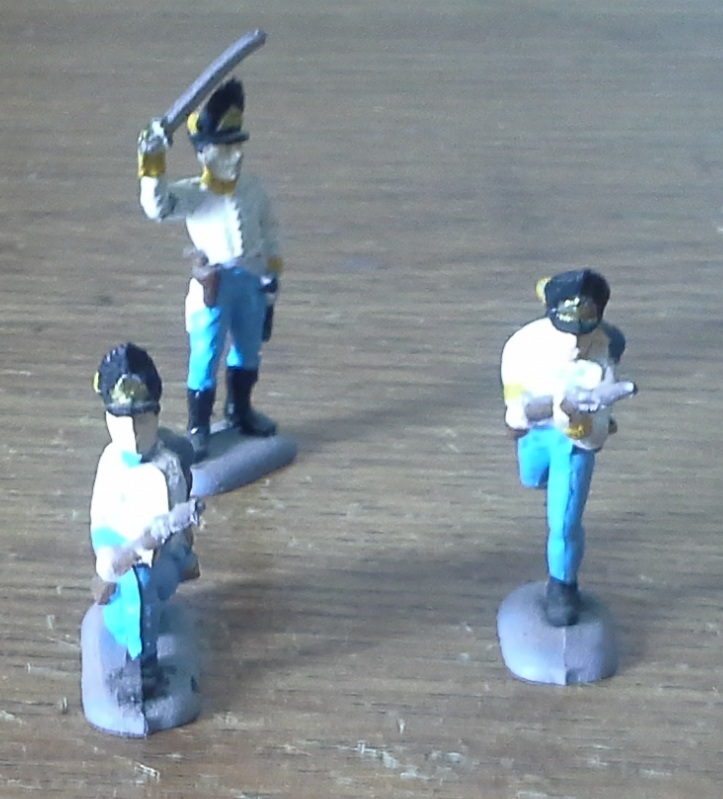 Nassau line infantry, converted from HaT 8028 "Bavarian Infantry". 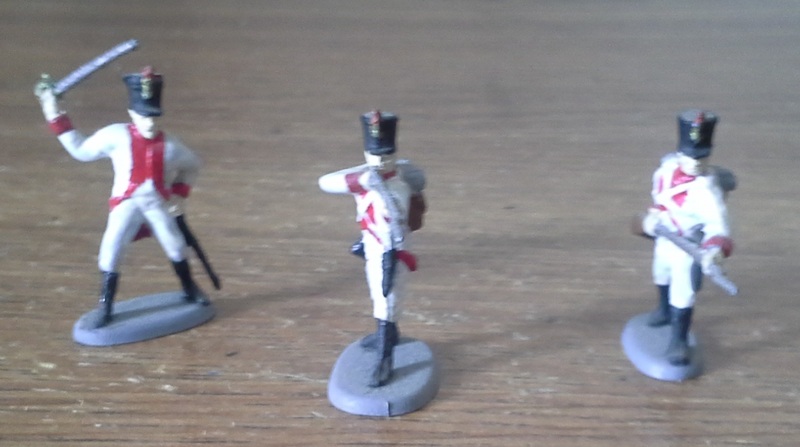 Nassau Grenadiers, converted from the Austrian Infantry from Esci 226 "Prussian and Austrian Infantry" with heads from Airfix 1743 "Waterloo British Cavalry (Hussars)". 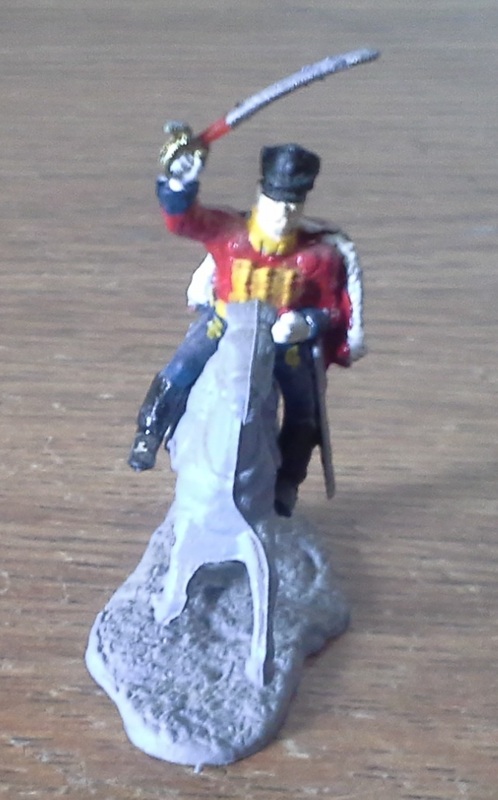 Nassau Reitende Jägers early, converted from HaT 8030 "Bavarian Cavalry". 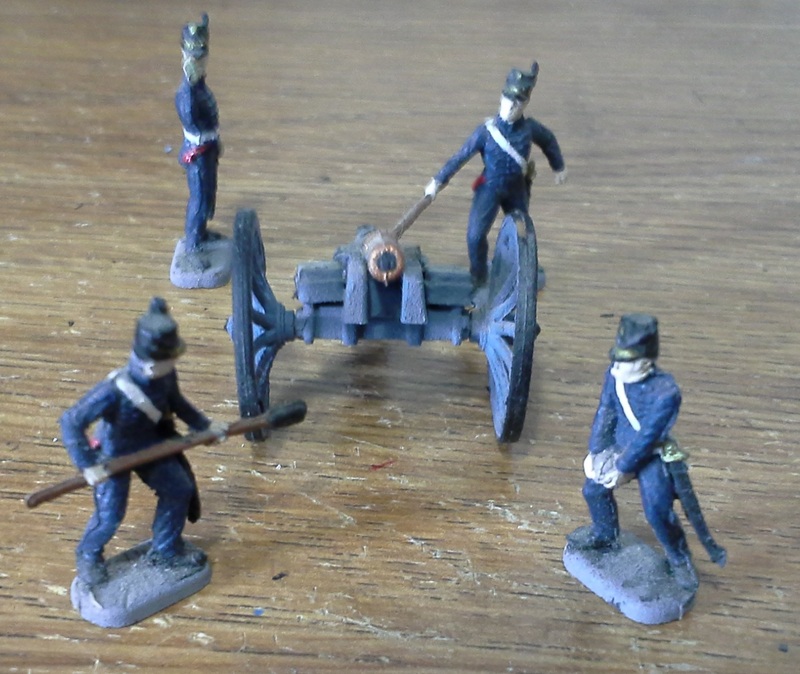 Nassau Reitende Jägers late, converted from Esci 230 "British Light Dragoons". 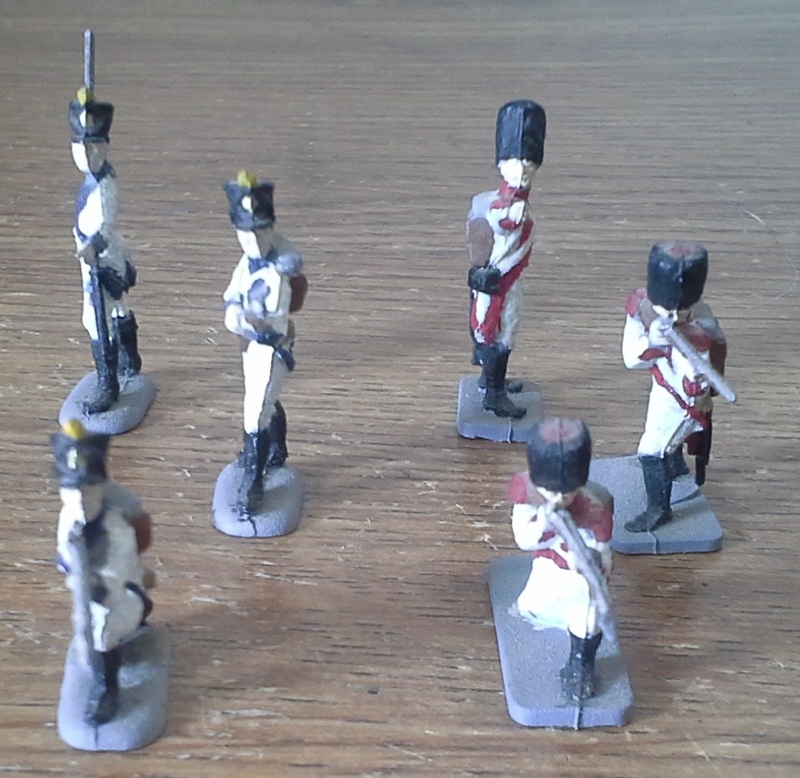 Neuchâtel line and grenadiers, converted from Esci sets 227 "French Line Infantry" and 214 "French Imperial Guard". 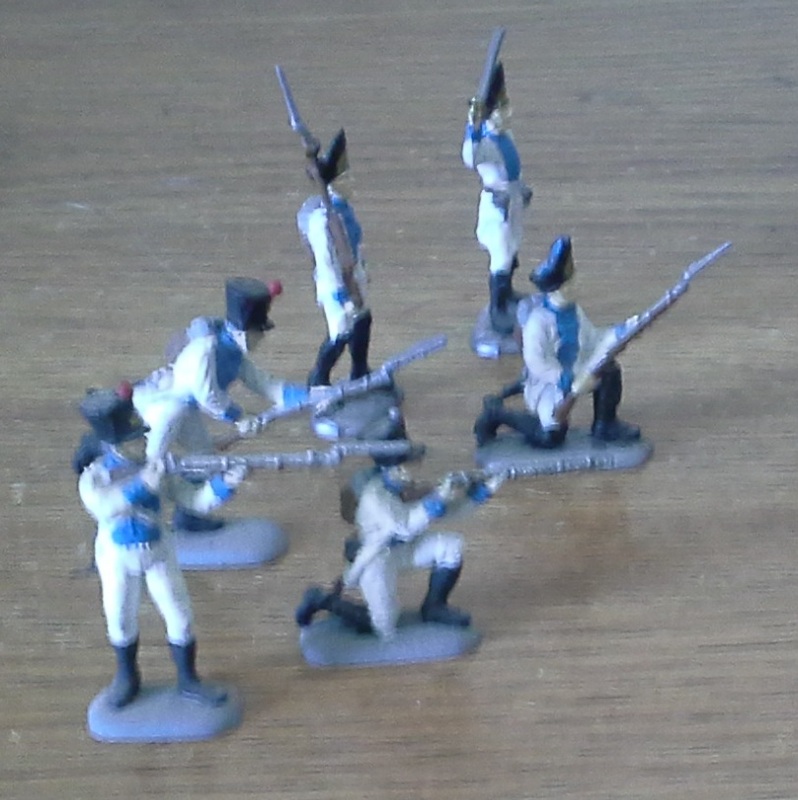 Valais infantry would be a simple paint job using any French line infantry. 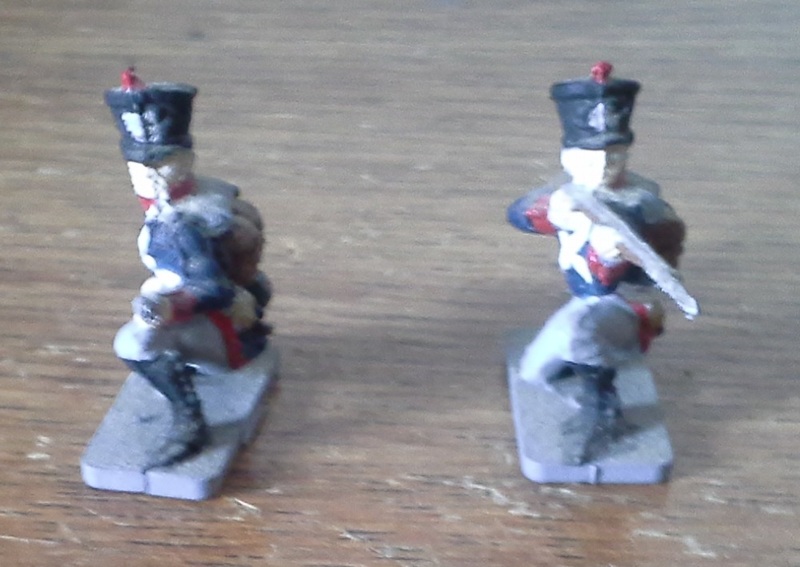 Swiss line and grenadiers, converted from Esci sets 227 "French Line Infantry" and 214 "French Imperial Guard". 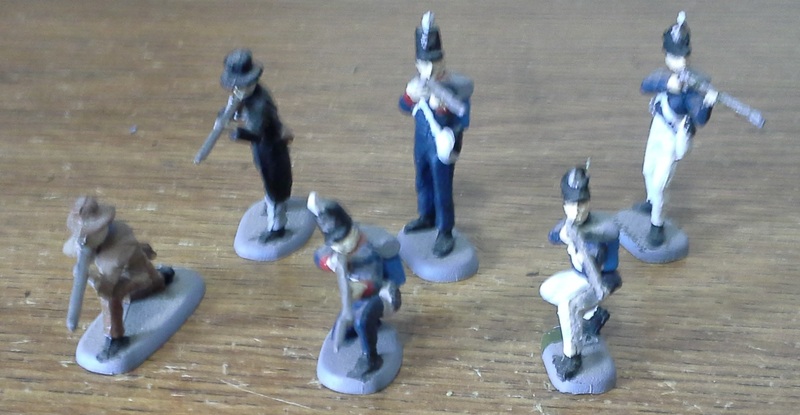 Oldenburg line and grenadiers, converted from HaT 8008 "Brunswick Avantgarde" for line and Esci 214 "French Imperial Guard" for the grenadiers. 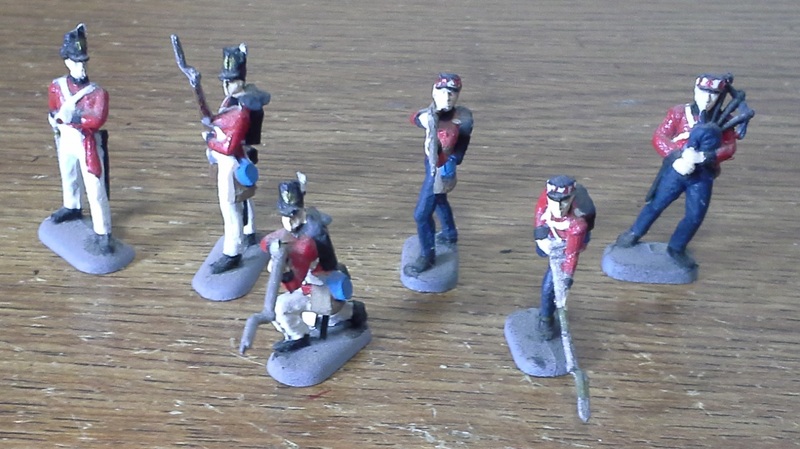 Saxon early line and grenadiers, converted from the Prussian infantry from Esci 226 "Prussian and Austrian Infantry" and the grenadiers from Italeri 6005 "Austrian Grenadiers and Infantry". 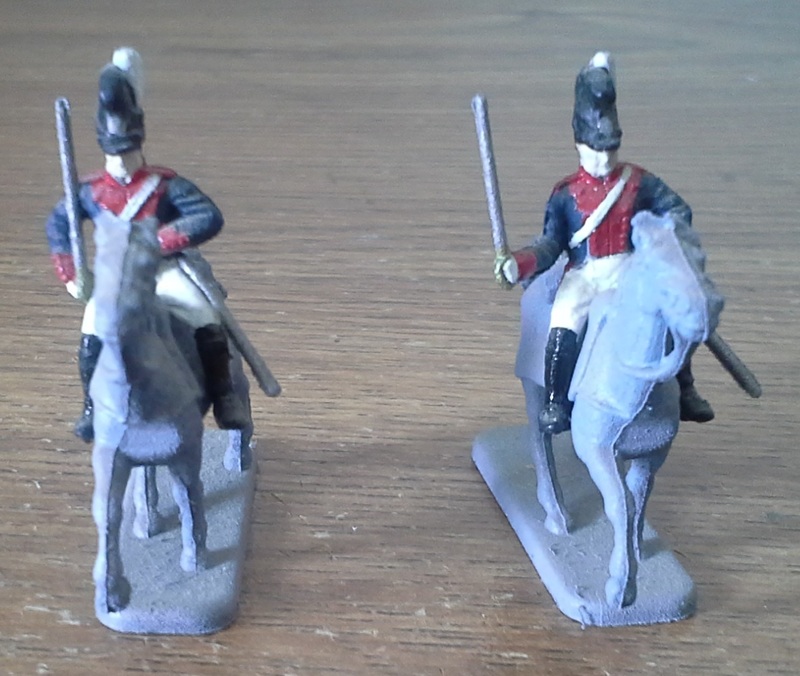 Saxon early Hussars, converted from Revell 2575 "Seven Years War Prussian Hussars". 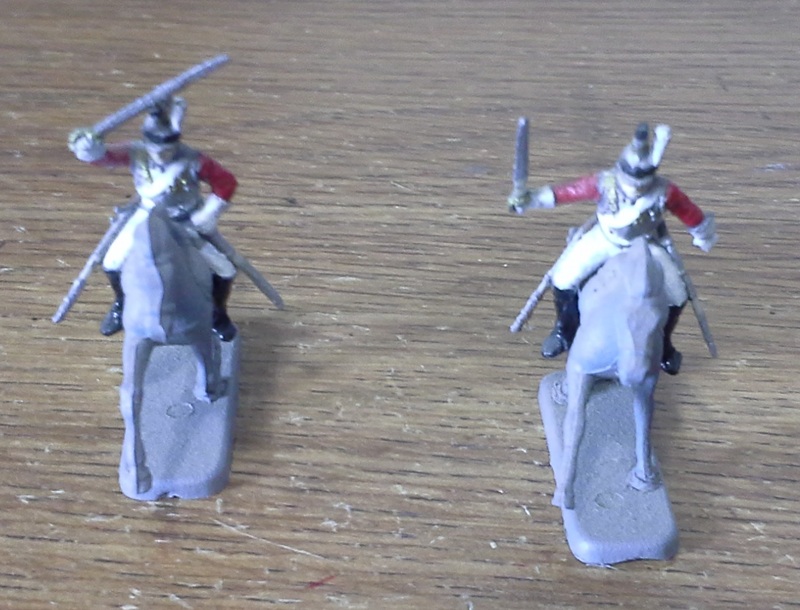 Saxon early Chevauxlegers, converted from Italeri 6007 "Prussian Cuirassiers". 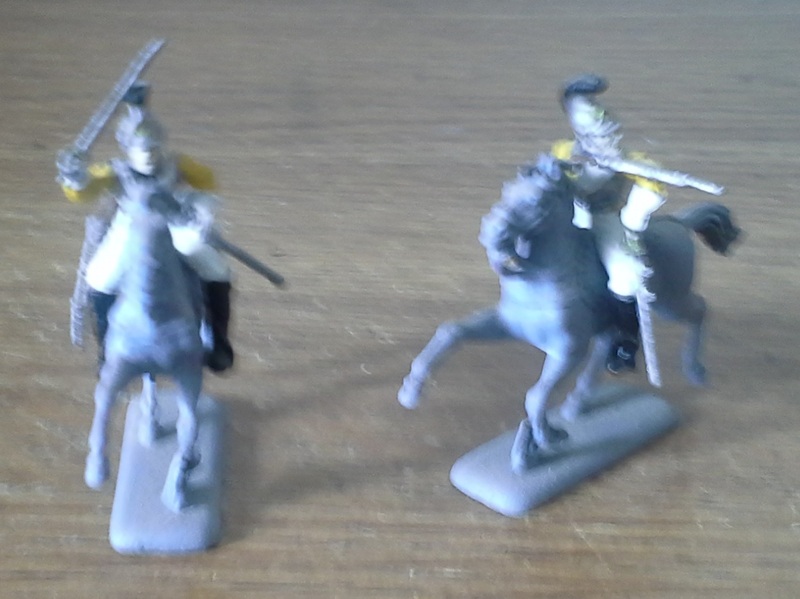 Saxon early Garde du Corps, converted from Italeri 6007 "Prussian Cuirassiers". 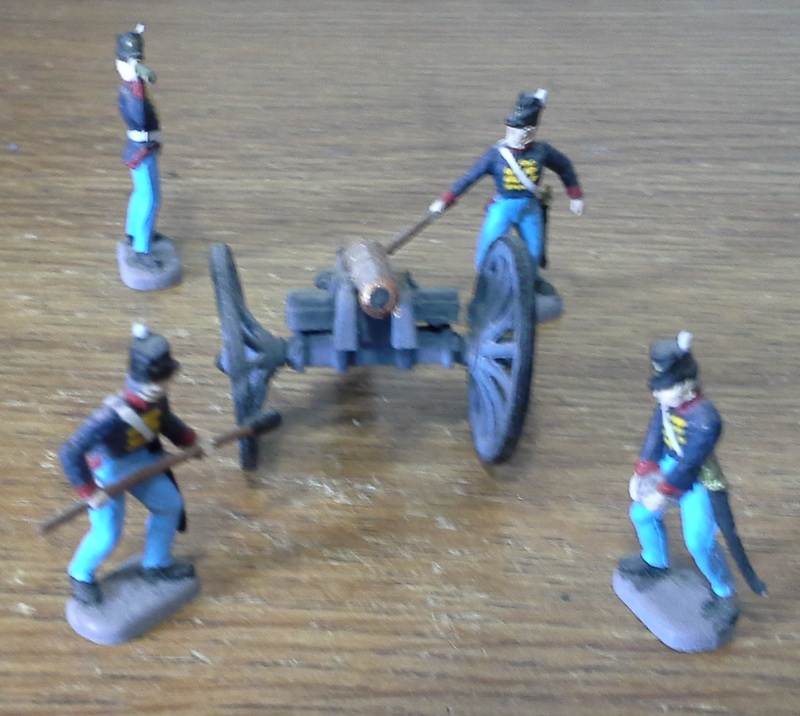 Saxon artillery could also be made, using Revell 2572 "Seven Years War Prussian Infantry" for the conversion. 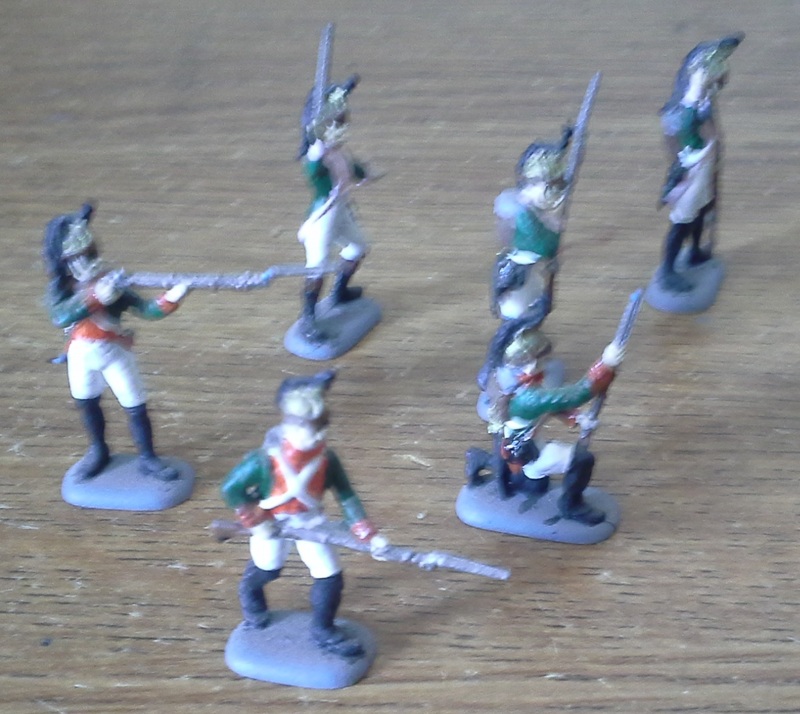 Saxon late line and grenadiers, converted from Italeri 6002 "French Infantry" and the grenadiers from Italeri 6005 "Austrian Grenadiers and Infantry". 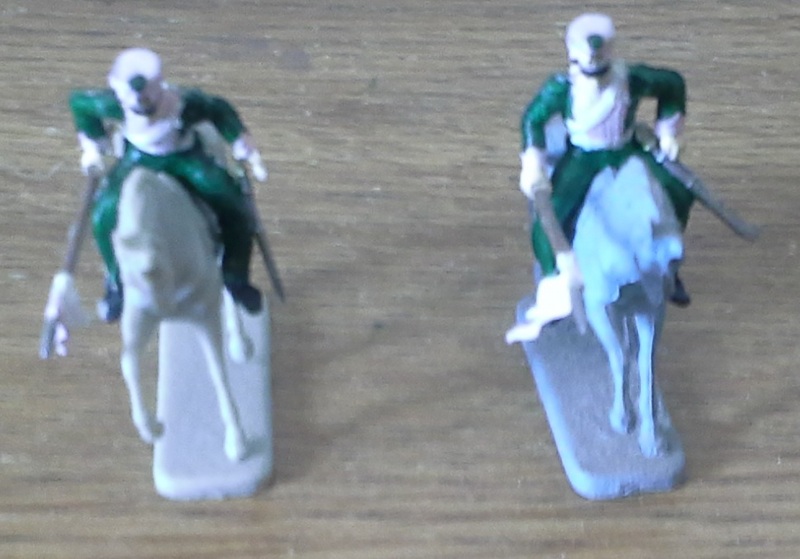 Saxon late Uhlans, converted from Esci 218 "Polish Lancers French Cavalry". 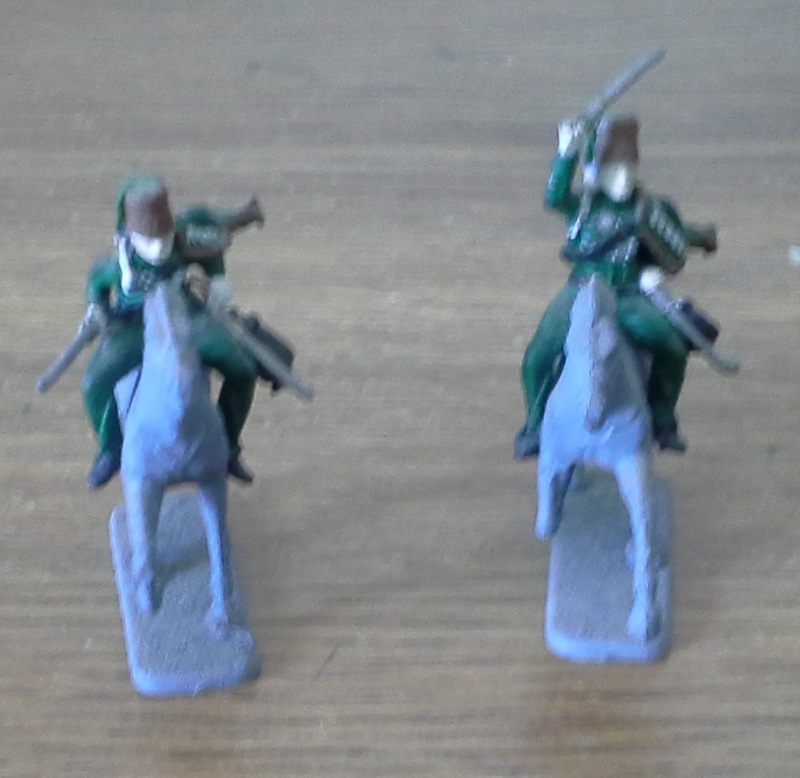 Saxon late Chevauxlegers, converted from HaT 8029 "French Line Chasseurs". 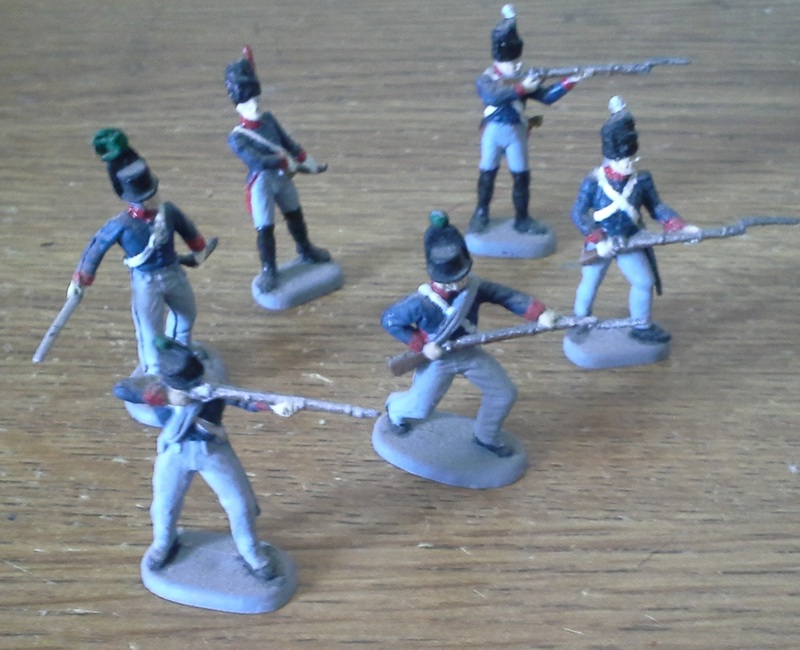 Saxon late Kurassiers, converted from Italeri 6003 "Carabiniers". 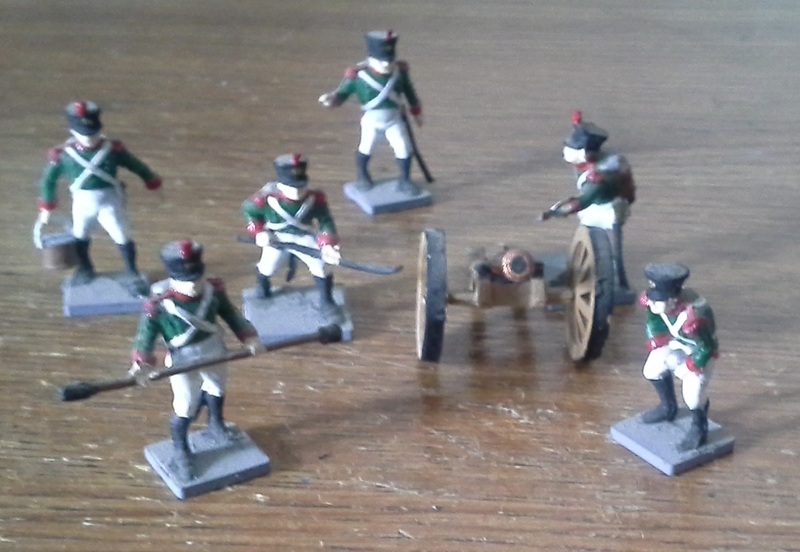 Saxon late Artillery, converted from Airfix 1737 "Waterloo French Artillery". 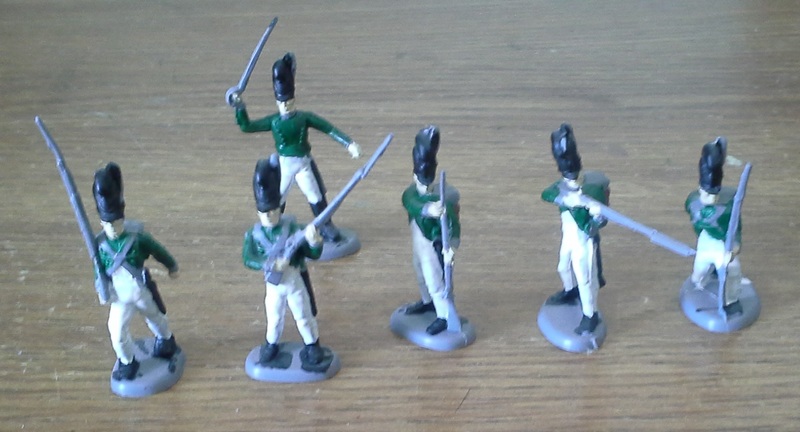 Baden line and Grenadiers. 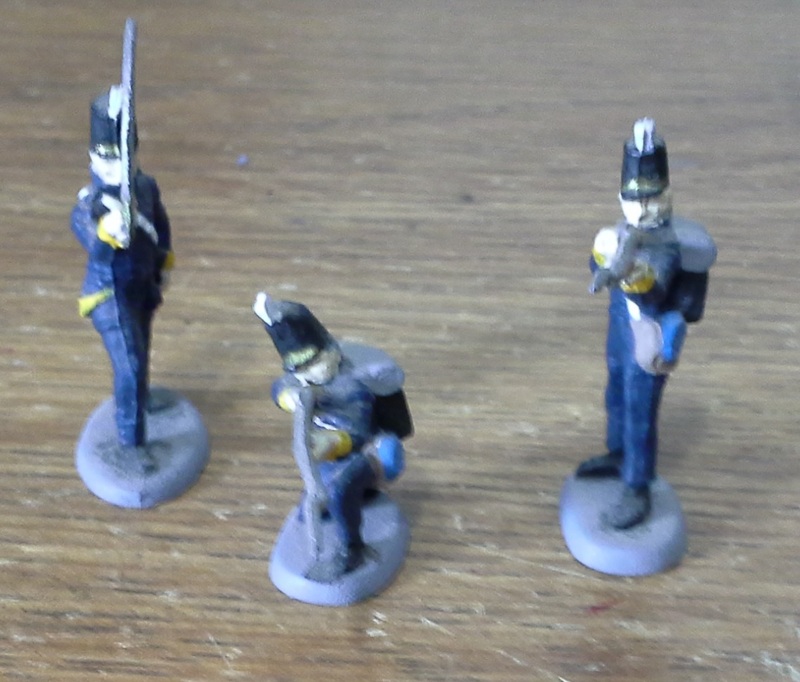 Line is HaT 8028 "Bavarian Infantry" and grenadiers are Esci 214 "French Imperial Guard". 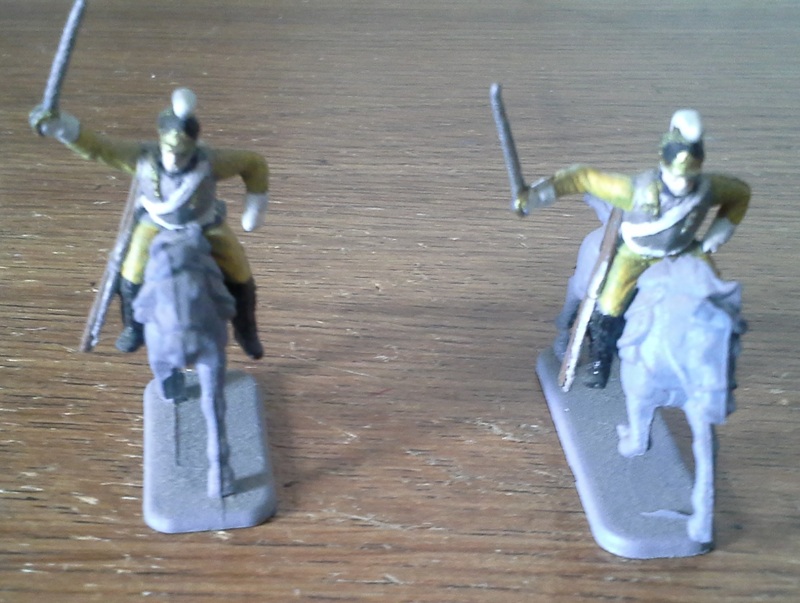 Baden Dragoons, converted from HaT 8030 "Bavarian Cavalry". 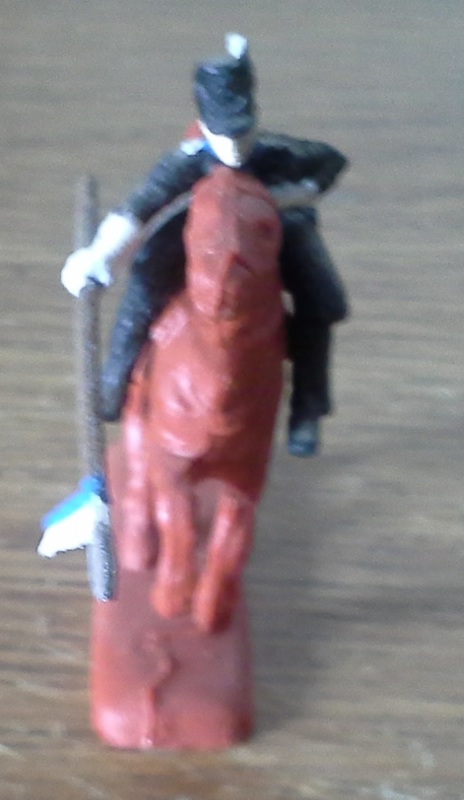 Baden Chevaulegers, converted from HaT 8030 "Bavarian Cavalry". 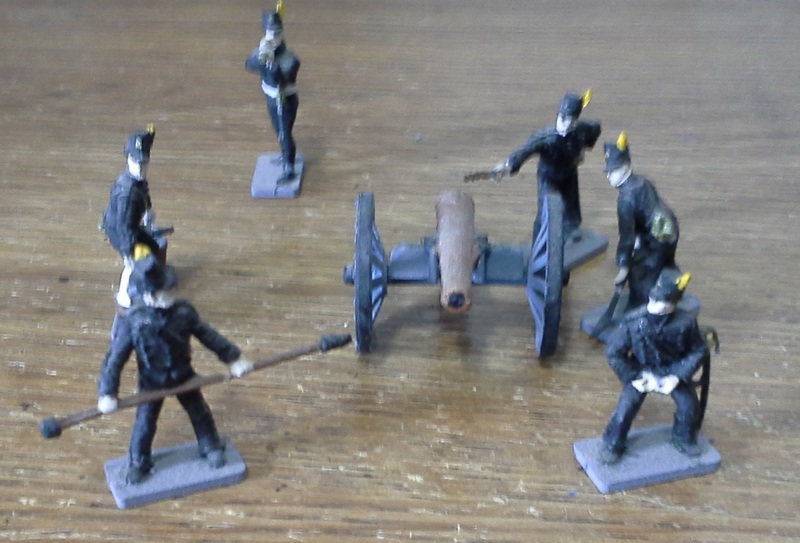 Baden Artillery, converted from HaT 8038 "Bavarian Artillery". 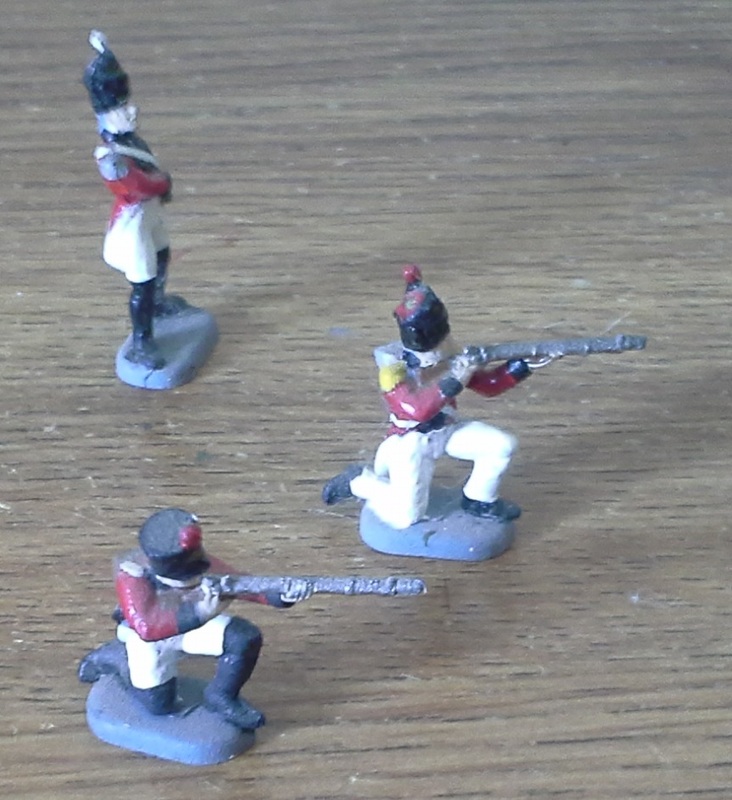 Dutch 3rd Grenadiers, converted from Esci 214 "French Imperial Guard". 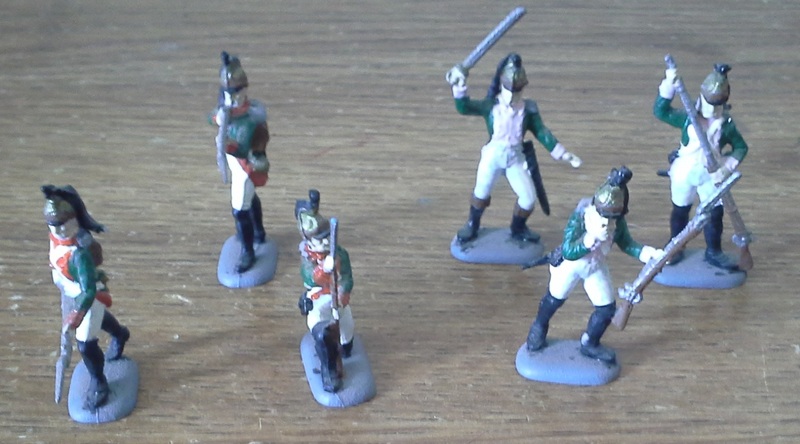 Dutch Dragoons, converted from Italeri 6015 "French Dragoons". 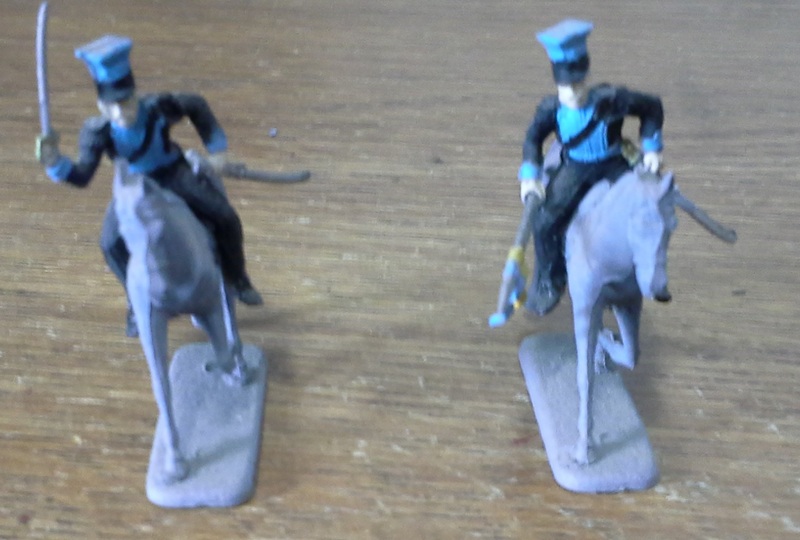 Dutch 3rd Lancers, converted from Esci 218 "Polish Lancers French Cavalry". 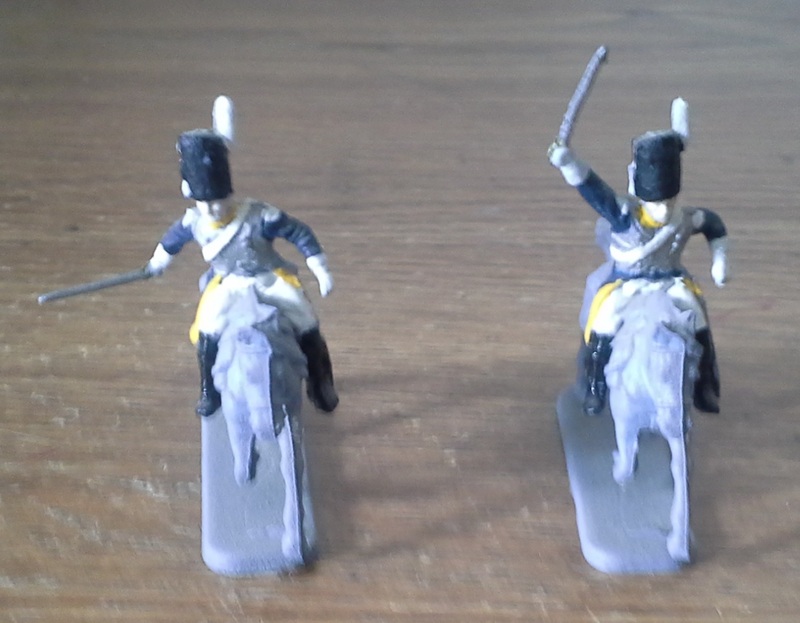 Dutch Horse Grenadiers, converted from HaT 8013 "French Horse Grenadiers". 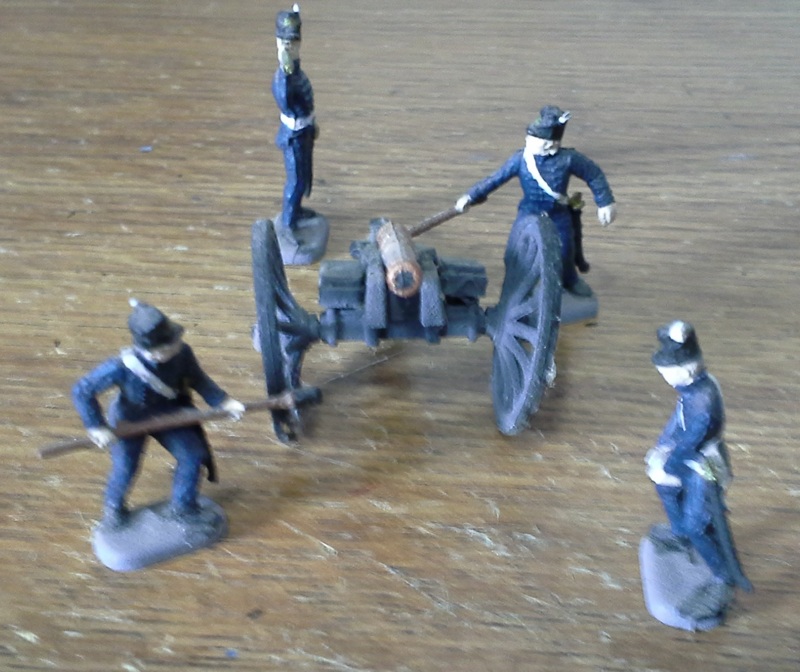 Dutch Artillery, converted from HaT 8039 "French Line Horse Artillery". 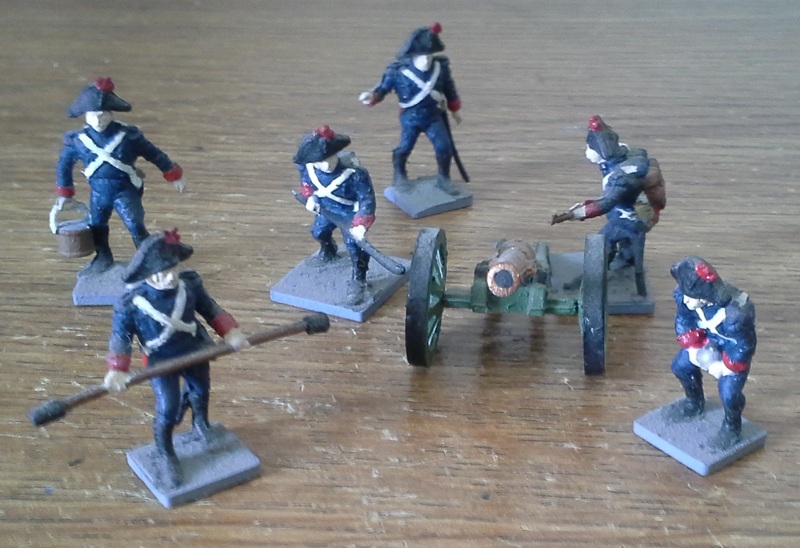 French early artillery, converted from Airfix 1737 "Waterloo French Artillery" with heads from Hat 8037 "Austrian Artillery". 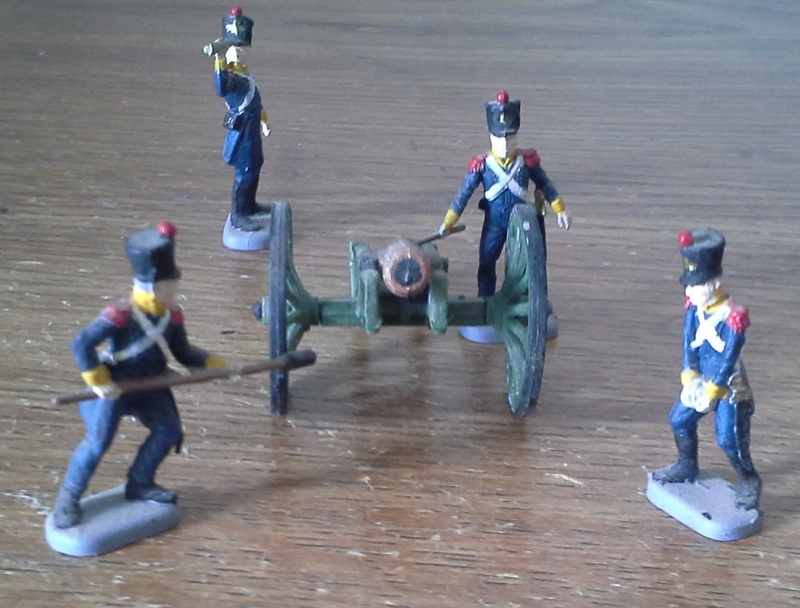 French line artillery, converted from Esci 234 "French Artillery" with heads from Esci 227 "French Line Infantry". 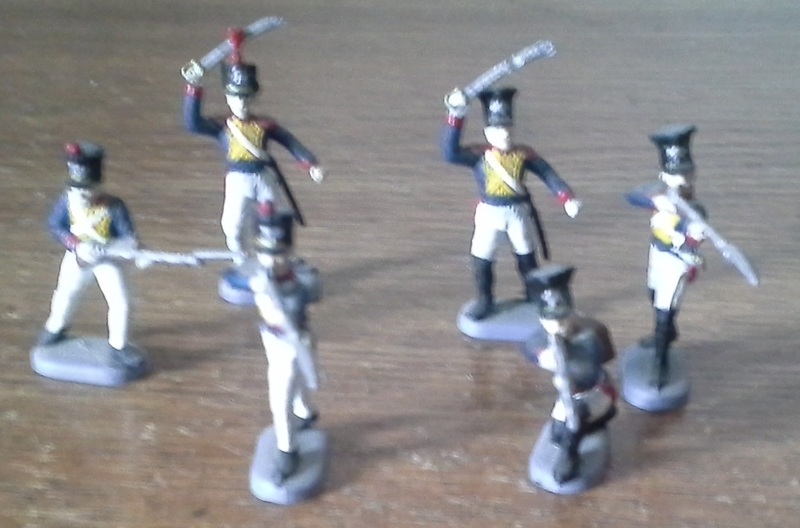 French Line and Elite Hussars. 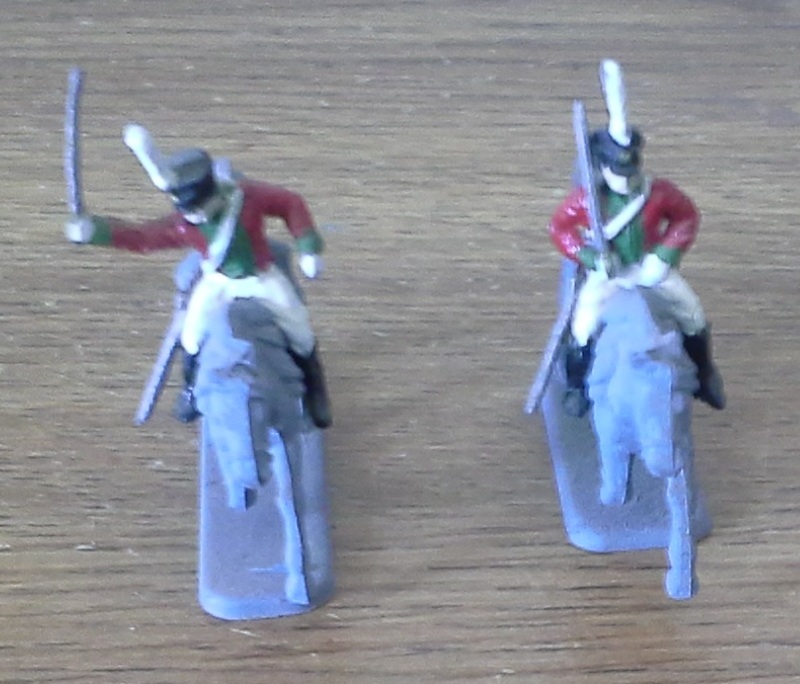 Line is Italeri 6008 "French Hussars" and elite is Esci 230 "British Light Dragoons". 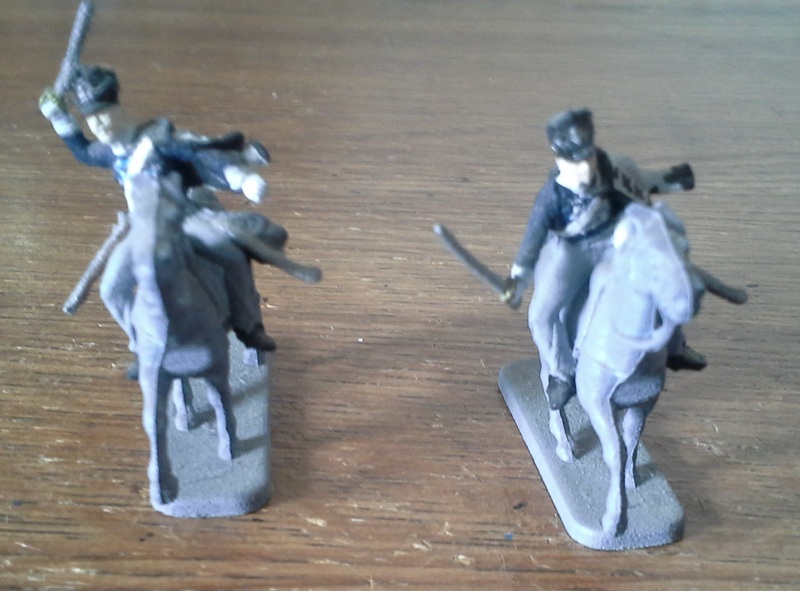 French Lancers, converted from Esci 218 "Polish Lancers French Cavalry". 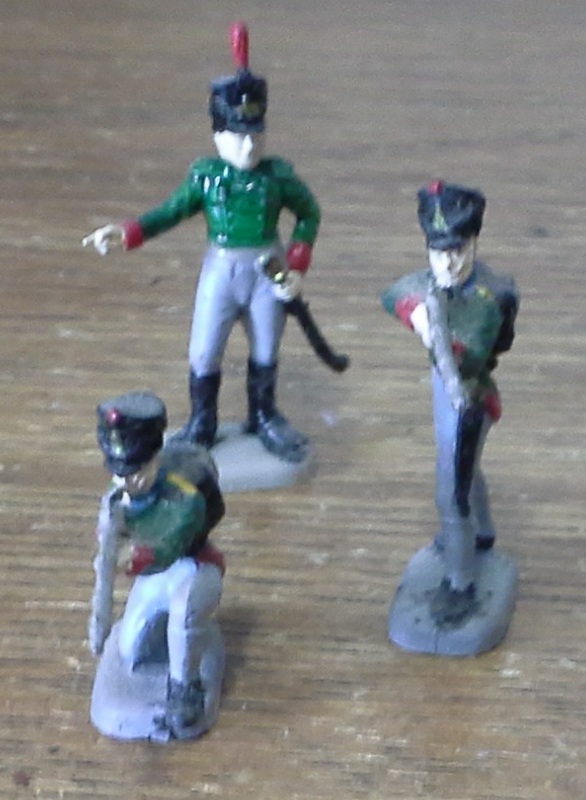 French Carabiniers, converted from HaT 8013 "French Horse Grenadiers". 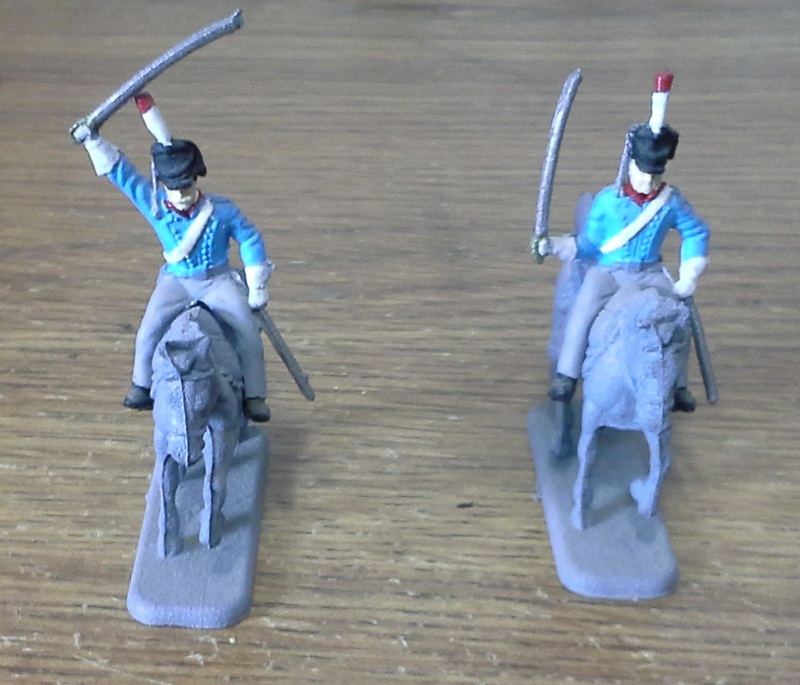 Lithuanian Tartars, converted from HaT 8001 "1805 French Mamelukes" with heads from Esci 230 "British Light Dragoons". 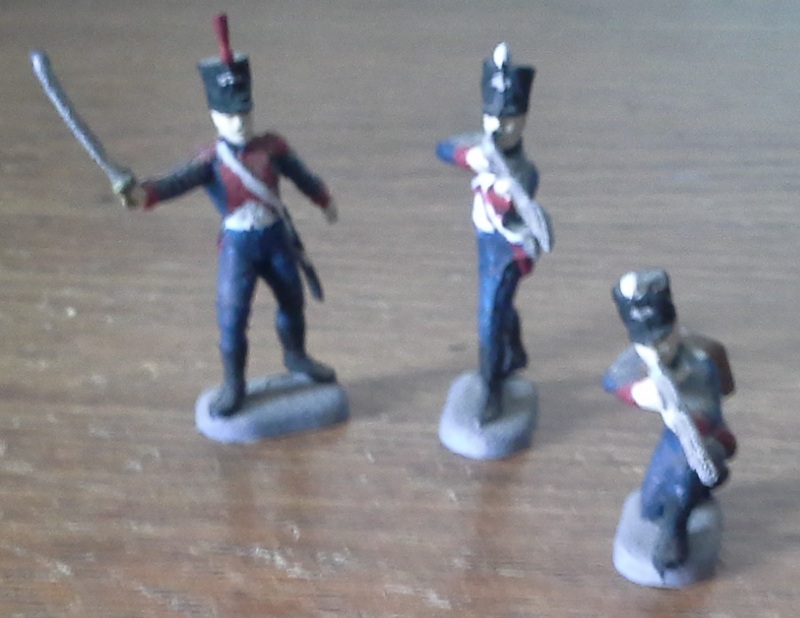 Westphalian line and grenadiers, converted from Italeri 6002 "French Infantry" and Airfix 1749 "Waterloo French Imperial Guard" as the grenadiers. 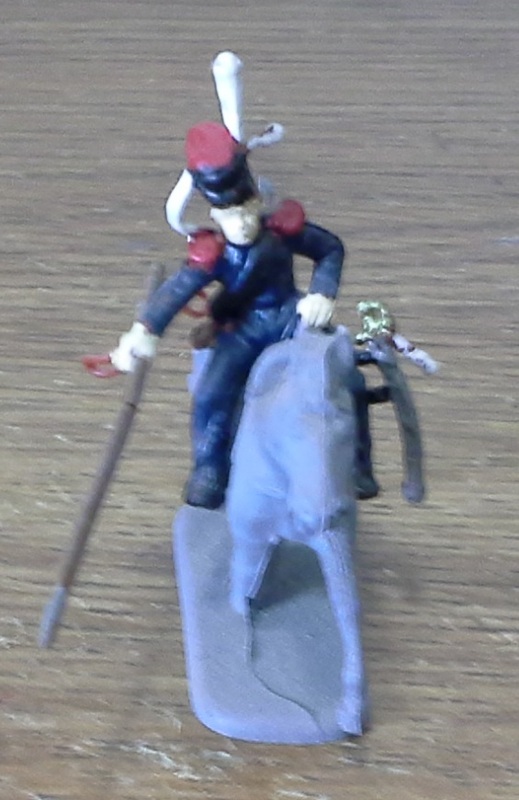 Westphalian Chevauleger Guard, converted from Hat 8011 "French Lancers". 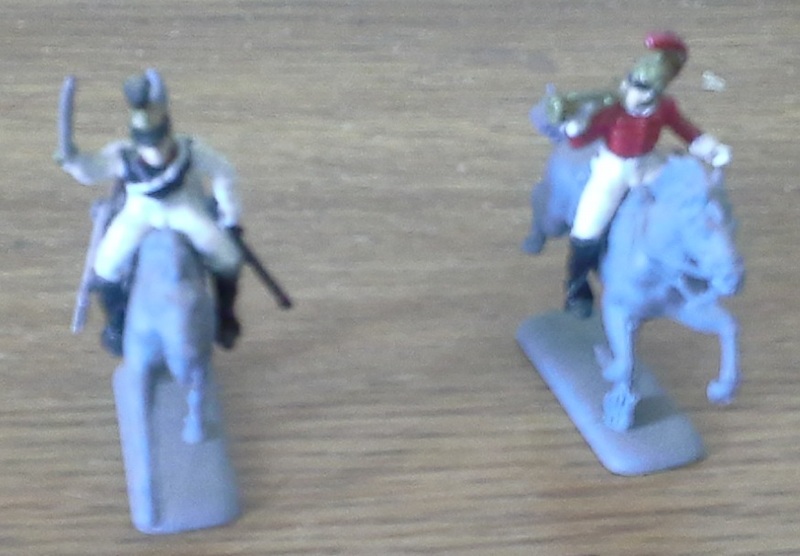 Westphalian Cuirassiers, converted from Italeri 6003 "Carabiniers". 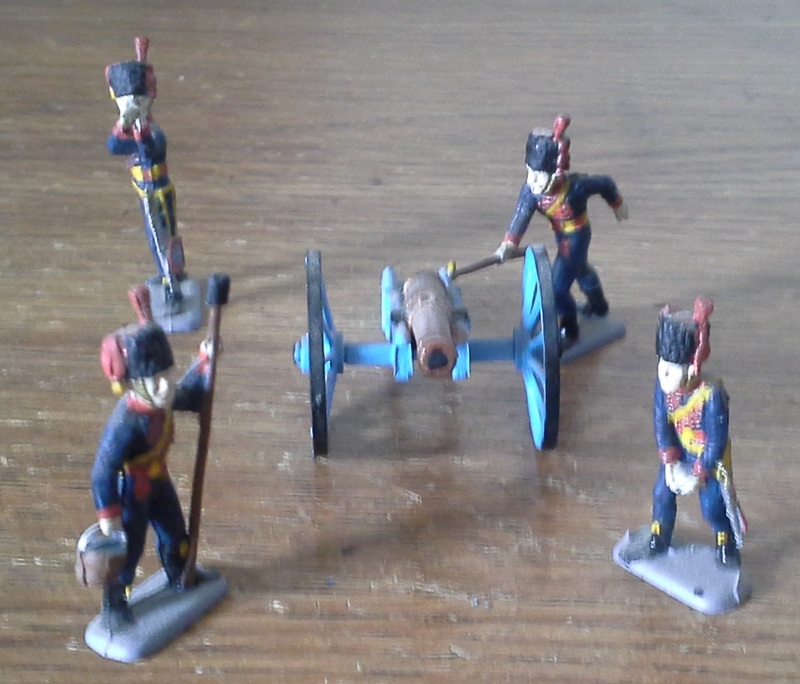 Westphalian Artillery, converted from Airfix 1737 "Waterloo French Artillery". 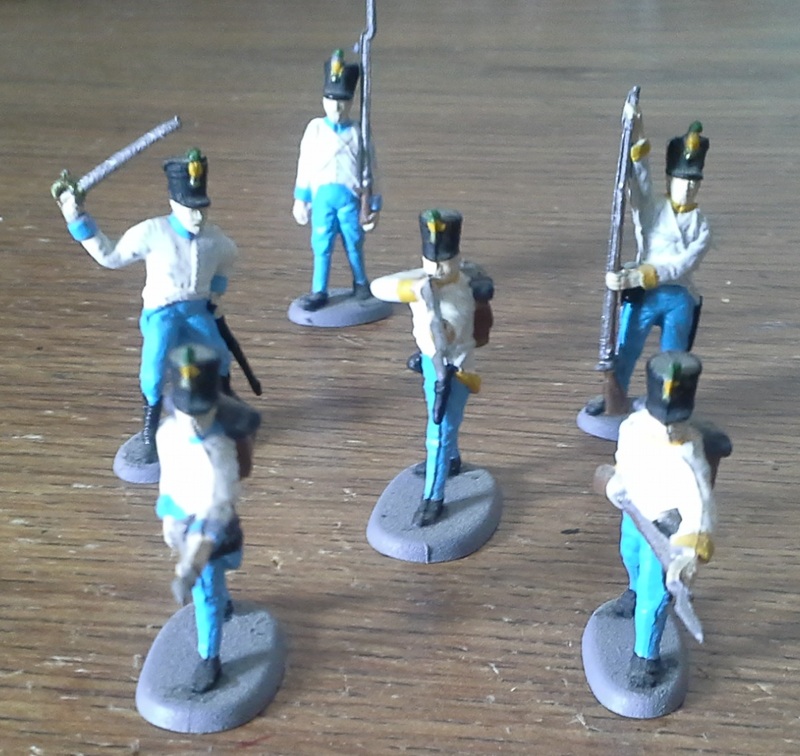 Hesse-Darmstadt early infantry, converted from the Prussian figures from Esci 226 "Prussian and Austrian Infantry". 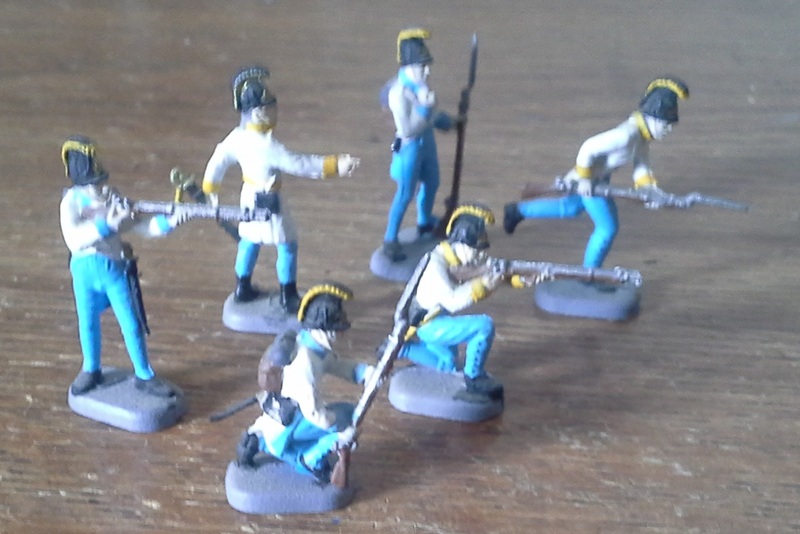 Hesse-Darmstadt late infantry, converted from Esci 227 "French Line Infantry". 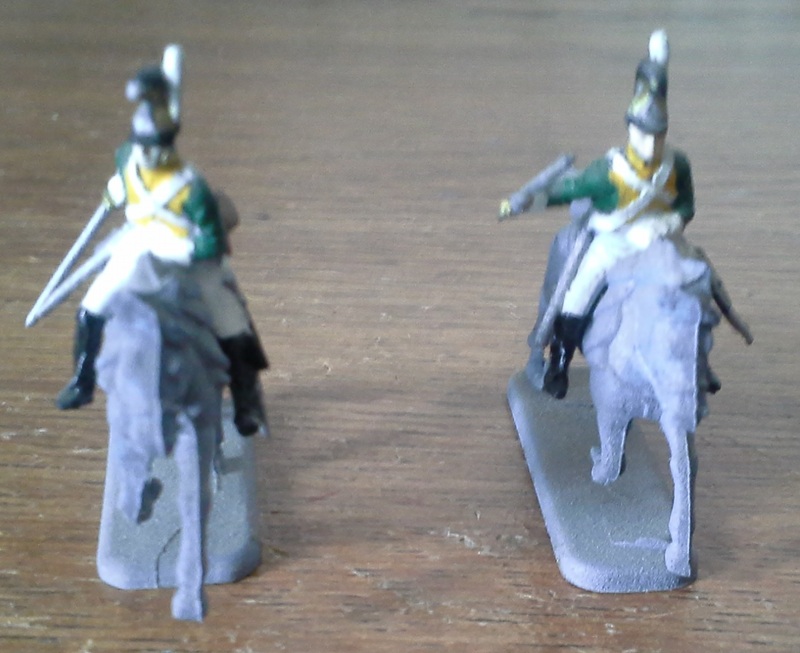 Hesse-Darmstadt Garde du Corps, converted from Italeri 6007 "Prussian Cuirassiers". 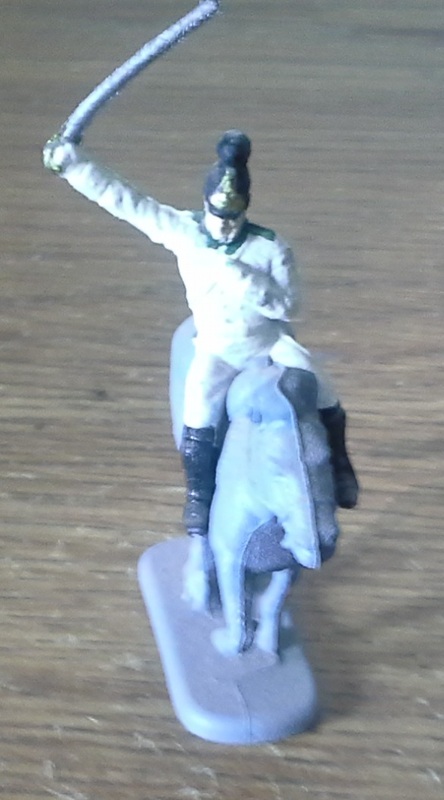 Hesse-Darmstadt Garde Chevaulegers, converted from HaT 8030 "Bavarian Cavalry" with a small piece of plastic glued to the front for the plate on that helmet. 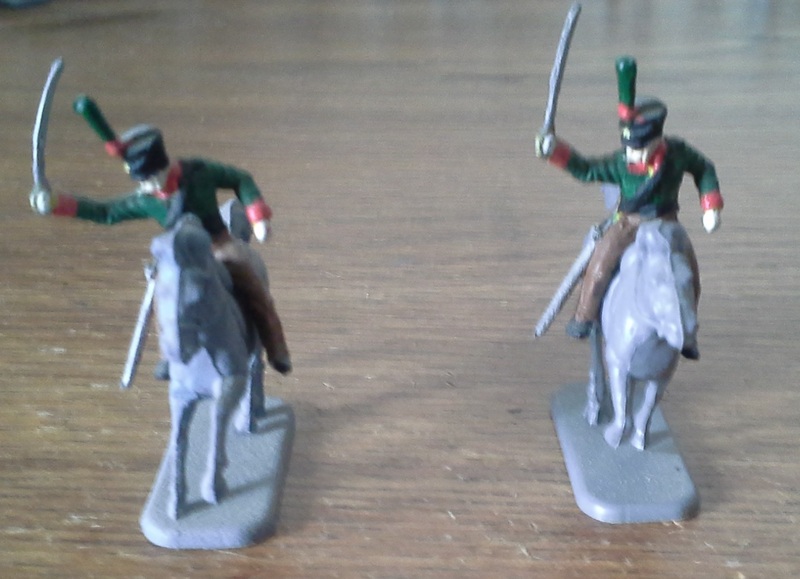 Hesse-Kassel Karabiniers, converted from Italeri 6007 "Prussian Cuirassiers" with the extra heads from HaT 8033 "British Heavy Dragoons". 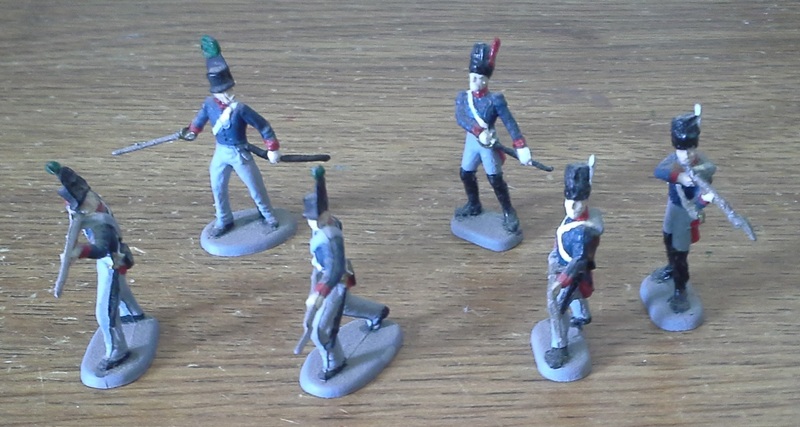 Württemberg line and grenadiers, converted from the fusilier figures from Esci 6005 "Austrian Grenadiers and Infantry" as line and Esci 214 "French Imperial Guard" for grenadiers. 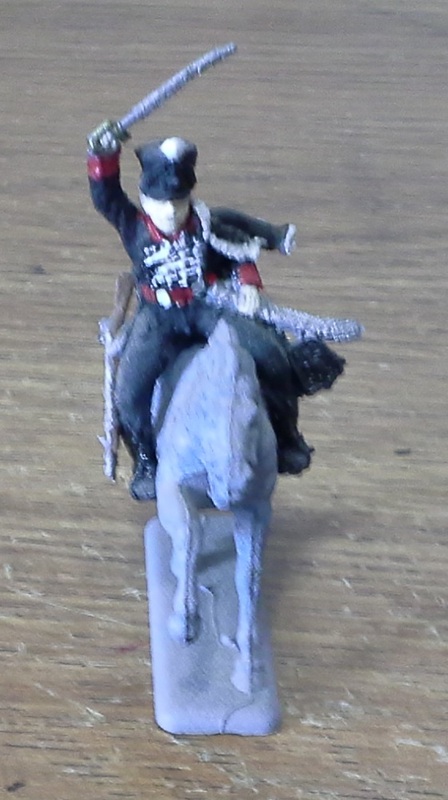 Württemberg Chasseurs early, converted from HaT 8031 "Austrian Chevauxleger". 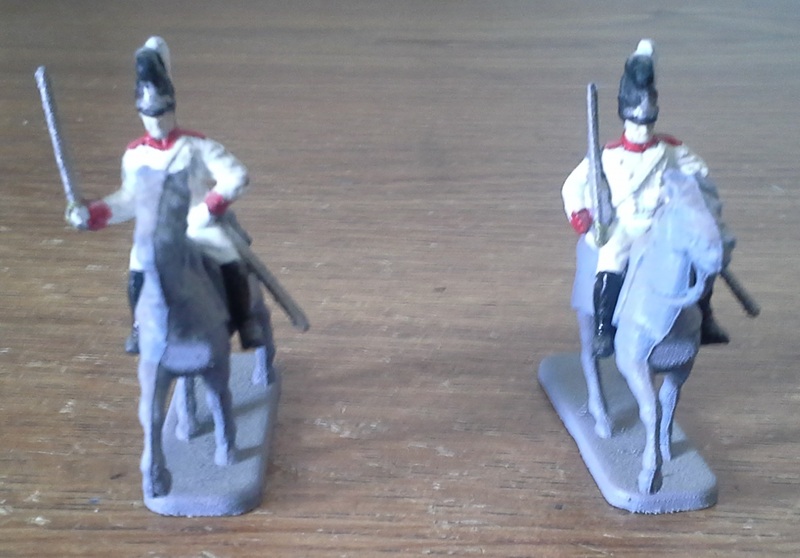 Württemberg Chevau-legers, converted from HaT 8033 "British Heavy Dragoons". 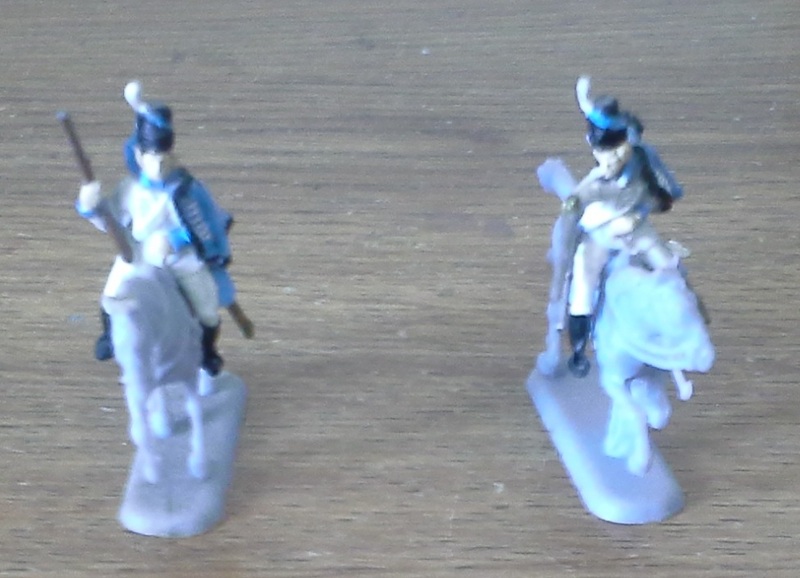 Württemberg Grenadiers à Cheval, converted from HaT 8013 "French Horse Grenadiers". Württemberg Garde du Corps, converted from Italeri 6003 "Carabiniers". 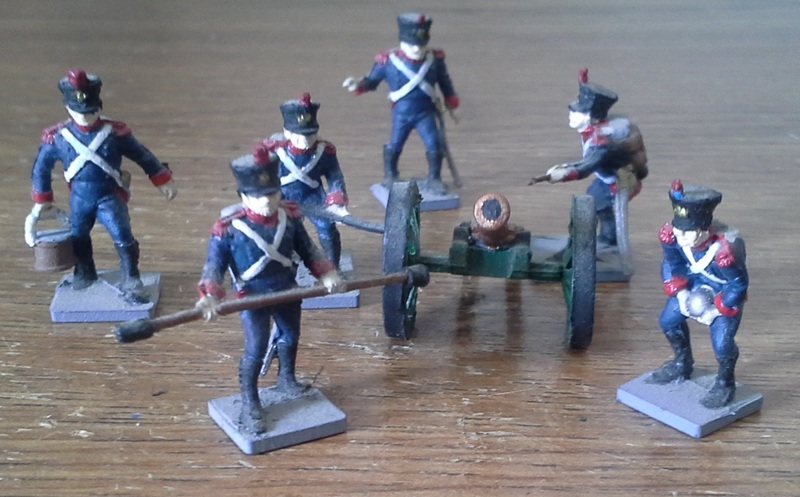 Württemberg Artillery, converted from Airfix 1737 "Waterloo French Artillery" with heads from HaT 8031 "Austrian Chevauxleger". 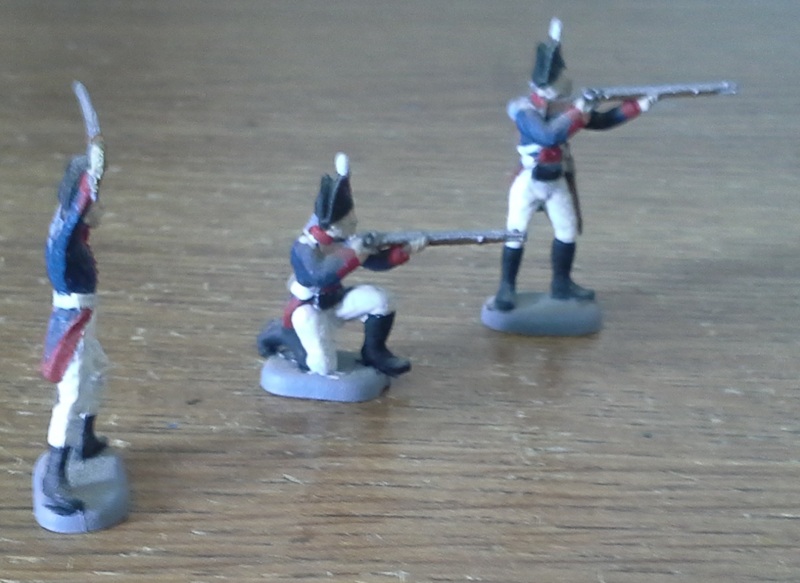 Würzburg early infantry, converted from the fusiler figures from Italeri 6005 "Austrian Grenadiers and Infantry". 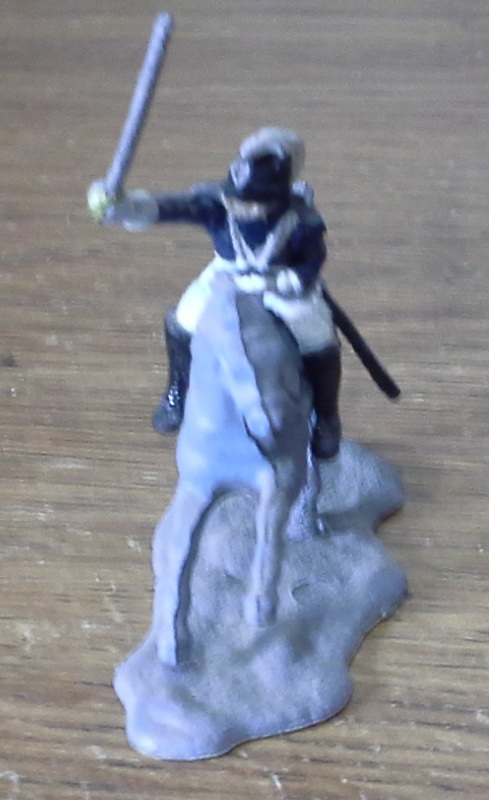 Würzburg late infantry, converted from HaT 8027 "Austrian Line Infantry"`.One other source shows the shako like the French one. 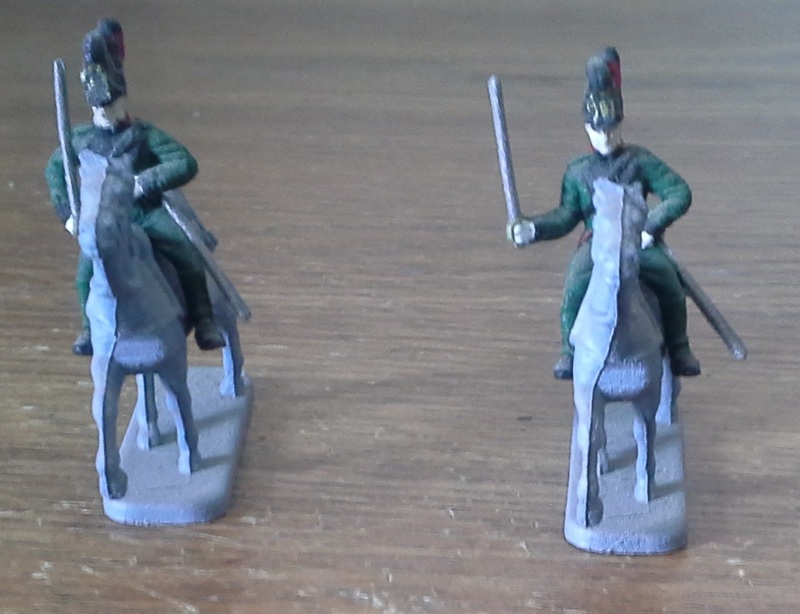 Würzburg early Chevaulegers, converted from HaT 8033 "British Heavy Dragoons" with heads from HaT 8015 "Austrian Cuirassiers". 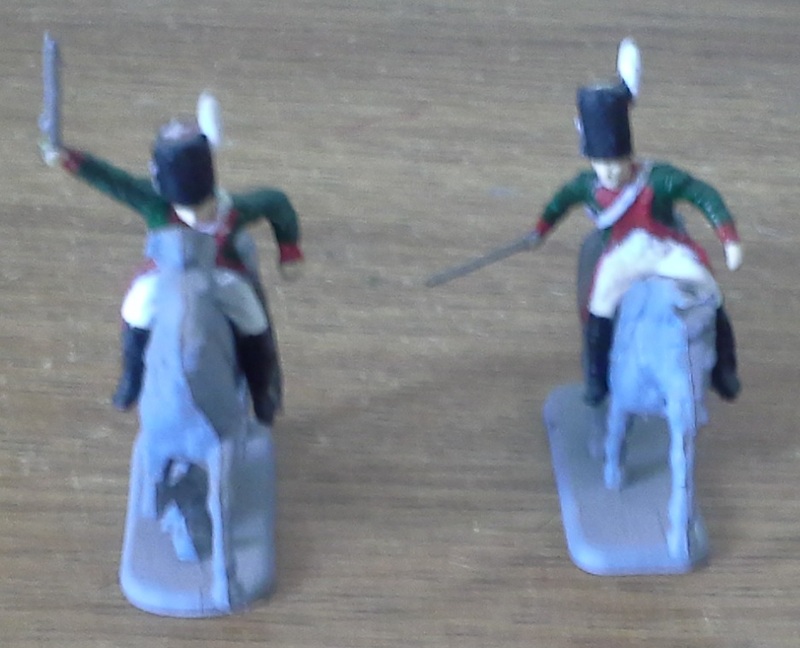 Würzburg late Chevaulegers, converted from HaT 8033 "British Heavy Dragoons" with heads from HaT 8029 "French Line Chasseurs". 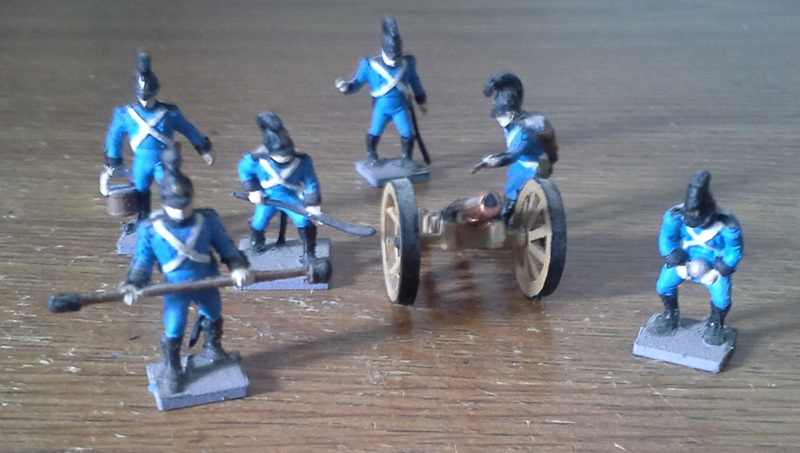 Würzburg early artillery, converted from Airfix 1737 "Waterloo French Artillery" with heads from HaT 8031 "Austrian Chevauxleger". 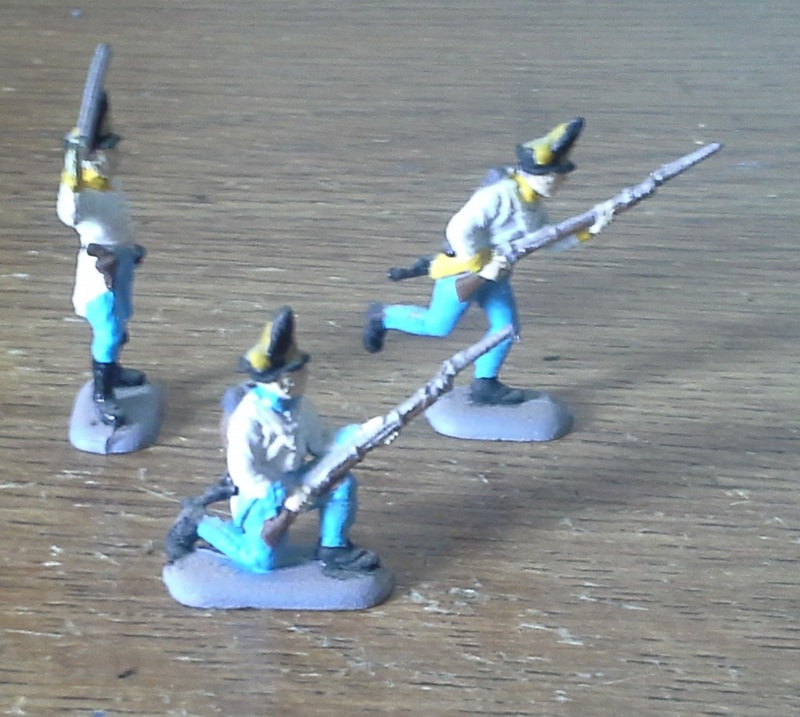 Anhalt Chasseurs, converted from HaT 8029 "French Line Chasseurs". 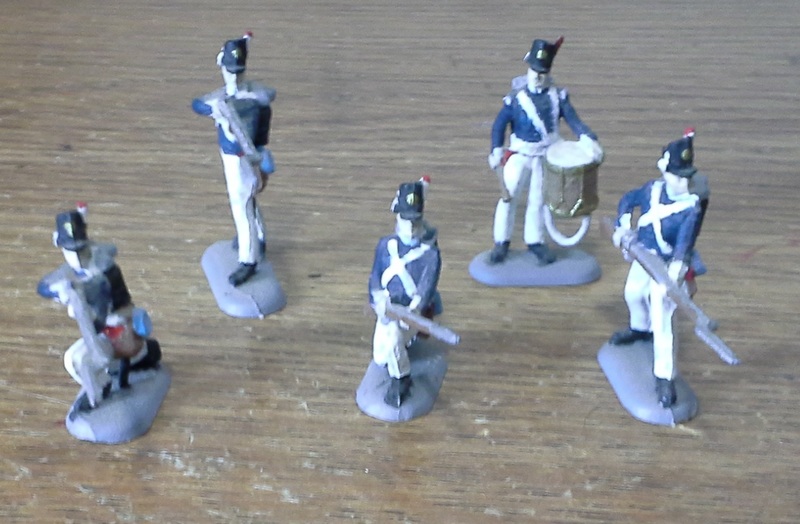 The infantry could also be converted from Esci 227 "French Line Infantry, as could Lippe infantry. 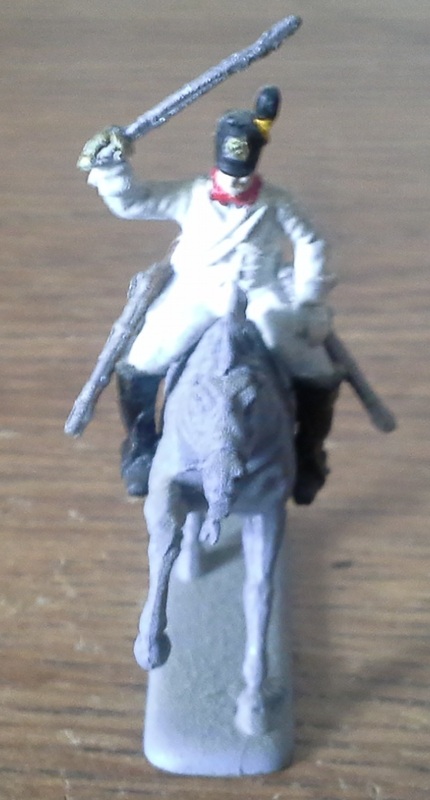 Austrian Chevauxleger, converted from HaT 8031 "Austrian Chevauxleger", though the box has them in white uniforms like the Dragoons would be. 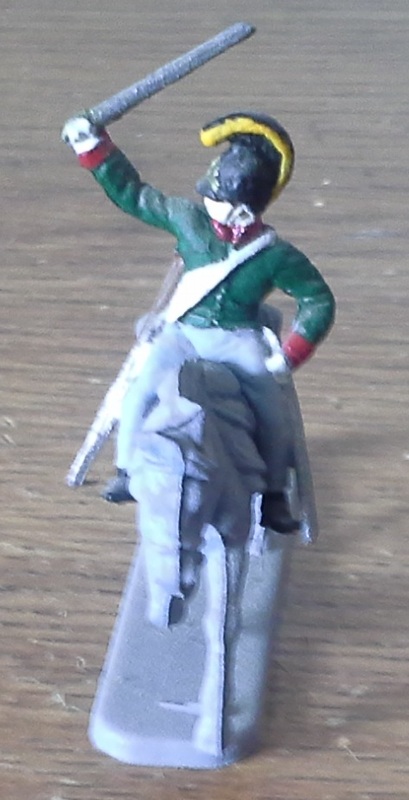 According to Osprey the Chevauxlegers wore a green coat. 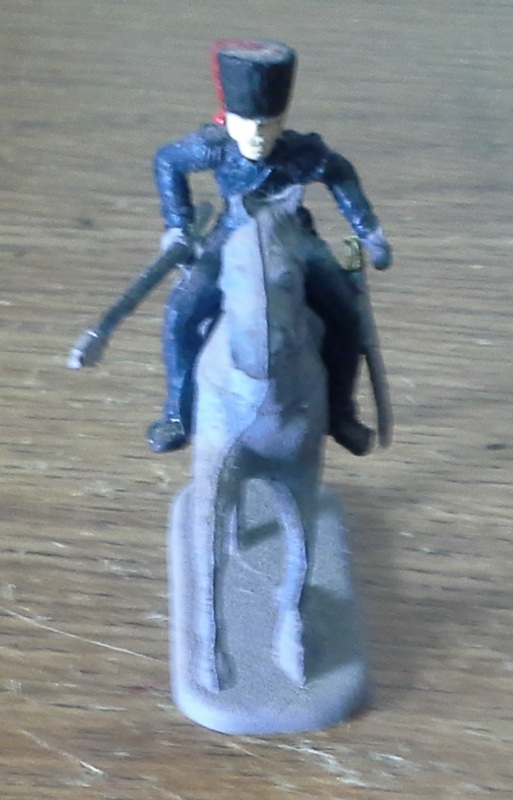 Could also be used for dragoon units. 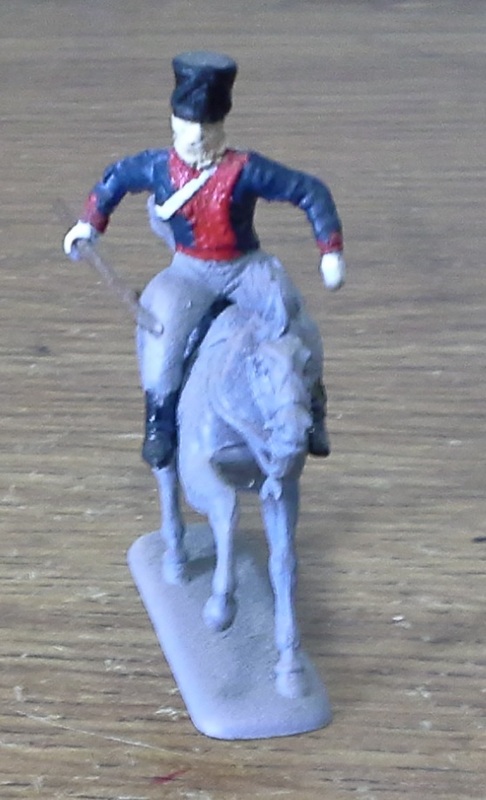 Austrian Cuirassier early, converted from Italeri 6007 "Prussian Cuirassiers" with extra head from HaT 8031 "Austrian Chevauxleger". 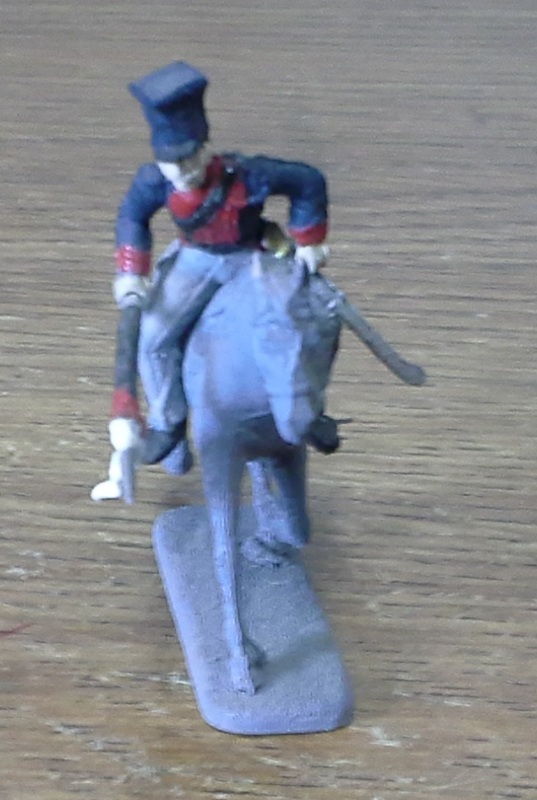 Austrian Dragoon early, converted from Italeri 6007 "Prussian Cuirassiers" with extra head from HaT 8031 "Austrian Chevauxleger". 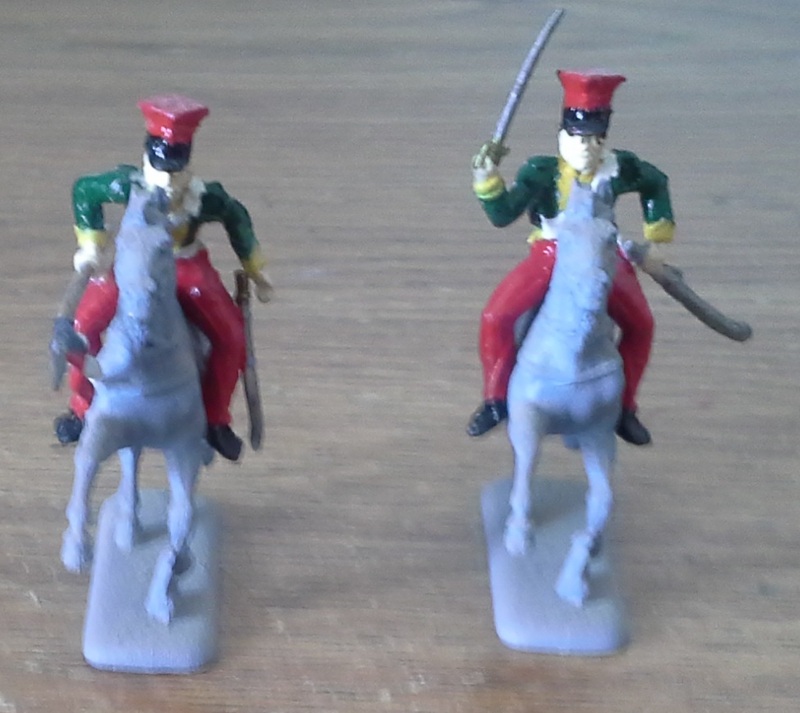 Austrian Hussars, converted from Italeri 6008 "French Hussars". 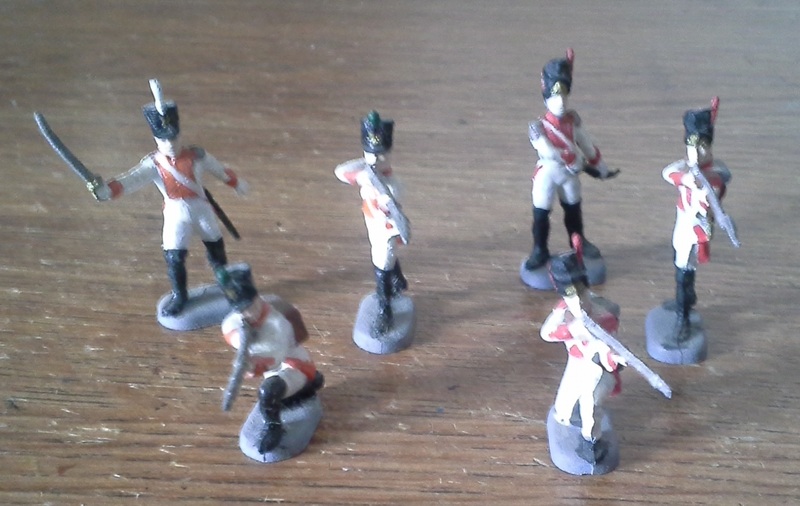 One on left is 1st Hussars 1813-14. 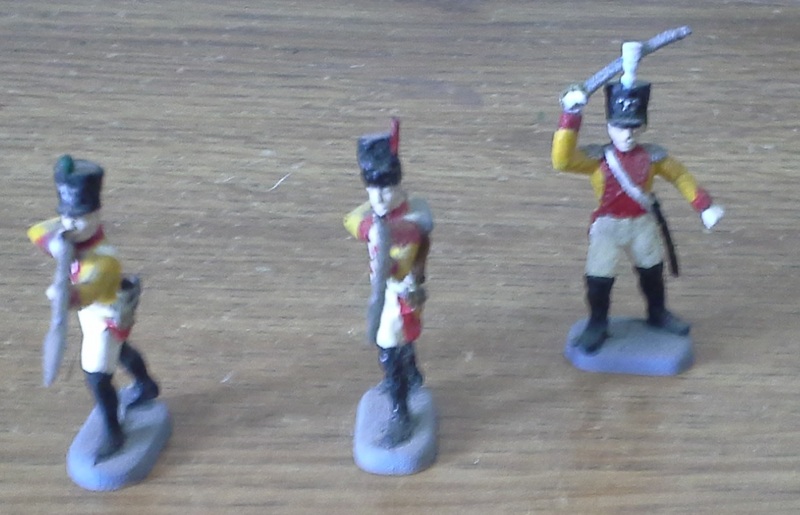 The center one is 4th Hussars 1805. 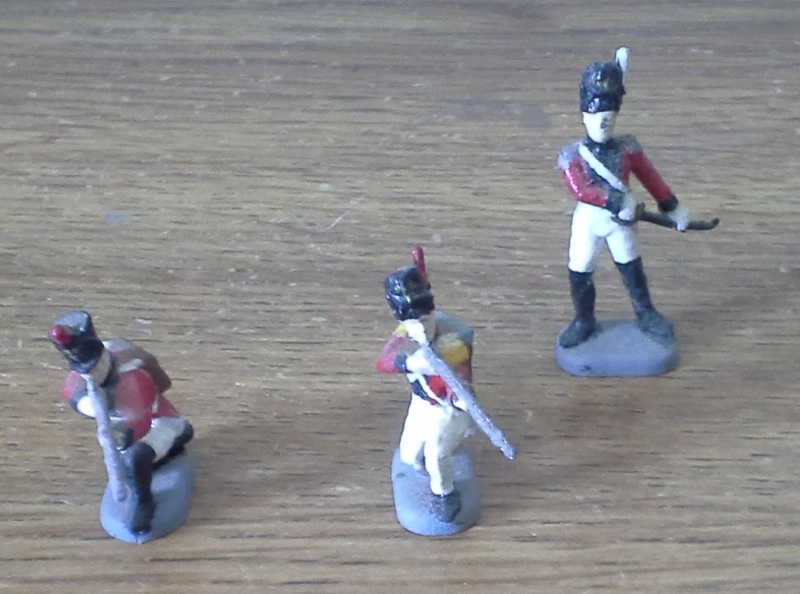 The one the right is 10th Hussars 1798. 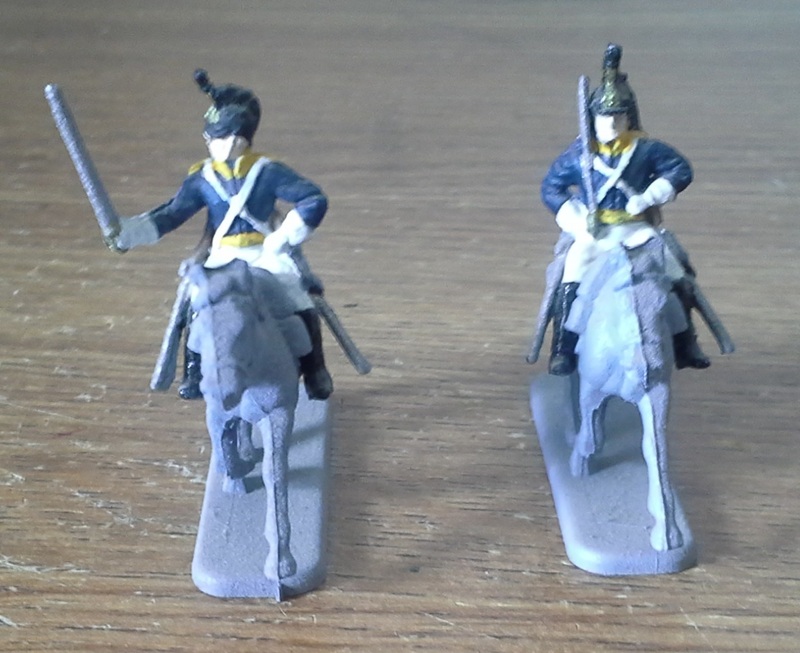 Austrian Uhlans, converted from Esci 218 "Polish Lancers French Cavalry" as the 1st, 2nd,3rd and 4th Uhlans. 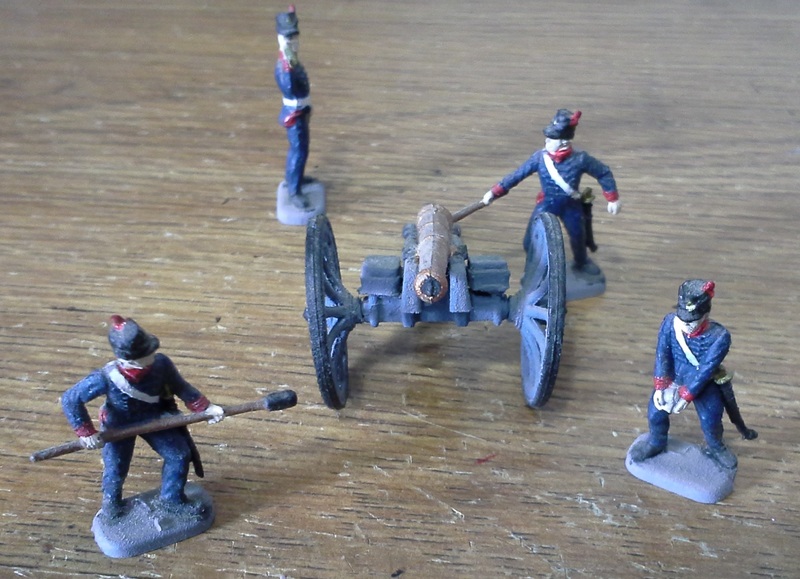 Austrian Artillery early, converted from HaT 8037 "Austrian Artillery" with Austrian infantry heads from Esci 226 "Prussian and Austrian Infantry". 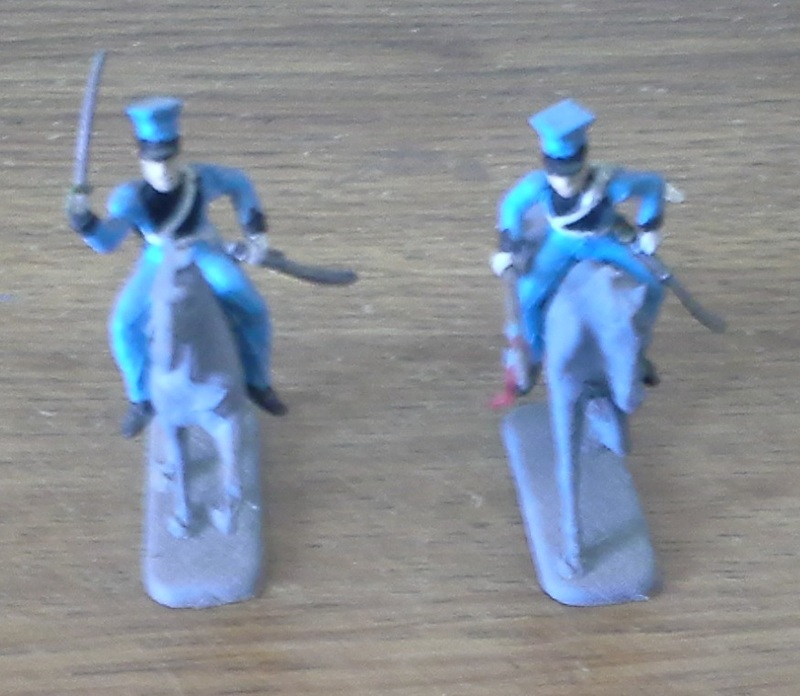 Hungarian Infantry early, converted from the Austrian Infantry figures from Esci 226 "Prussian and Austrian Infantry". 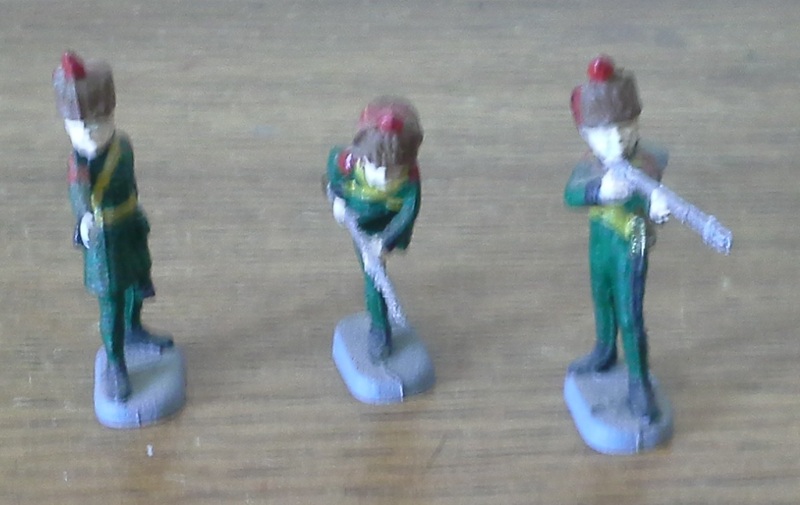 Hungarian Infantry late, converted from HaT 8027 "Austrian Line Infantry". 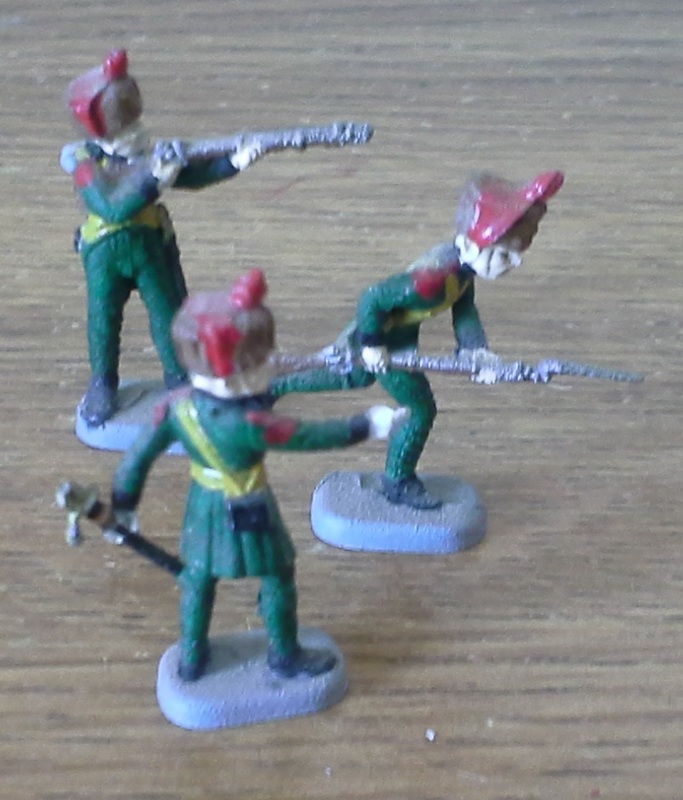 Hungarian Grenadiers, converted from the grenadier figures from Italeri 6005 "Austrian Grenadiers and Infantry". 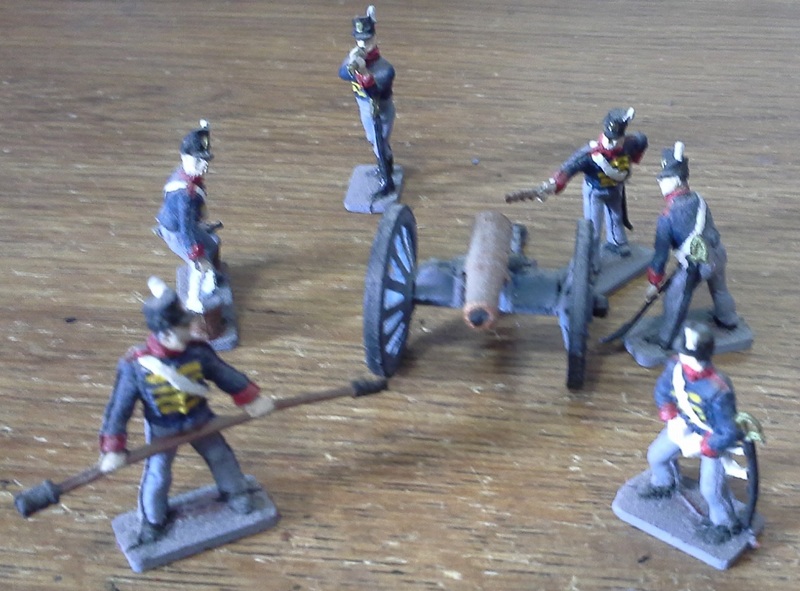 Hesse-Darmstadt Artillery, converted from Airfix 1737 Waterloo French Artillery. 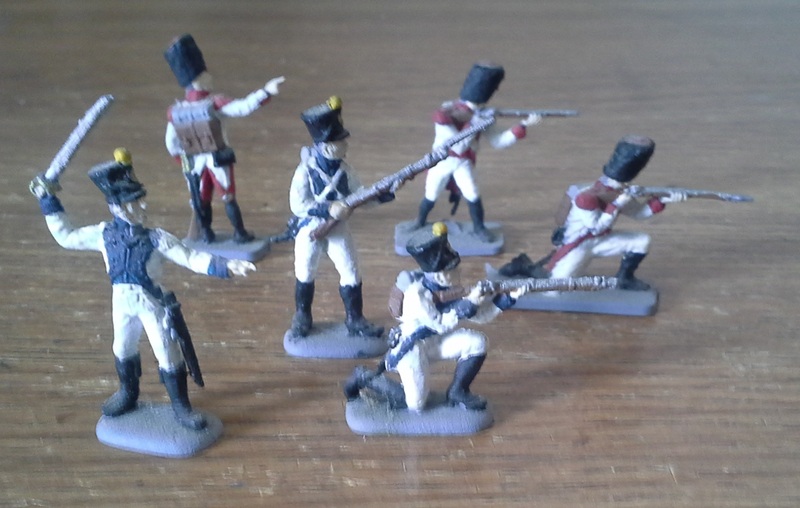 Danish Line and Grenadiers, converted from Esci 227 "French Line Infantry". 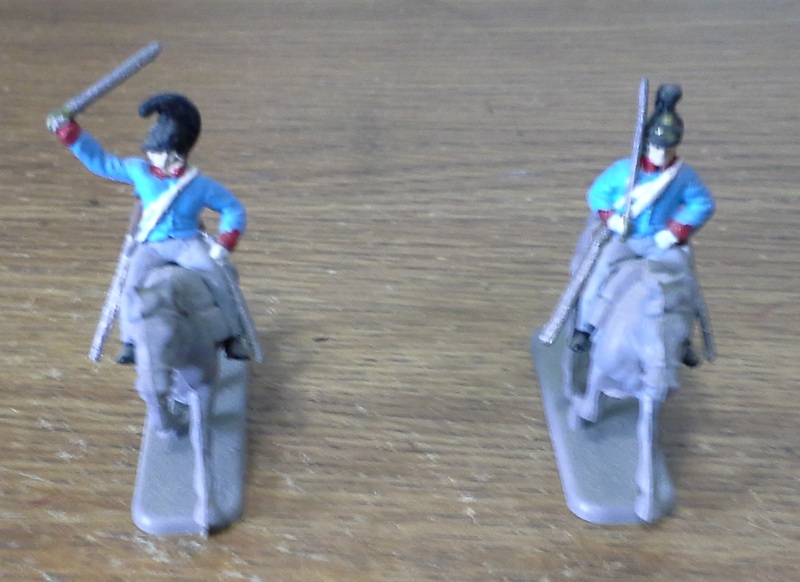 The grenadiers have the extra Scots Greys heads from HaT 8033 "British Heavy Dragoons". 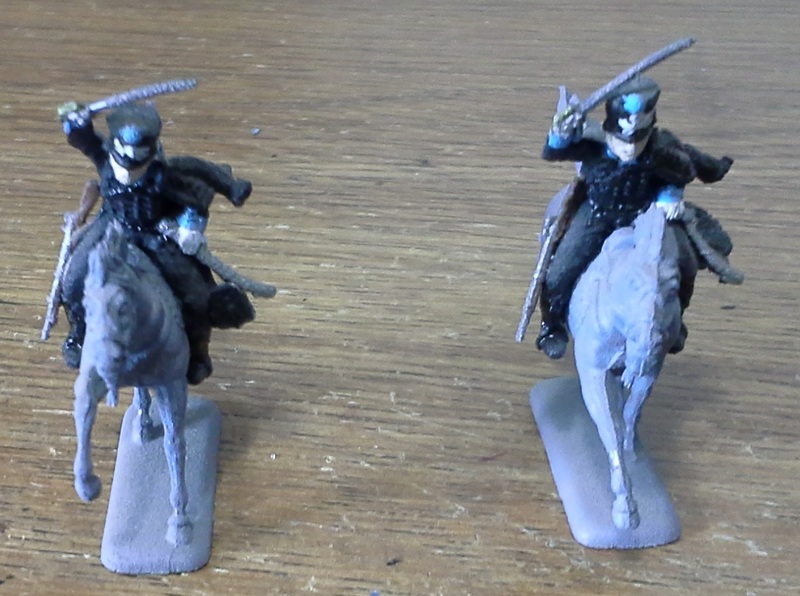 Danish Uhlans, converted from Esci 218 "Polish Lancers French Cavalry". 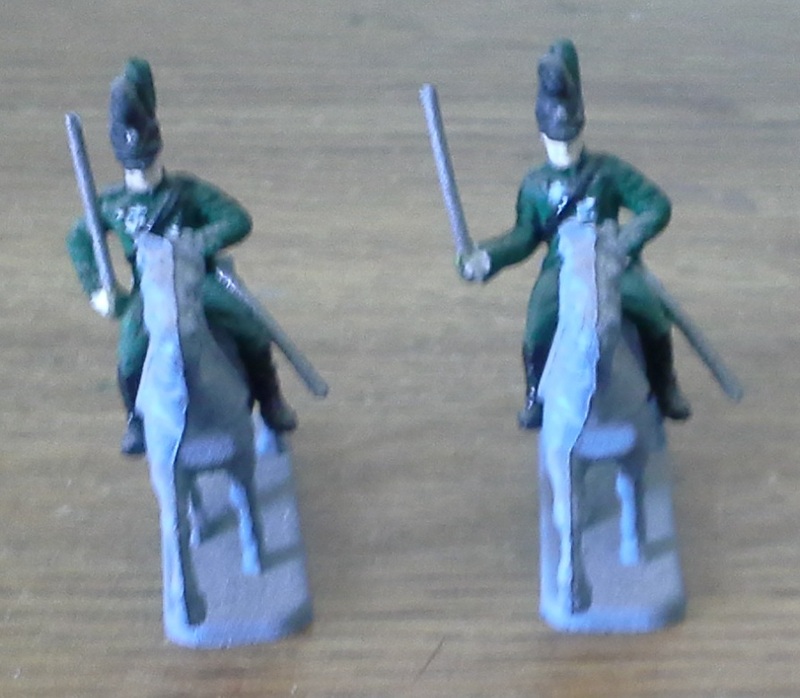 Danish Dragoons, converted from HaT 8030 "Bavarian Cavalry". 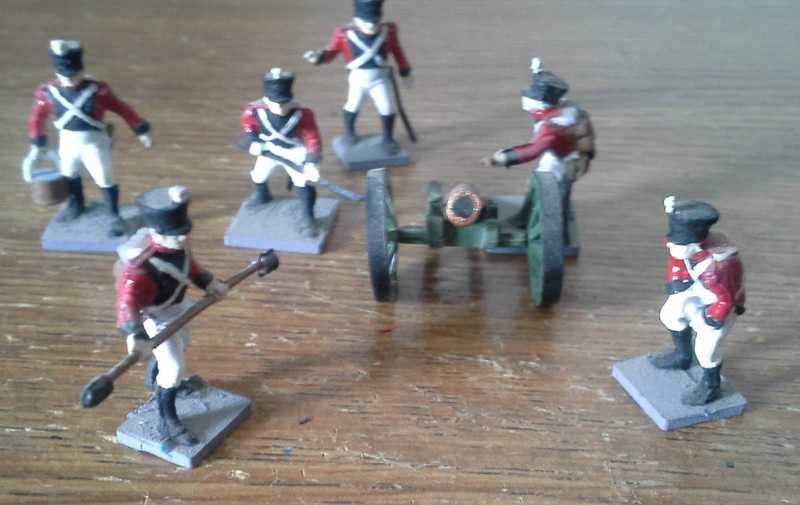 Danish Artillery, converted from Airfix 1737 "Waterloo French Artillery". 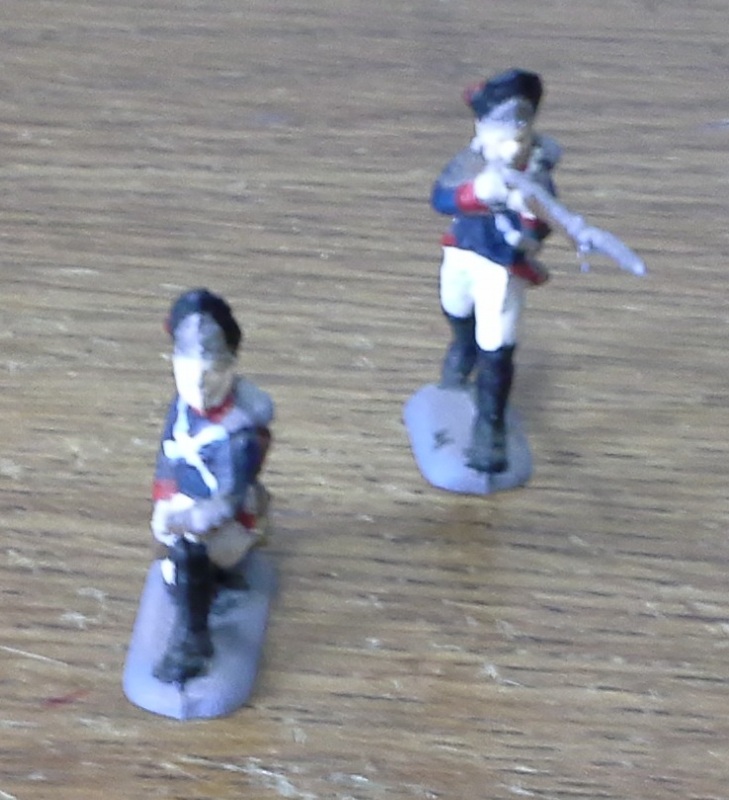 French Chasseurs, converted from Revell 2570 "French Grenadier Guards". 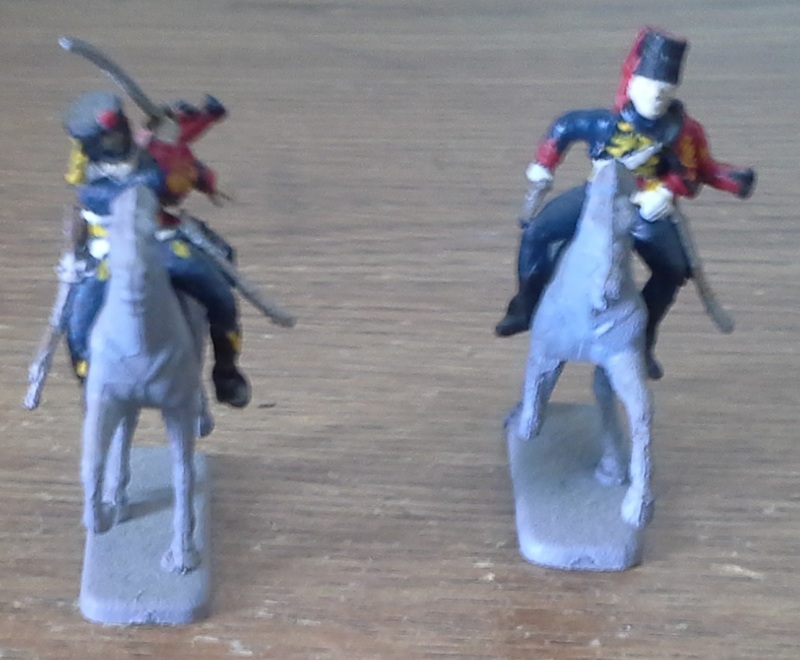 French Line Lancers, converted from Esci 218 "Polish Lancers French Cavalry" with shakos from Esci 227 "French Line Infantry". 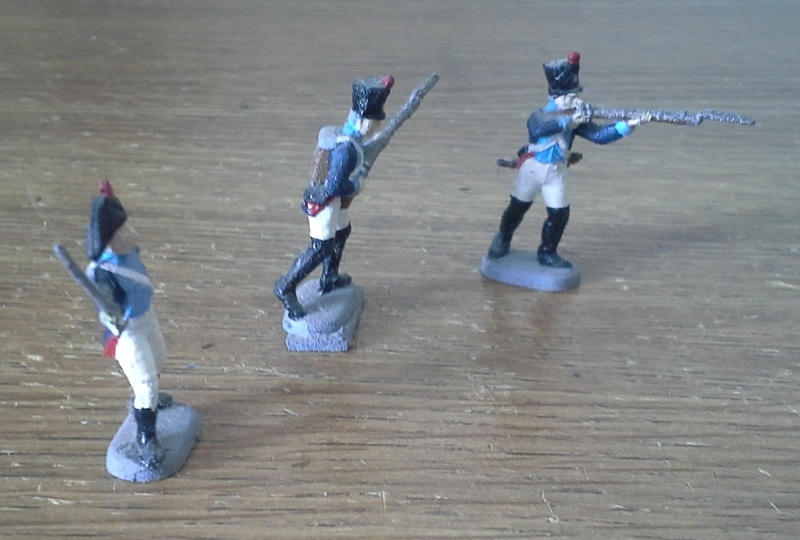 French Chasseurs late, converted from HaT 8029 "French Line Chasseurs" with Austrian infantry heads from Esci 226 "Prussian and Austrian Infantry". 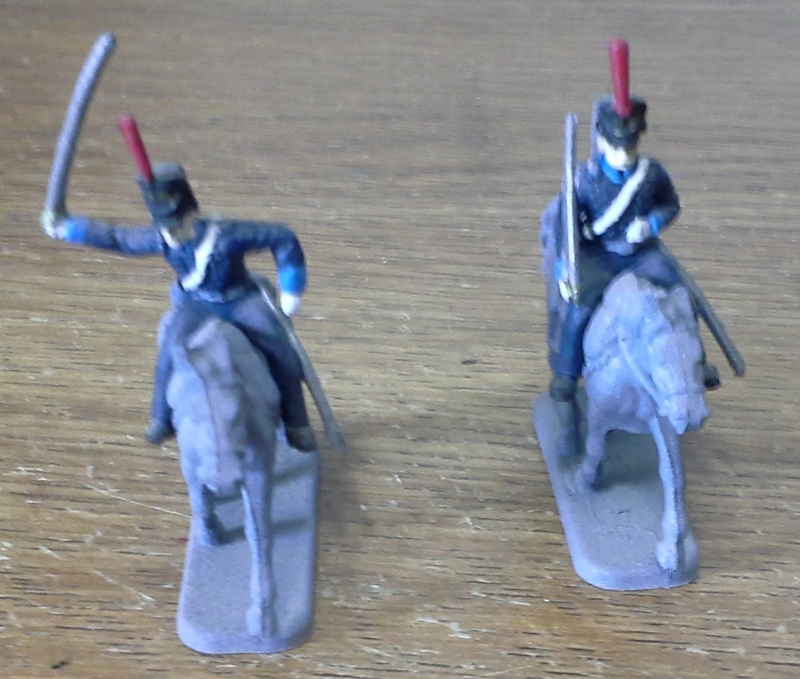 French Eclaireurs, converted from Esci 218 "Polish Lancers French Cavalry" with the extra heads from HaT 8032 "Dutch Belgian Light Dragoons". 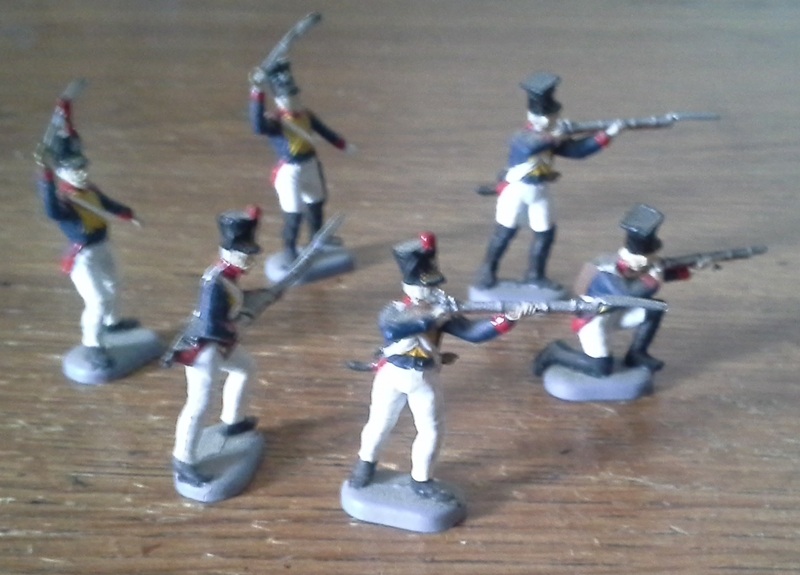 Frankfurt infantry, converted from Esci 227 "French Line Infantry". 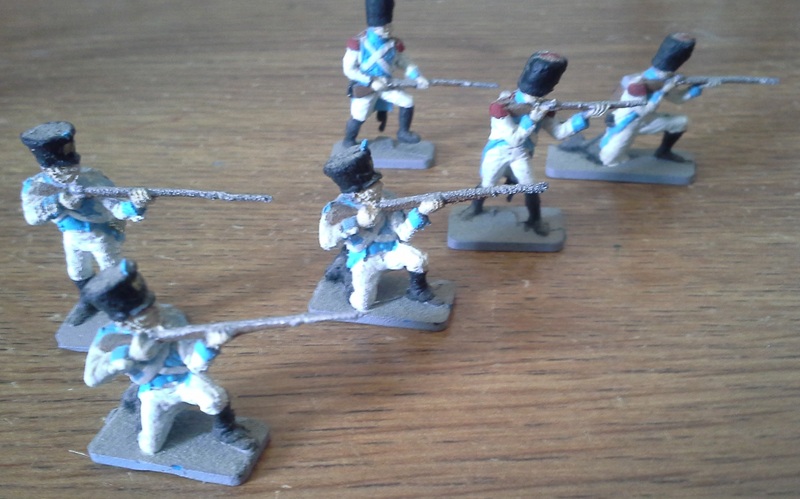 Mecklenburg Infantry, converted from Airfix 1744 "Waterloo French Infantry". 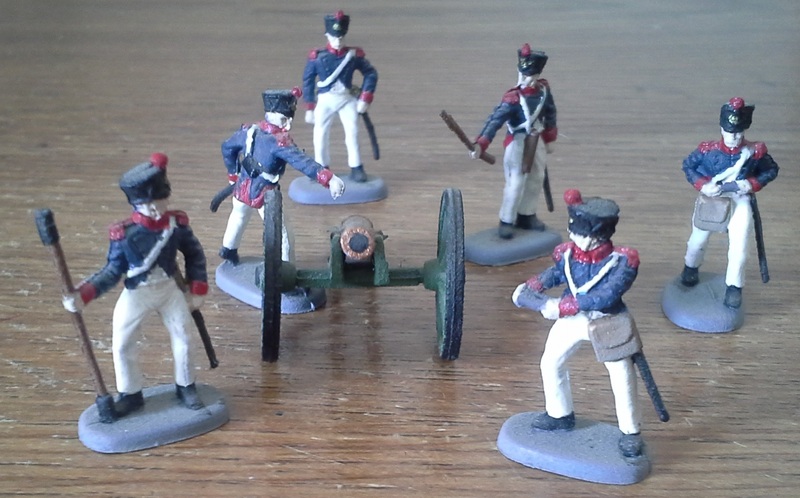 Mecklenburg Artillery, converted from Airfix 1737 "Waterloo French Artillery". 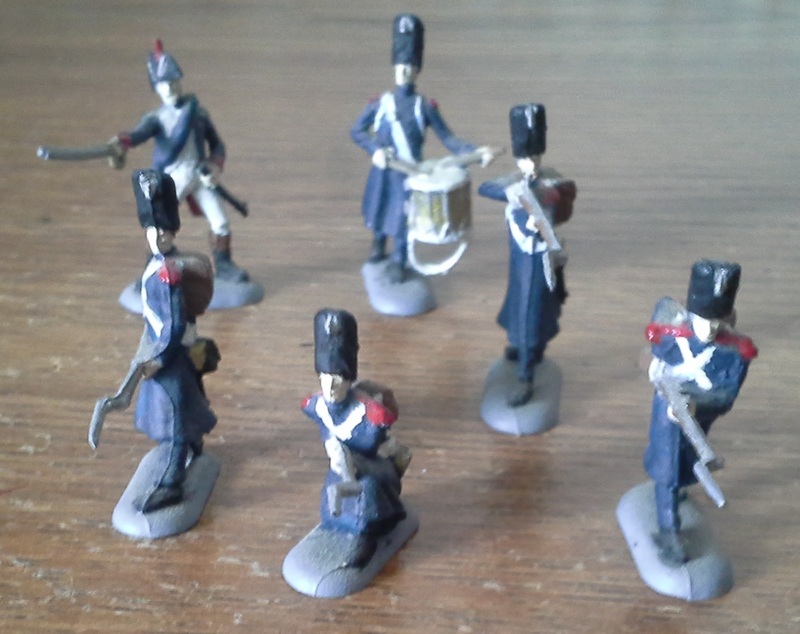 Italian Line and Grenadiers, converted from Airfix sets 1744 "Waterloo French Infantry" for the line and 1749 "Waterloo French imperial Guard" for the grenadiers. 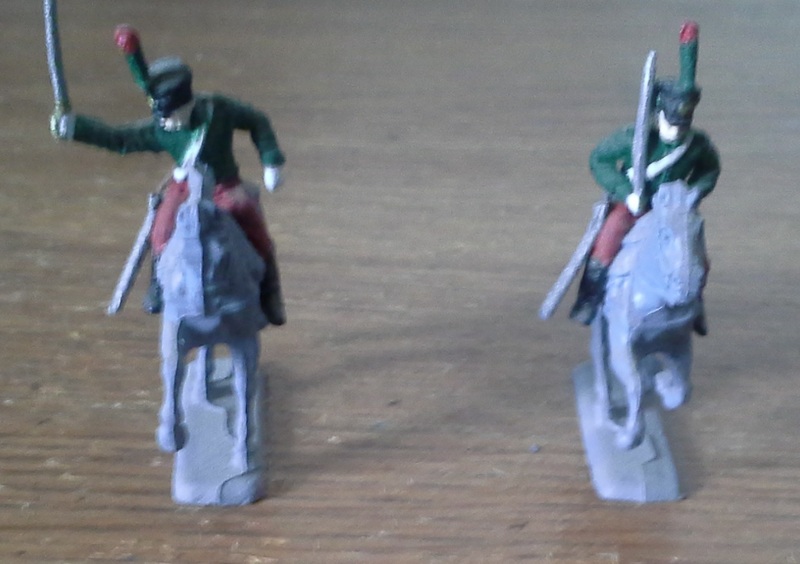 Italian Dragoons, converted from HaT 8009 "French Dragoons". 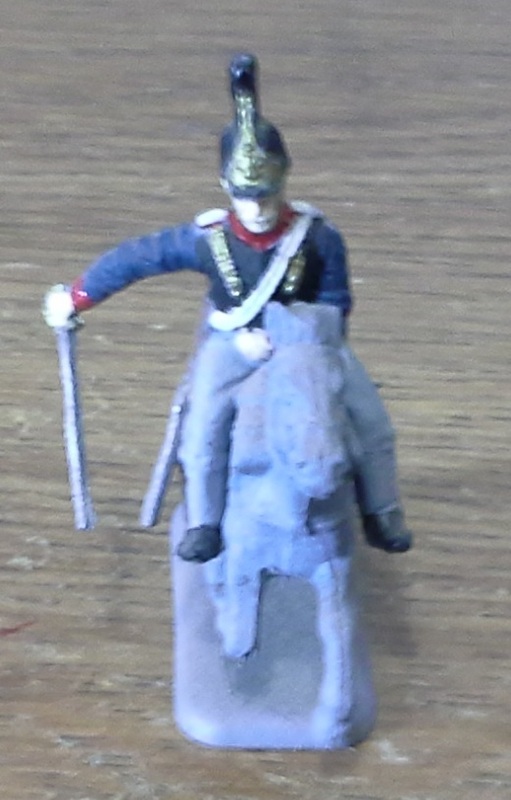 Italian Garde du Honor, converted from Revell 2578 "British Life Guards"
Italian Horse Artillery, converted from Italeri 6018 "French Line/Guard Artillery". 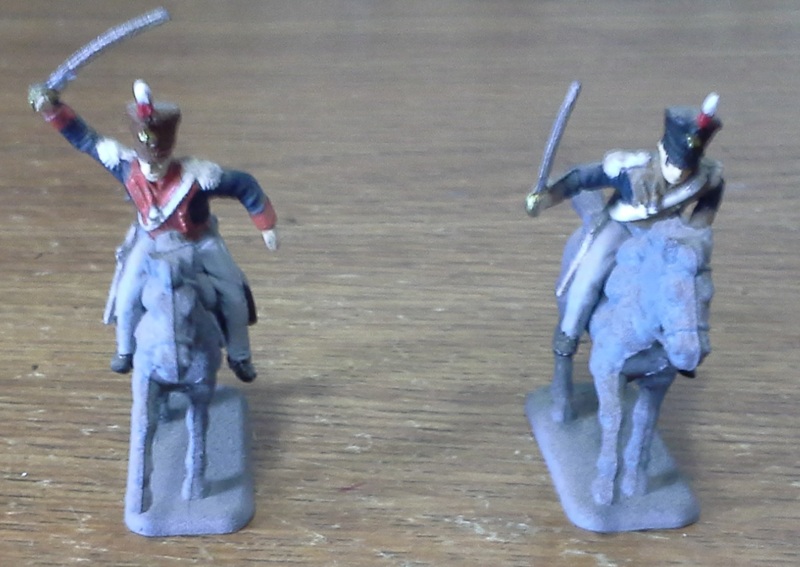 Polish Line and Grenadiers, converted from Esci 227 "French Line Infantry" with czapka from Esci 218 "Polish Lancers French Cavalry". 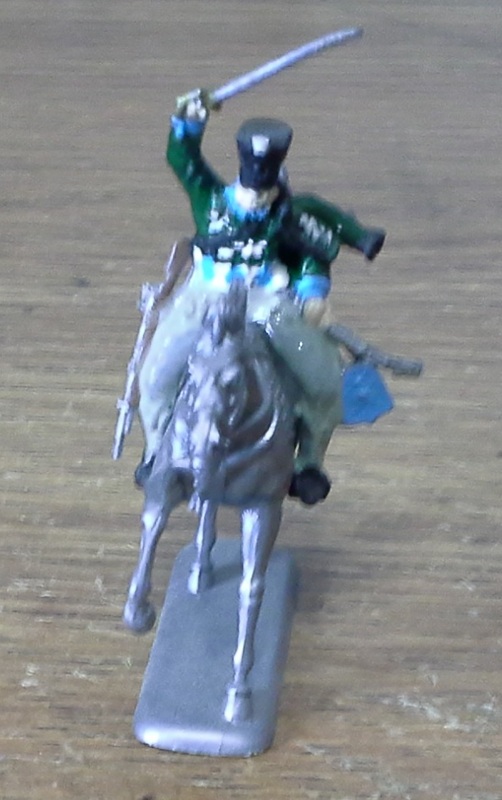 Polish Krakus, converted from HaT 8005 "Prussian Uhlans" with czapka (with peak removed) from Esci 218 "Polish Lancers French Cavalry". 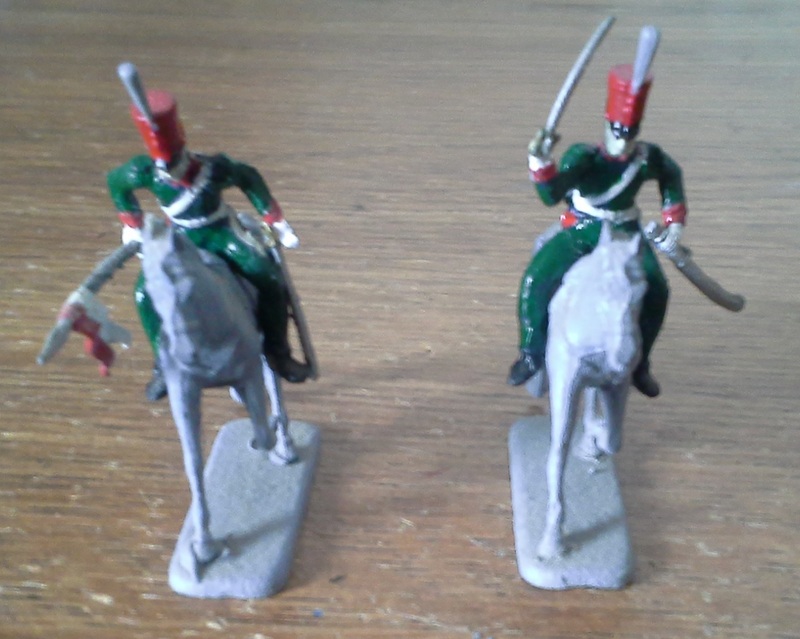 Polish Hussars, converted from Esci 230 "British Light Dragoons" with shakos from Esci 227 "French Line Infantry". 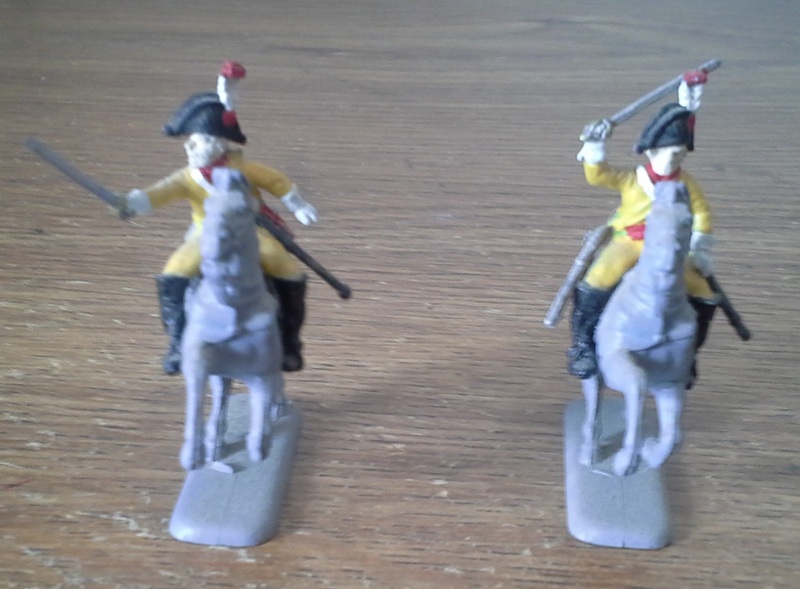 Polish Cuirassiers, converted from Esci 235 "French Cuirassiers". 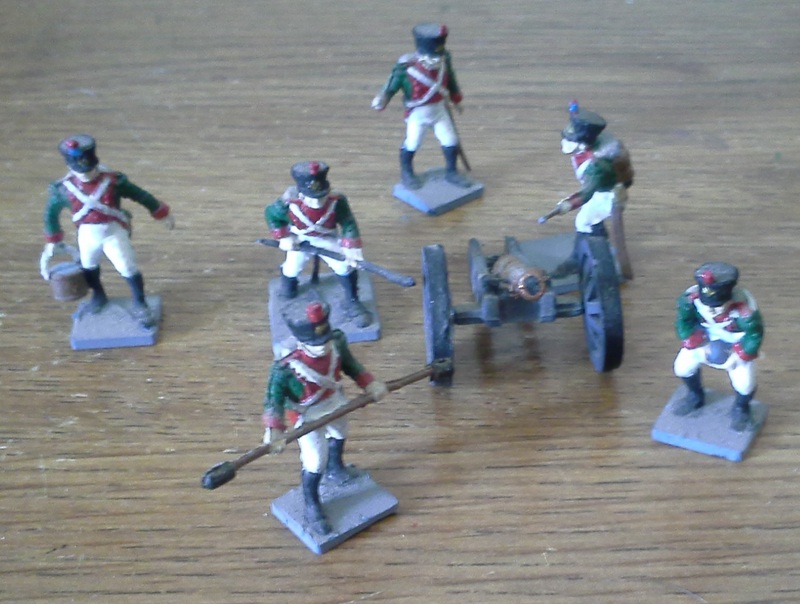 Polish Foot Artillery, converted from Airfix 1737 "Waterloo French Artillery". 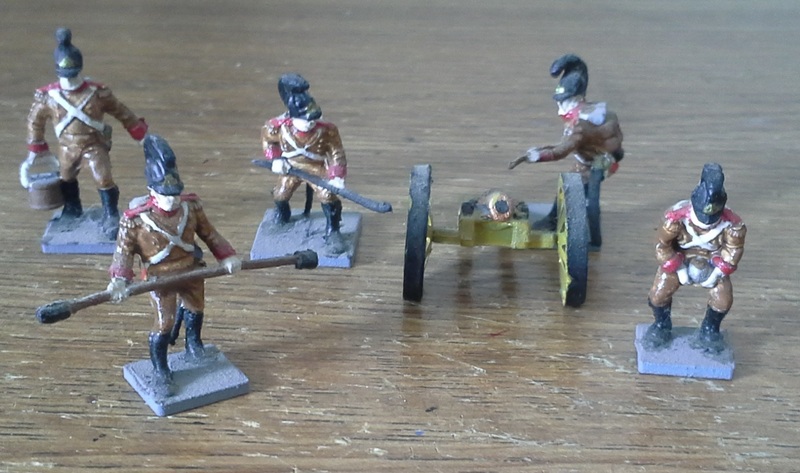 Polish Horse Artillery, converted from Esci 234 "French Artillery" with heads from Airfix 1743 "Waterloo British Cavalry (Hussars). 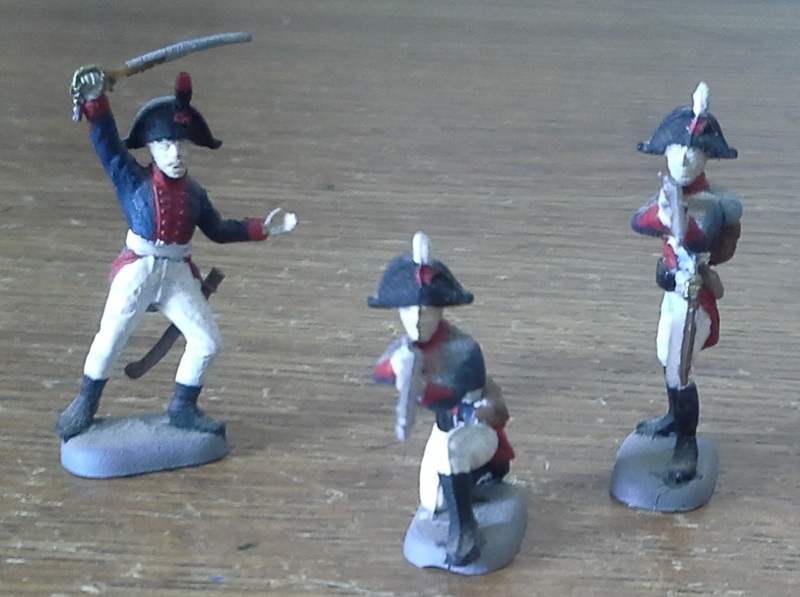 Naples Line and Grenadiers, converted from Esci sets 227 "French Line Infantry" and 214 "French Imperial Guard". 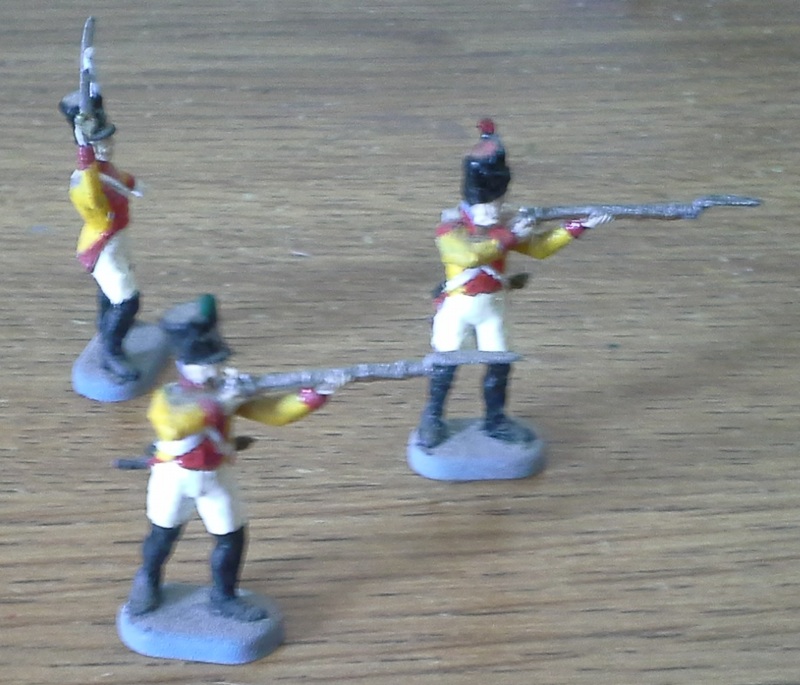 Naples Chasseurs, converted from Hat 8029 "French Chasseurs" for both units. 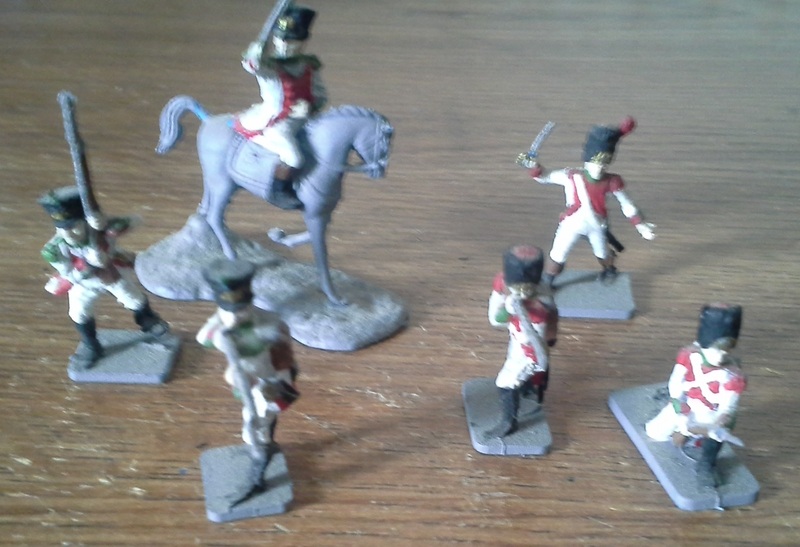 Naples Dragoons, converted from Italeri 6015 "French Dragoons". 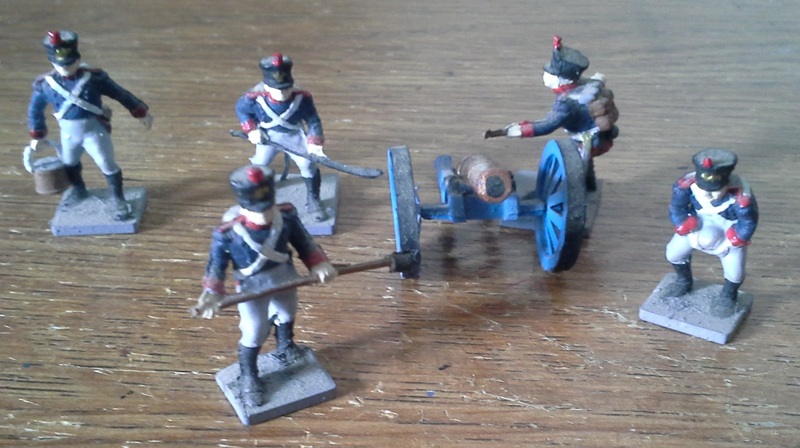 Naples Horse Artillery, converted from Italeri 6018 "French Line/Guard Artillery". 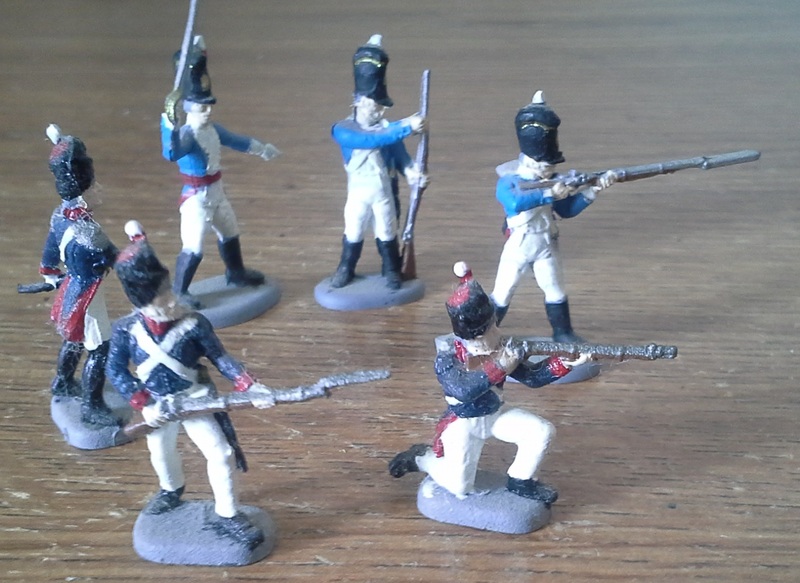 Swedish Line and Grenadiers, converted from Esci sets 236 "Russian Grenadiers" with heads from Esci 214 "French Imperial Guard" for the grenadiers. 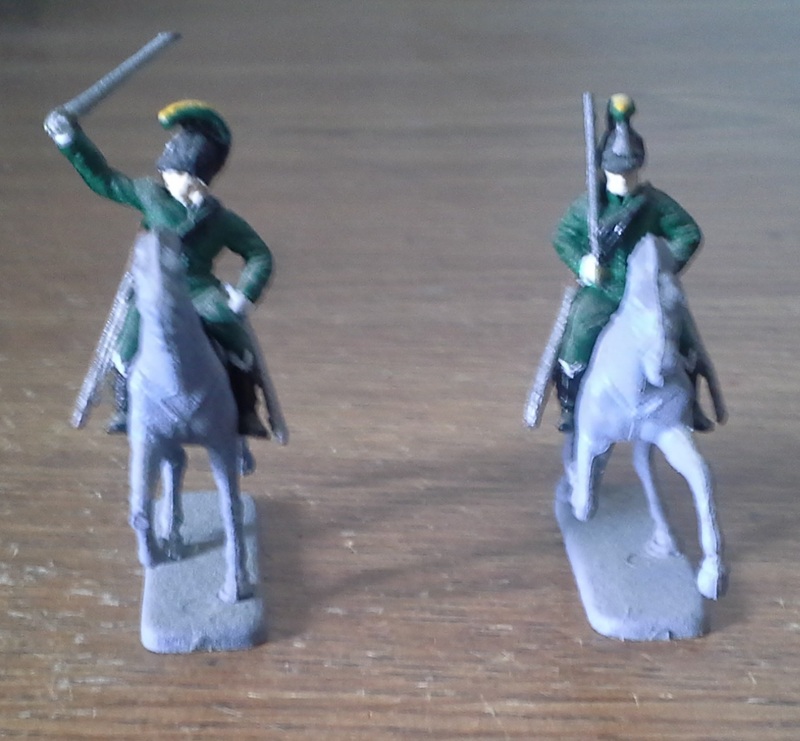 Swedish Hussars, converted from Esci 230 "British Light Dragoons" with heads from Esci 236 "Russian Grenadiers". 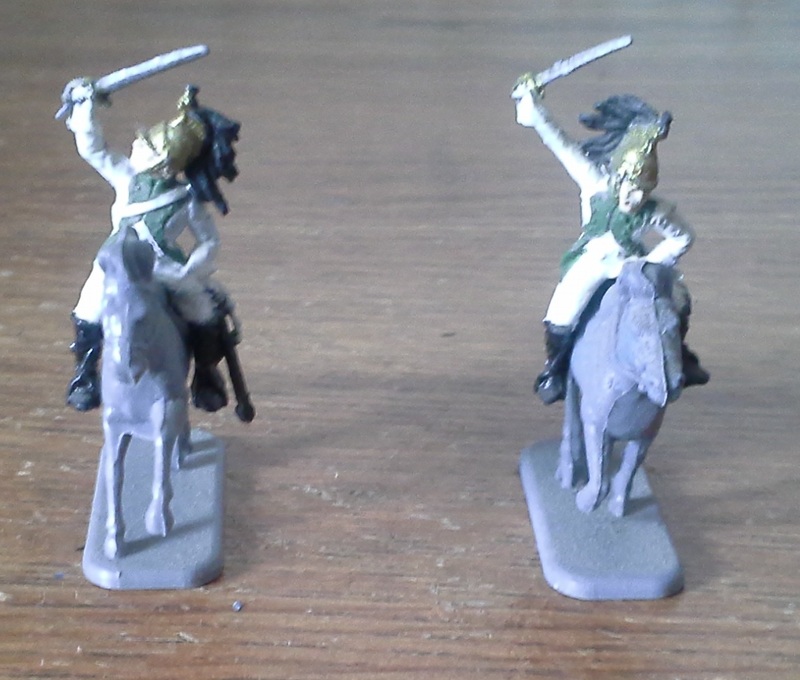 Swedish Cuirassiers, converted from HaT 8015 Austrian Cuirassiers. 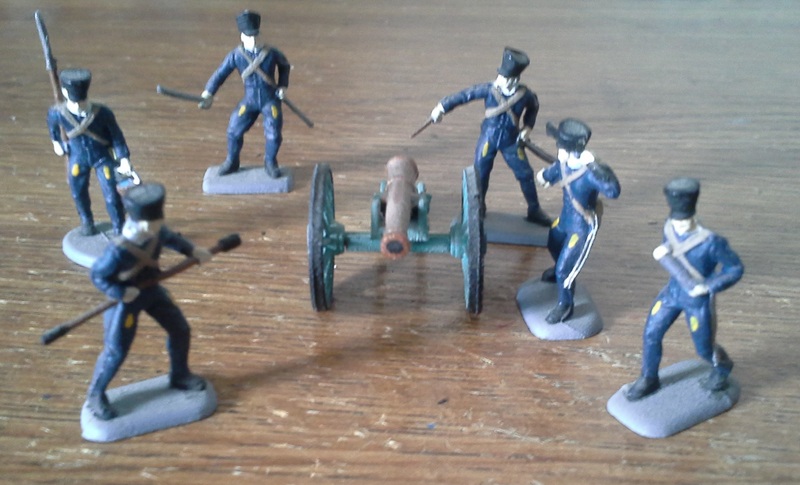 Swedish Artillery, converted from HaT 8007 "Prussian Artillery". With the Swedish army they used hats that were convenient so a lot of possible variations are available with all of their soldiers. 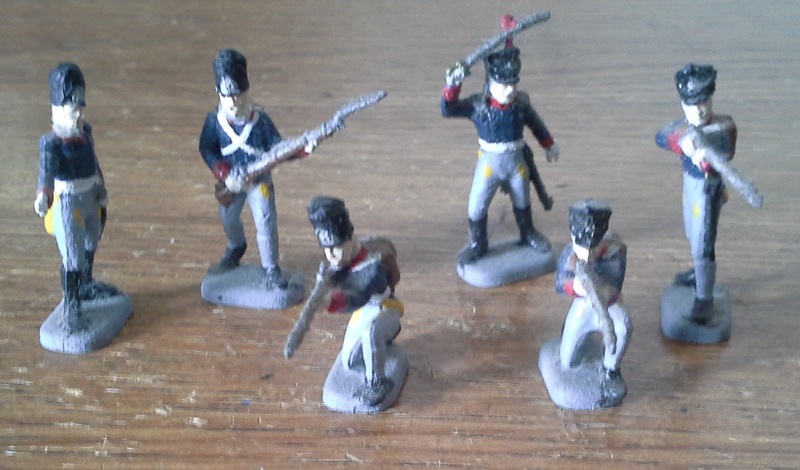 American War of 1812 Infantry. 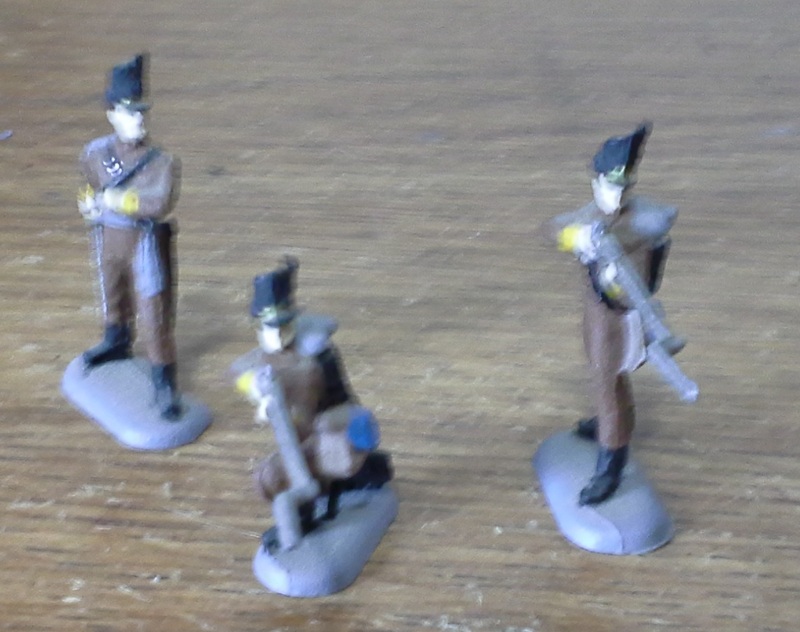 From left, converted from Imex 509 "Alamo Defenders", HaT 8036 "British Light Infantry" and Esci 215 "British Infantry". 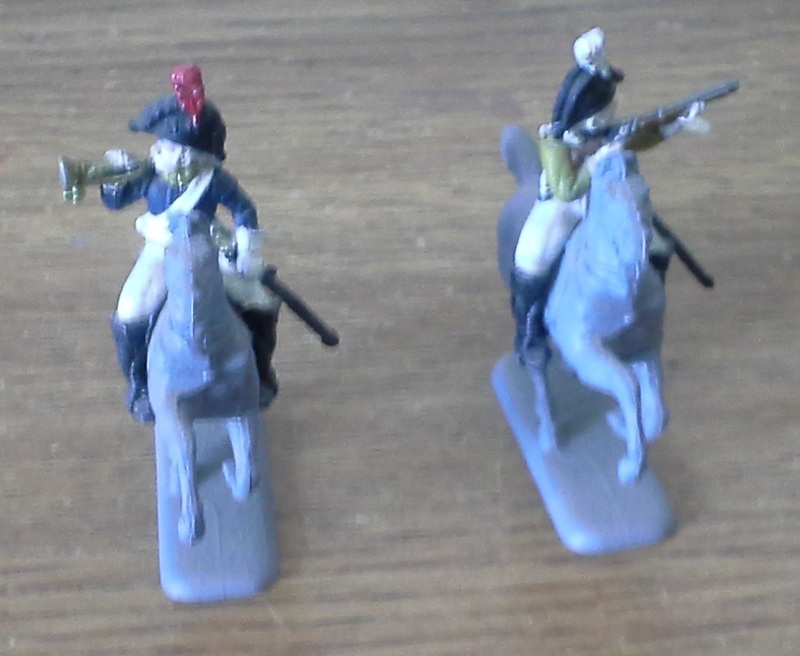 American War of 1812 Dragoons, converted from Airfix 1736 "Waterloo French Cavalry (Cuirassiers)." 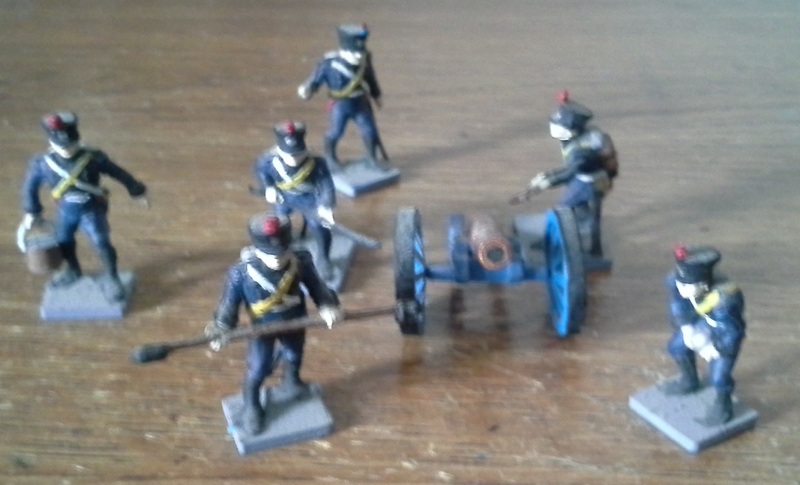 American War of 1812 Artillery, converted from Airfix 1746 "Waterloo British Artillery" with added Belgic shakos. 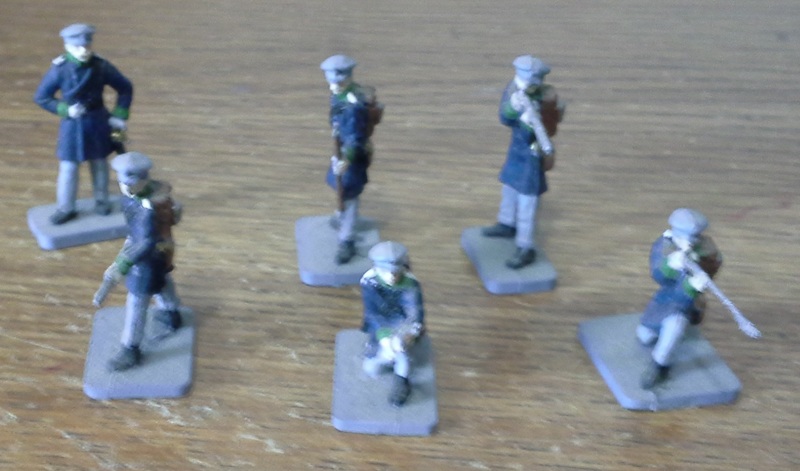 British infantry and Highlanders, converted from Revell 2571 "British Infantry" for line and Esci 215 "British Infantry" legs with Highlander upper body and trimmed down the bonnet. 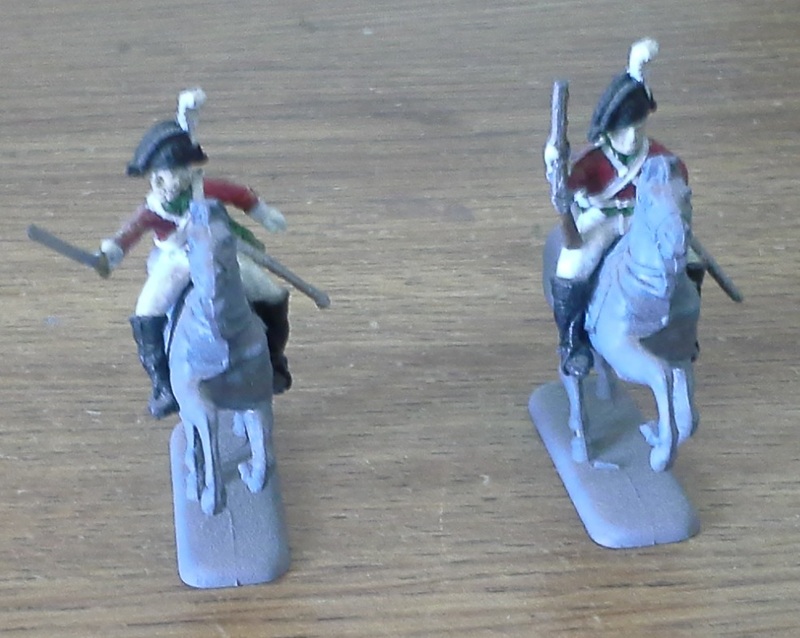 British Dragoons, converted from HaT 8014 "KGL Light Dragoons". 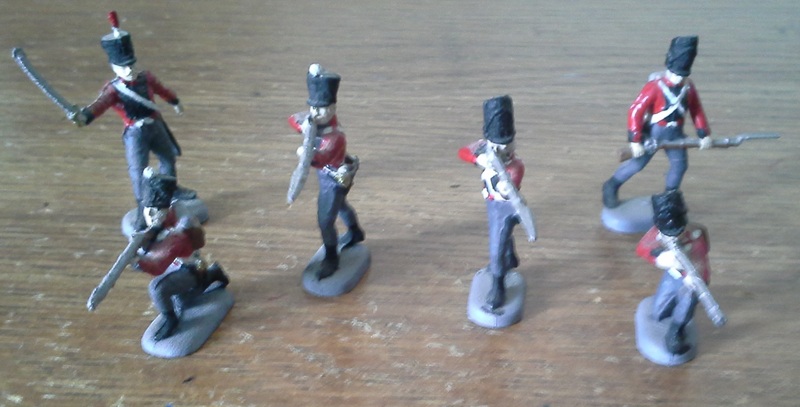 British Artillery, converted from Esci 233 "British Artillery" with regular shako. 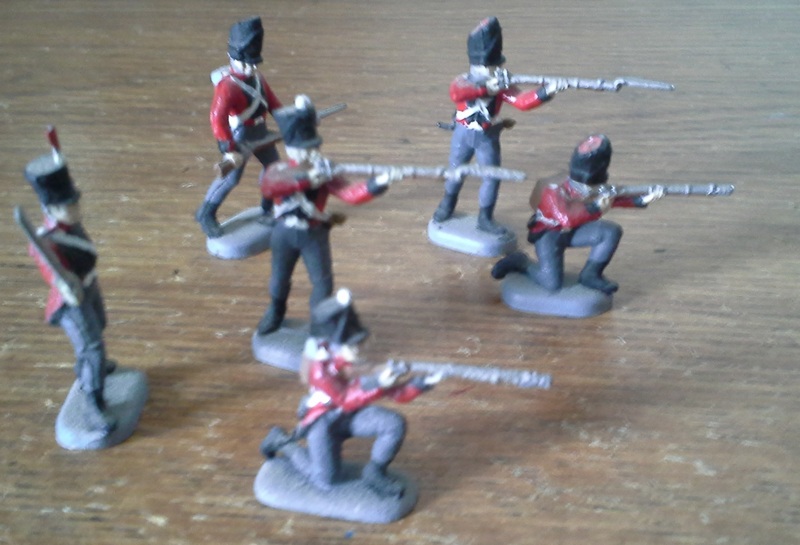 Portuguese infantry, converted from Revell 2571 "British Infantry". 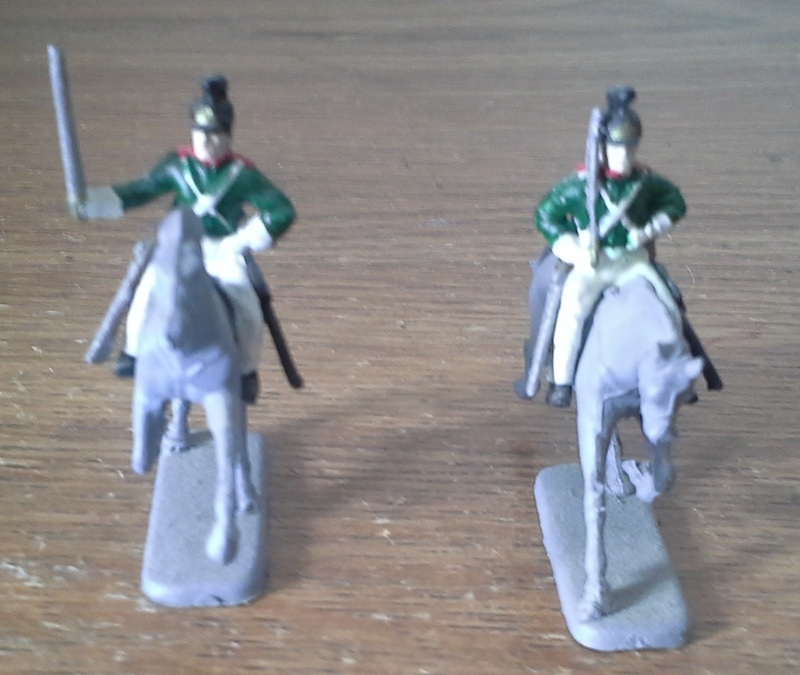 Portuguese Dragoons, converted from HaT 8032 "Dutch/Belgian Light Dragoons". 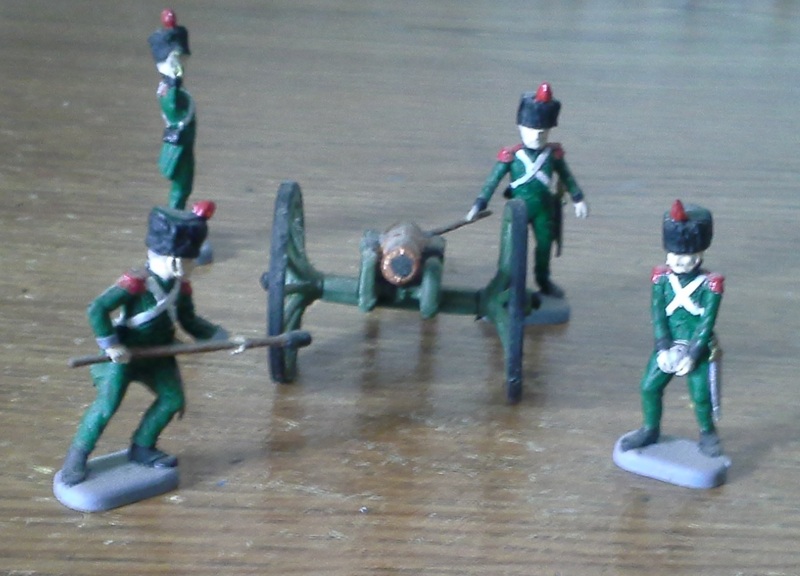 Portuguese Artillery, converted from Esci 233 "British Artillery" with Belgic shako. 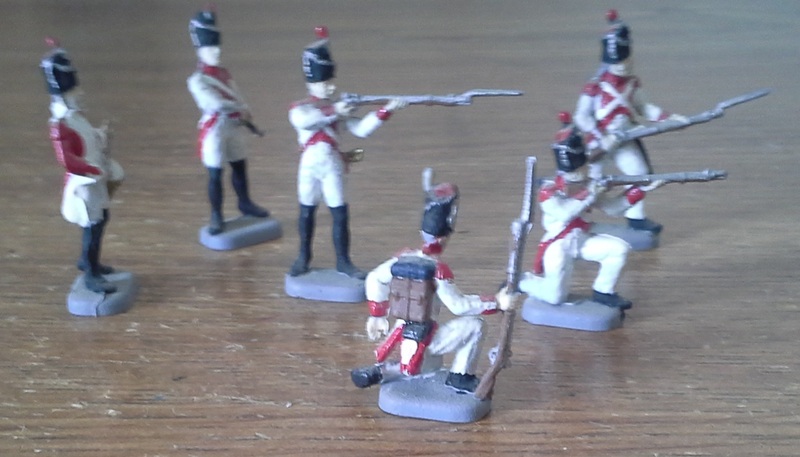 Spanish infantry, converted from HaT 8036 "British Light Infantry". 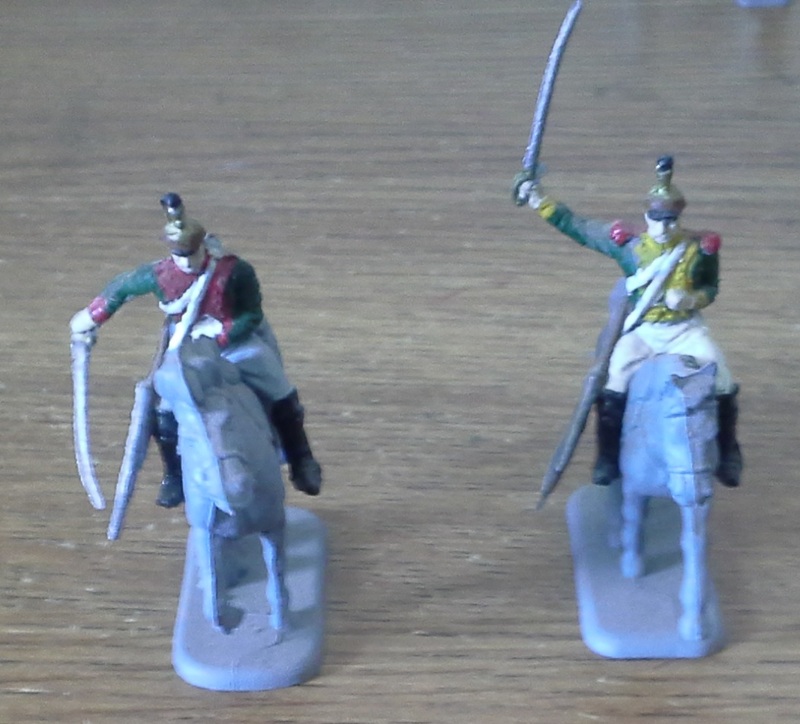 Spanish Cuirassiers, converted from Esci 235 "French Cuirassiers". 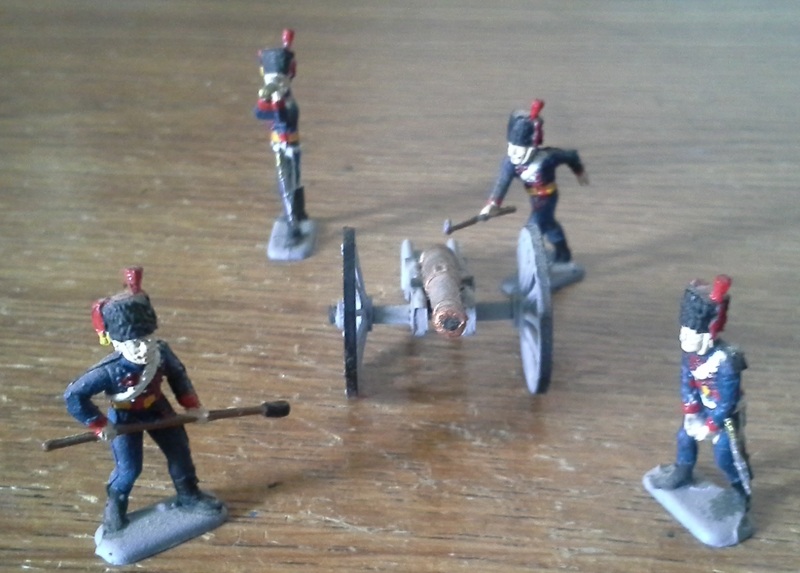 Spanish Artillery, converted from Esci 233 "British Artillery" with regular shako. 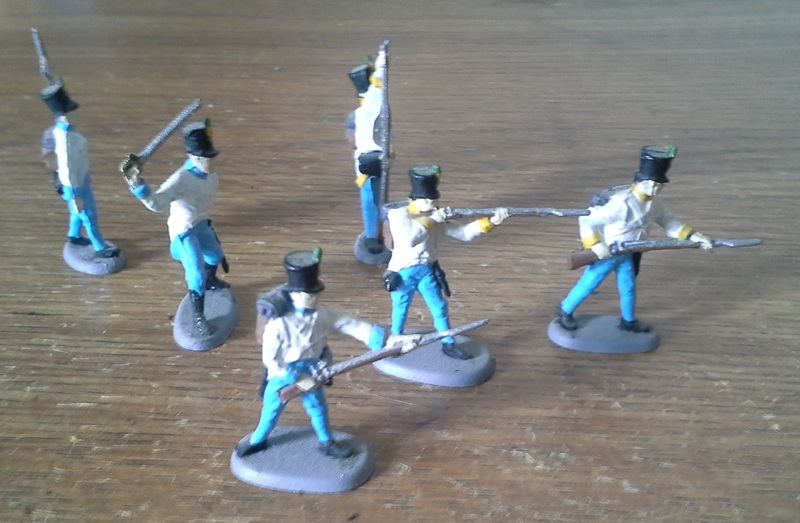 Oldenburg infantry, converted from Airfix 1756 "Prussian Infantry 1815". 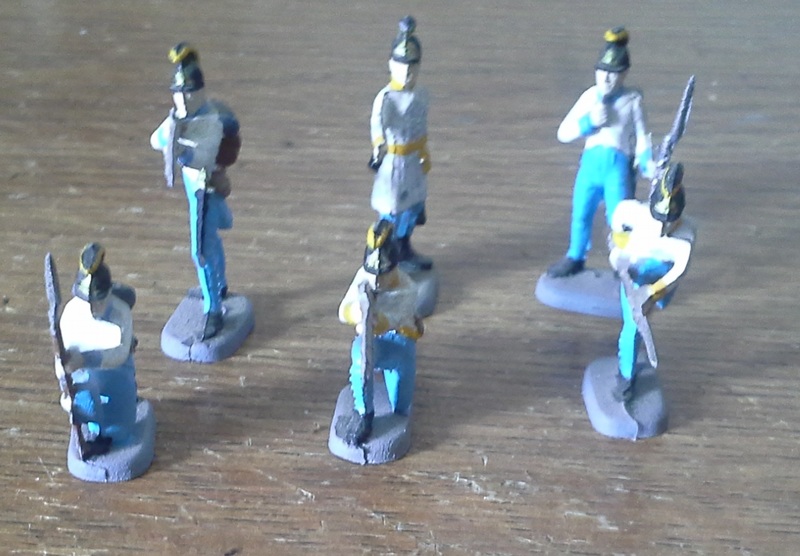 Kurhessische Legion Grenadiers, converted from the grenadier figures from Italeri 6005 "Austrian Grenadiers and Infantry". 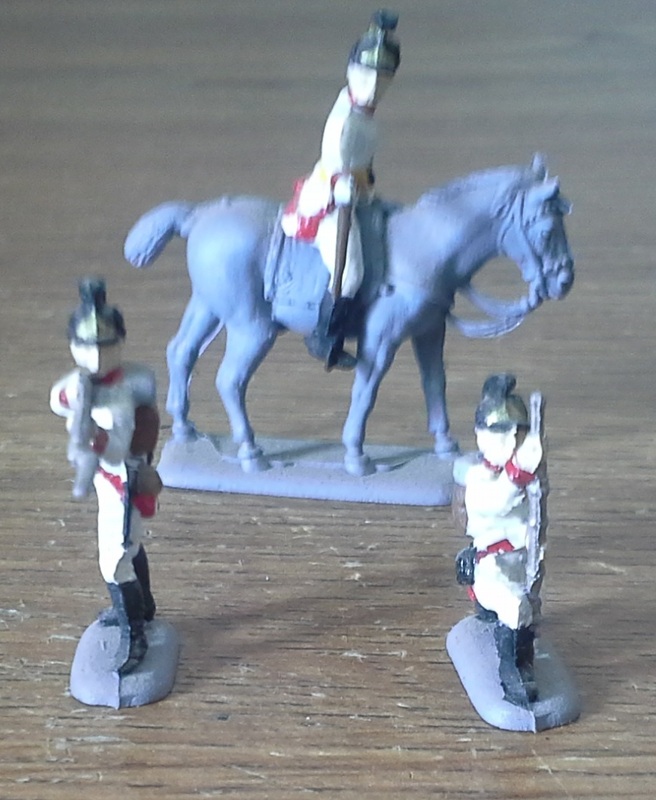 Kurhessische Dragoons, converted from HaT 8031 "Austrian Chevauxleger". 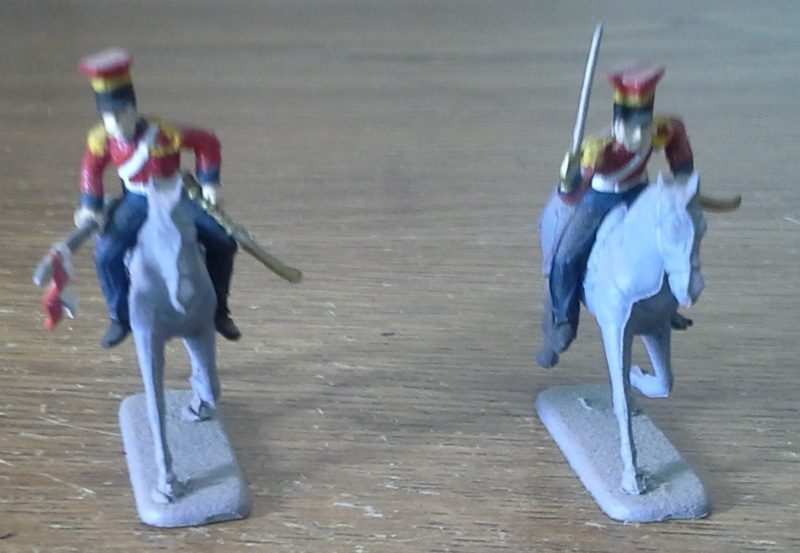 Hesse-Kassel Hussars, converted from Esci 230 "British Light Dragoons". 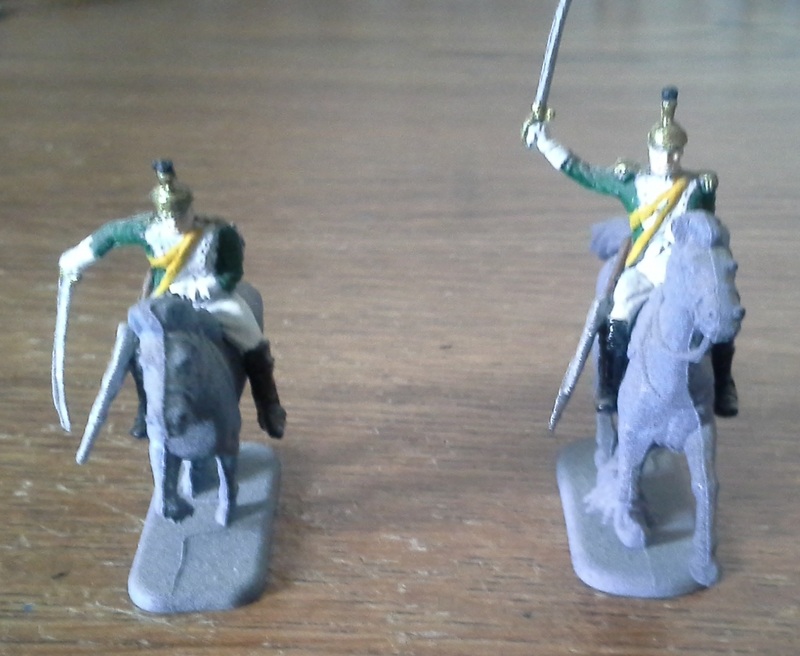 Hesse-Kassel Dragoons, converted from HaT 8032 "Dutch/Belgian Light Dragoons". 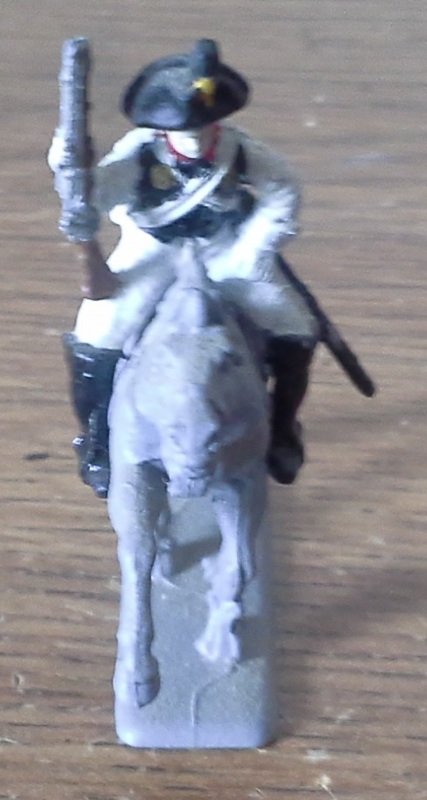 Hesse-Kassel Garde du Corps, converted from HaT 8015 "Austrian Cuirassiers" with heads from HaT 8030 "Bavarian Cavalry". 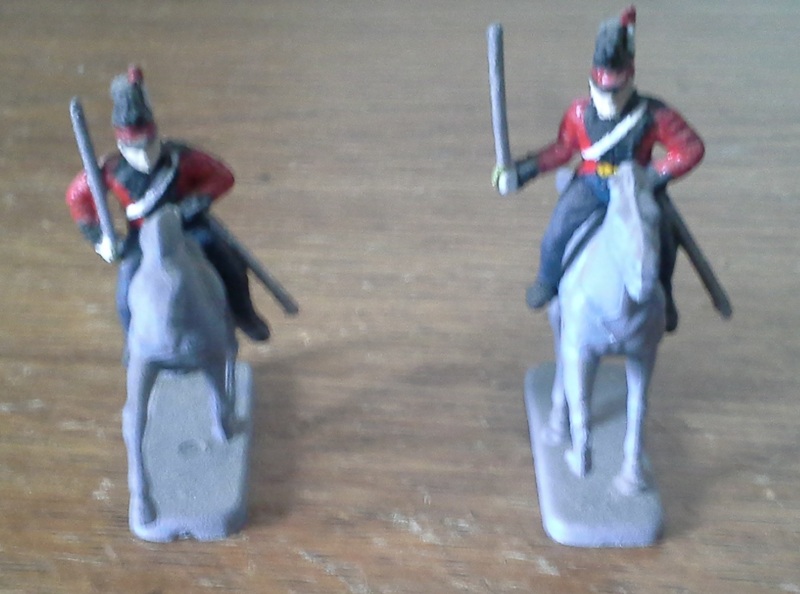 British Dragoons two units, converted from HaT 8014 "KGL Light Dragoons". 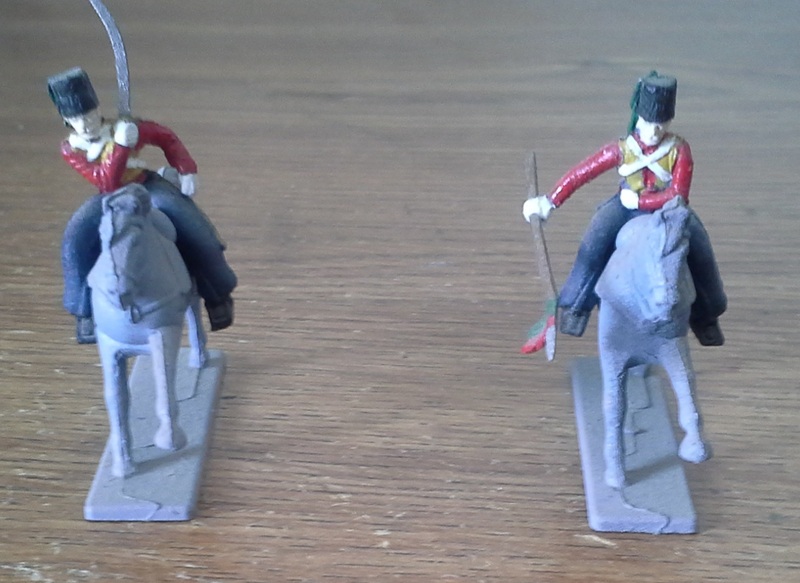 British Hussars, converted from Italeri 6008 "French Hussars". 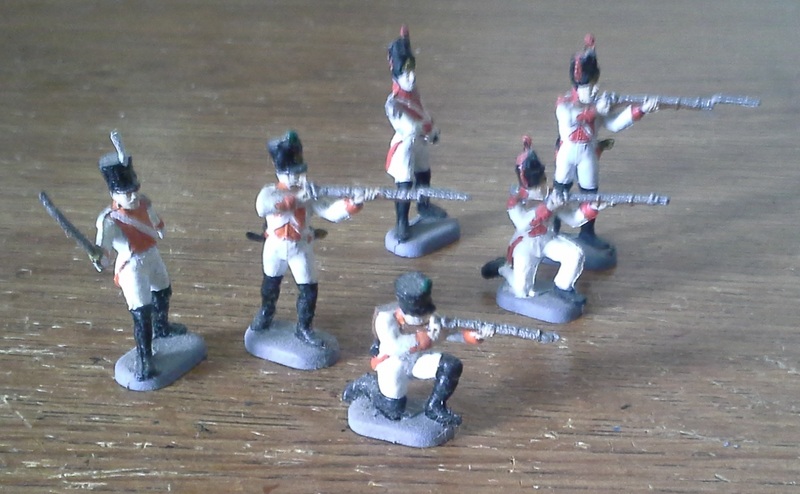 Kings German Legion infantry, converted from Airfix 1745 "Waterloo British Infantry". 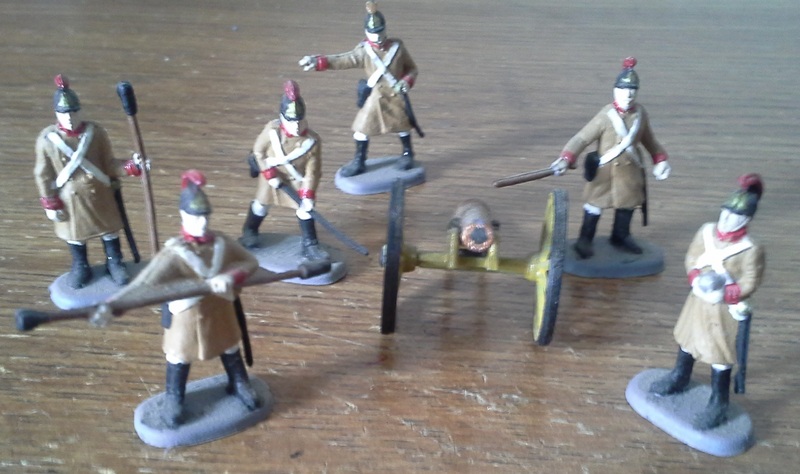 Kings German Legion Artillery, converted from Esci 233 "British Artillery" with Belgic shako. 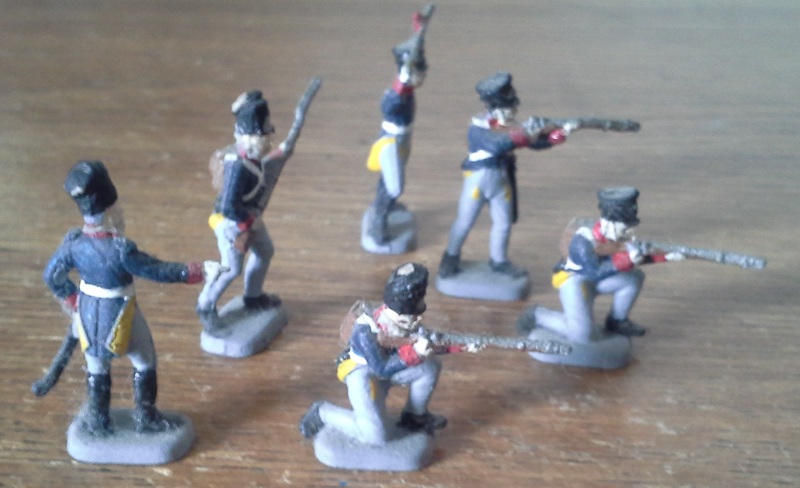 Belgian Infantry, converted from Revell 2571 "British Infantry". 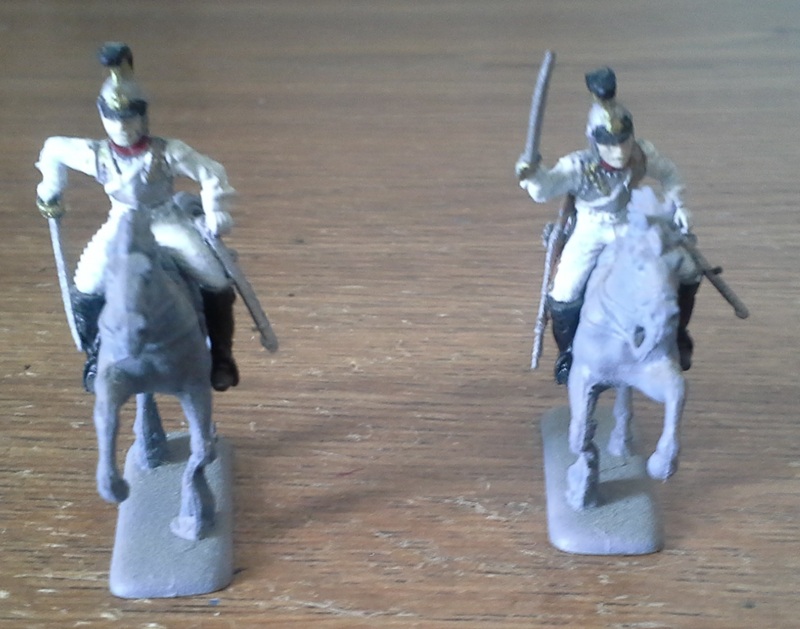 Brunswick Uhlans, converted from Esci 218 "Polish Lancers French Cavalry". 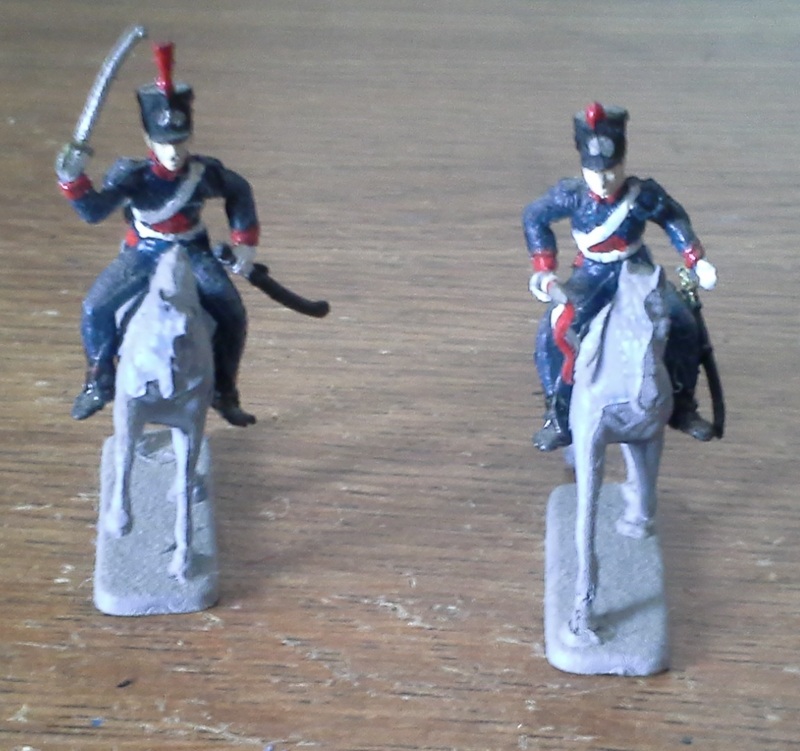 Brunswick Hussars, converted from Italeri 6008 "French Hussars". 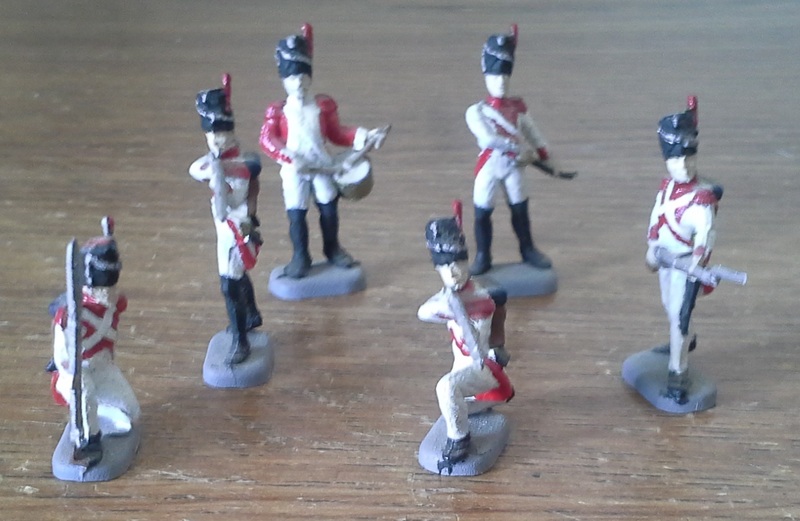 Brunswick Artillery, converted from Airfix 1746 "Waterloo British Artillery" with Belgic shako. 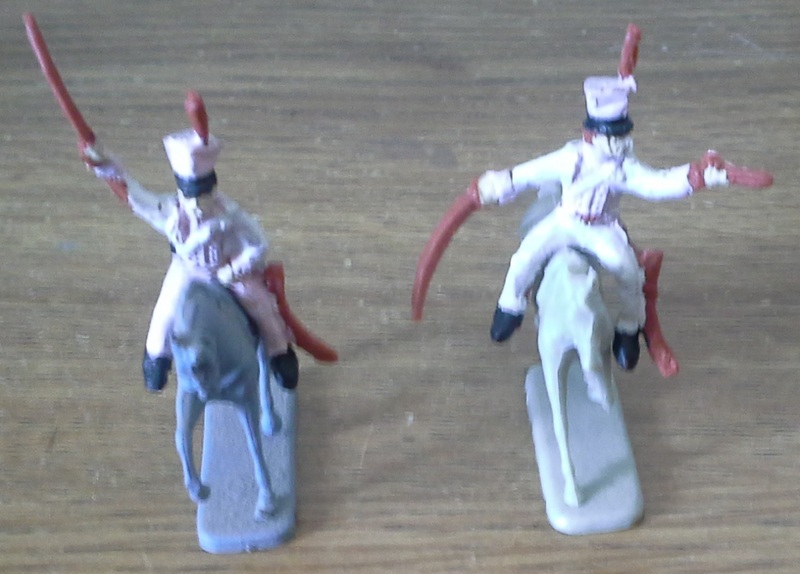 Prussian Towarczys, converted from Esci 218 "Polish Lancers French Cavalry" with heads from HaT 8006 "Russian Cossacks". 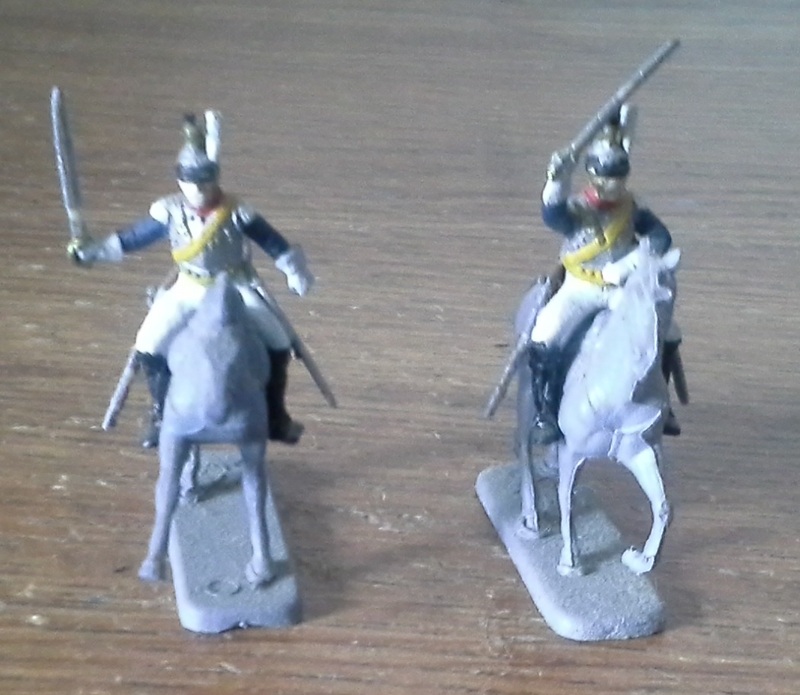 Prussian Hussars early, converted from Revell 2575 "Seven Years War Prussian Hussars". 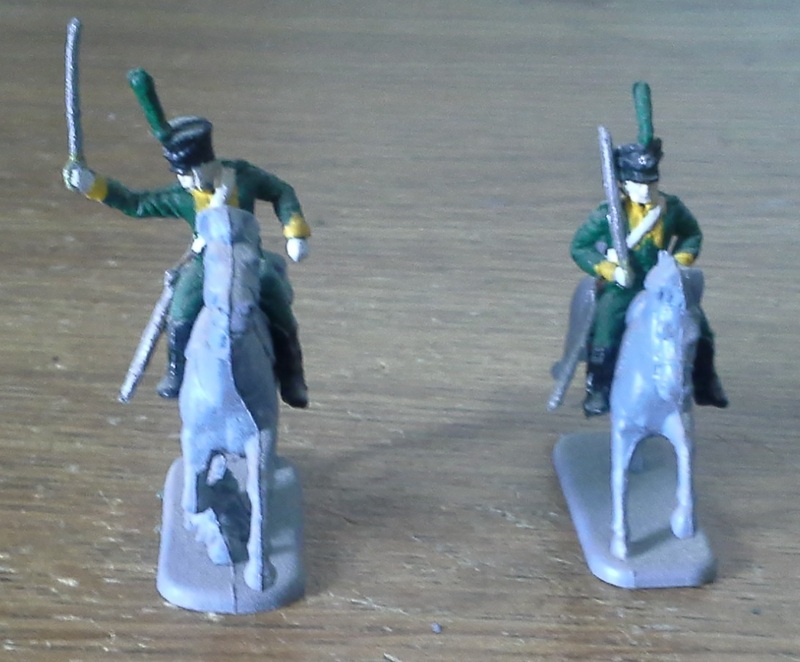 Prussian Guard Cossacks, converted from Italeri 6042 "Cossack Cavalry". 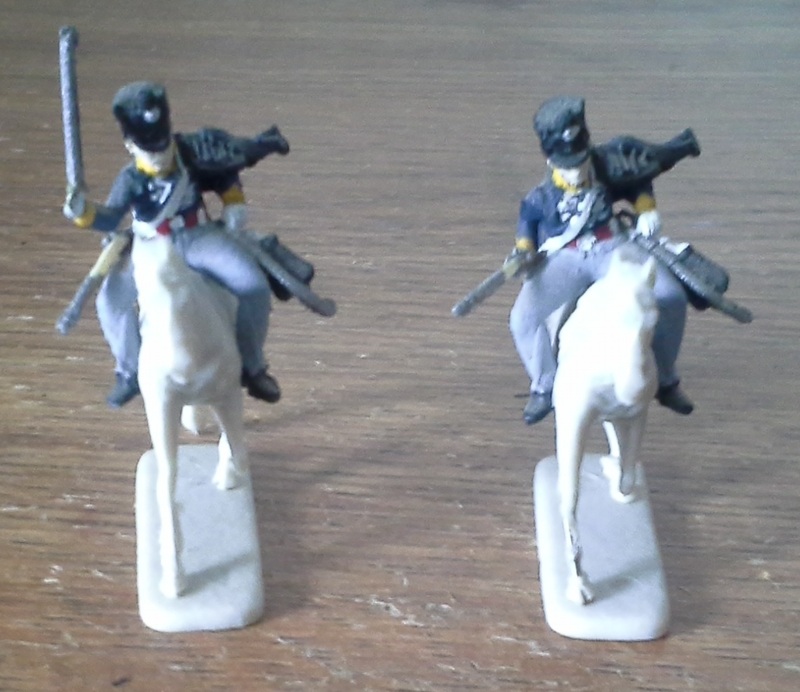 Prussian Life Uhlans, converted from Esci 218 "Polish Lancers French Cavalry". 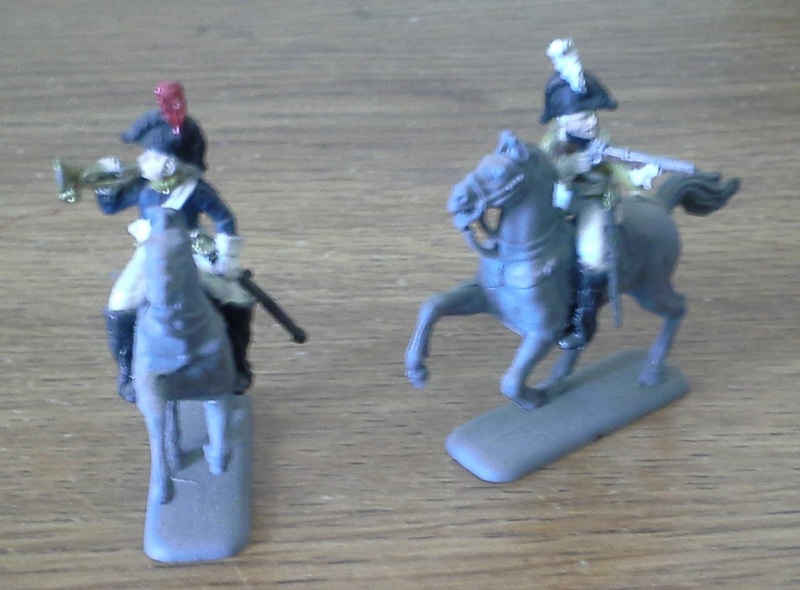 Prussian Brandenburg Cuirassiers late, converted from HaT 8016 "Russian Cuirassiers". 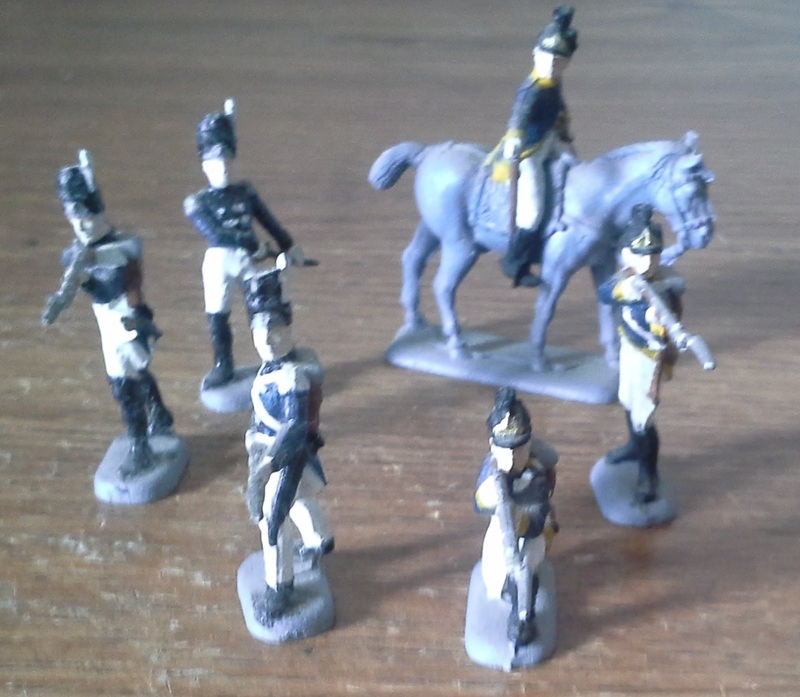 Prussian 2nd Life Hussars, converted from Italeri 6008 "French Hussars". 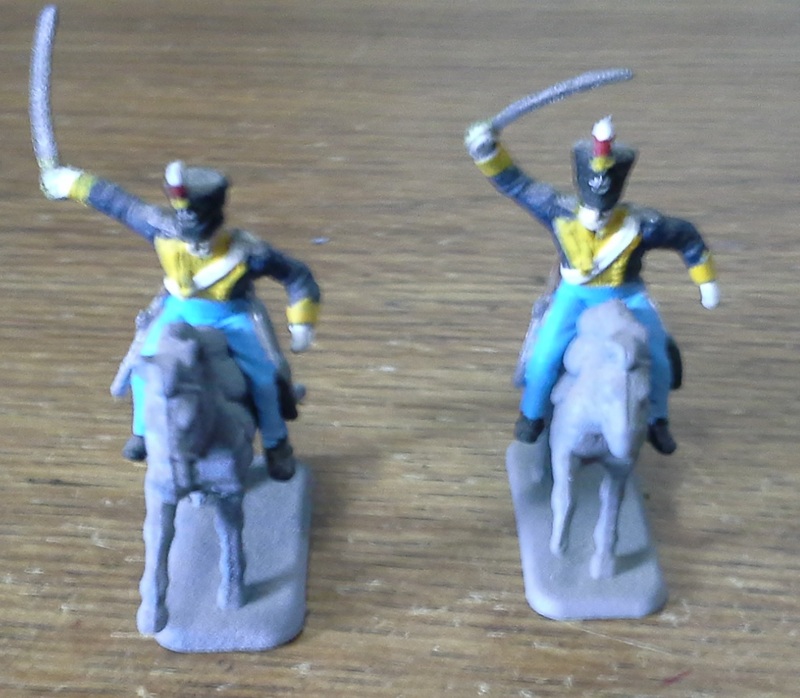 Silesian National Cavalry, converted from Italeri 6008 "French Hussars". 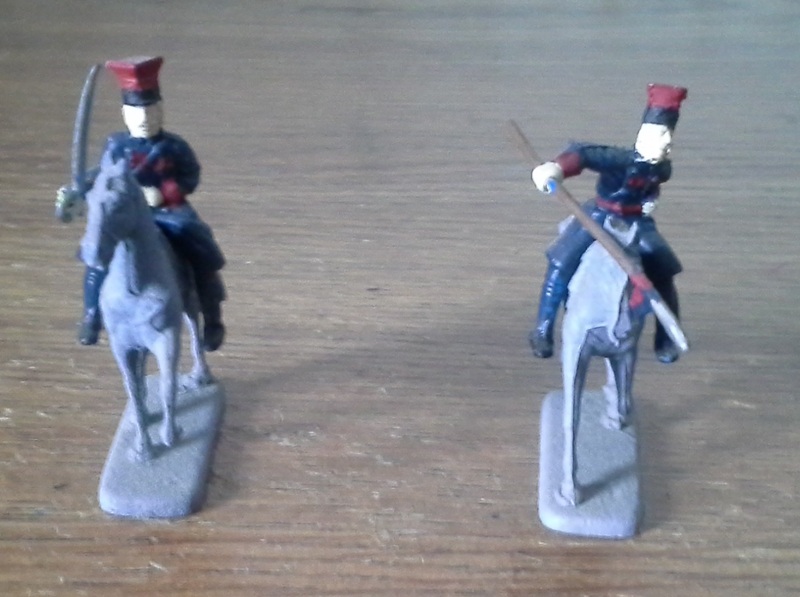 Russo-German Legion, converted from Esci 236 "Russian Grenadiers". 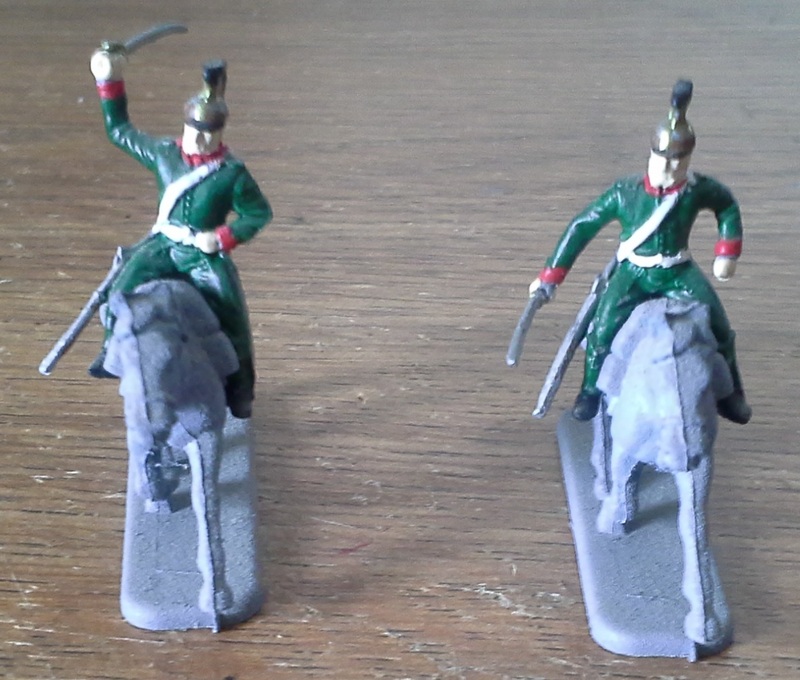 Russian Chevauxlegers early, converted from HaT 8012 "Russian Dragoons". 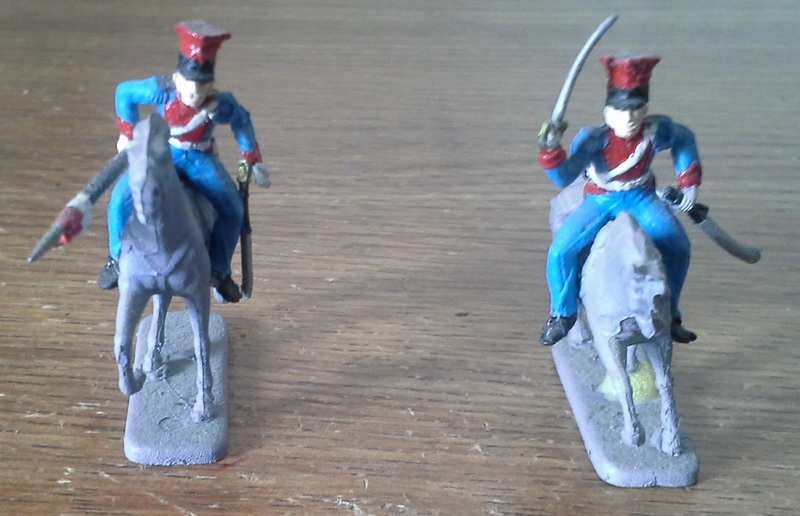 Russian Cuirassiers early, converted from HaT 8012 "Russian Dragoons". 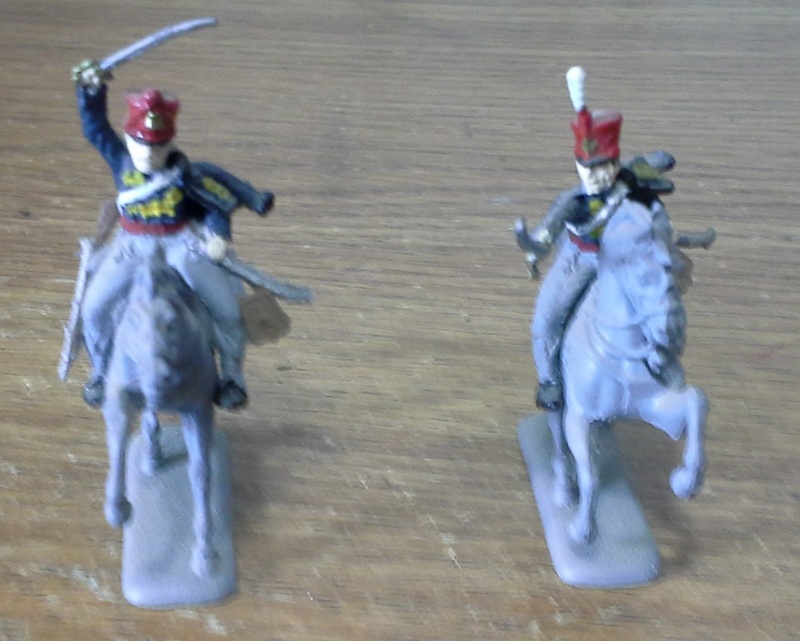 Russian Don Cossacks, converted from Esci 218 "Polish Lancers French Cavalry" with exra busby from HaT 8006 "Russian Cossacks". Russian St. Petersburg Cossacks., converted from HaT 8005 "Prussian Uhlans" with British Belgic shako. 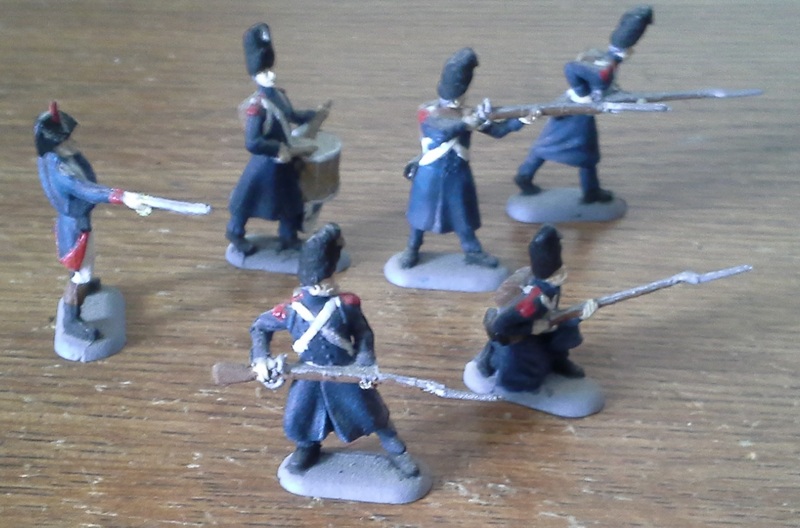 Russian/Polish Uhlans, converted from Strelets 015 "Russian Uhlans". 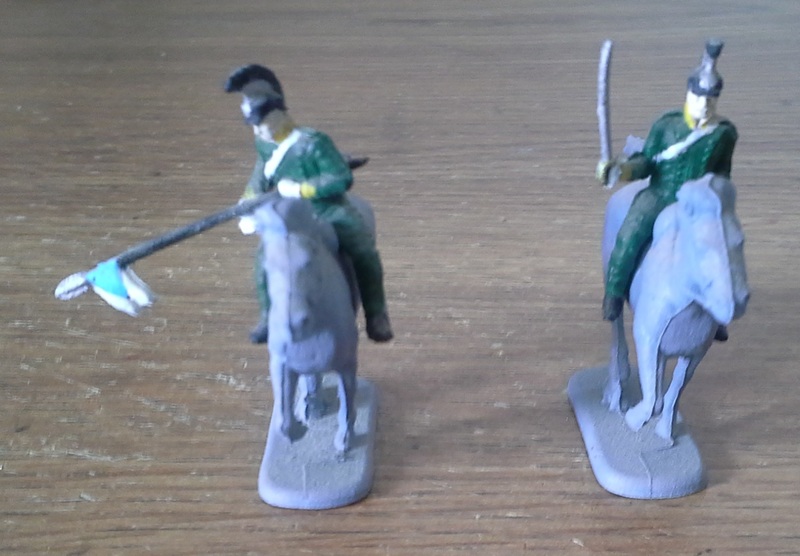 Russian Lithuanian Uhlans, converted from Strelets 015 "Russian Uhlans". 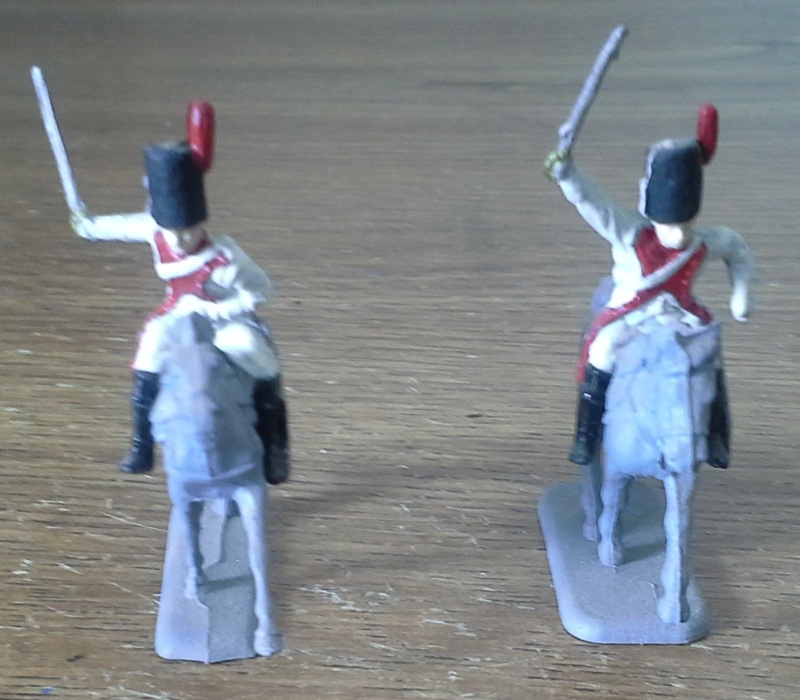 Russian Life Garde Hussars, converted from Airfix 1743 "Waterloo British Cavalry (Hussars)" with head from Esci 236 "Russian Grenadiers". 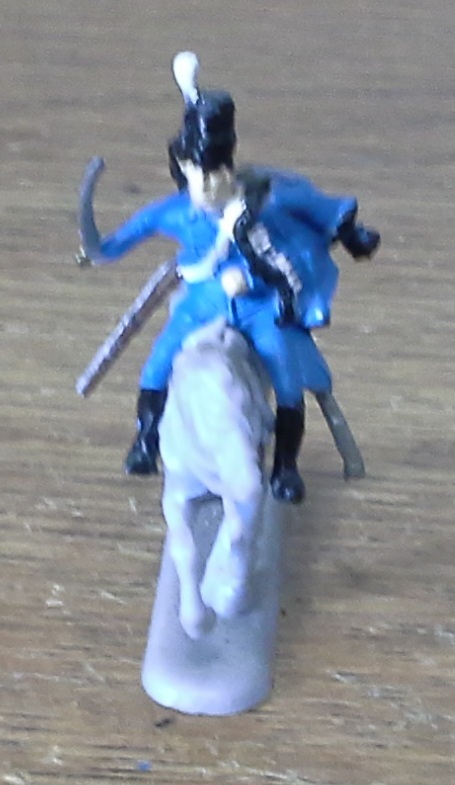 Russian Dragoon late, converted from HaT 8016 "Russian Cuirassiers".